In association with KOPF – Einfach Haushalt on their online store, a 13″ Lotus Rock roaster will now, from next month, be sold in Germany. This roaster will come attached with the professional/ forged Zurich side handles. This is an exciting development, because as explained here, a Lotus Rock roaster comes with many advantages for the serious cook that requires a pan that can be used all year round, and not just for Christmas. Not only is a Lotus Rock roaster highly durable, with excellent heat retention for a good all-round roast, it is unlike all other non-stick coated roasters metal utensil safe. Thus, whether you want to carve up a Turkey or cut up a lasasgne, this can all be done with a Lotus Rock roaster on the dining room table for easy convenience and improved safety. The non-stick function for Lotus Rock bakeware is quite unique: it is a non-greasy, durable non-stick. In the market place today currently consumers have the choice between stainless steel bakeware, which requires a lot of greasing, but which is very durable with high heat resistance; or silicone non-stick bakeware, which doesn’t require much greasing but is not very durable and does not have high heat resistance. With Lotus Rock bakeware, because of the silicon-oxide crystal coating, nestled within its rough, valley-like surface, a small amount of oil can be wiped into the permeable, lipophilic coating. With this type of coating technology a cake can be baked with good non-stick release for easy removal, while at the same time the cooking oil remains in the pan and not on the baked ingredients. With stainless steel bakeware, because the surface is polished and so quite flat, with no nooks and crannies for the oil to reside inside, a lot of oil will remain with the baked ingredients. This can be a disadvantage for some consumers who don’t like to add too much oil for health concern reasons. Another significant advantage of Lotus Rock is the non-stick release around the sides of the bakeware. For most non-stick coated pans the non-stick effect is generally best at the bottom of the pan, while at the side it is less potent. 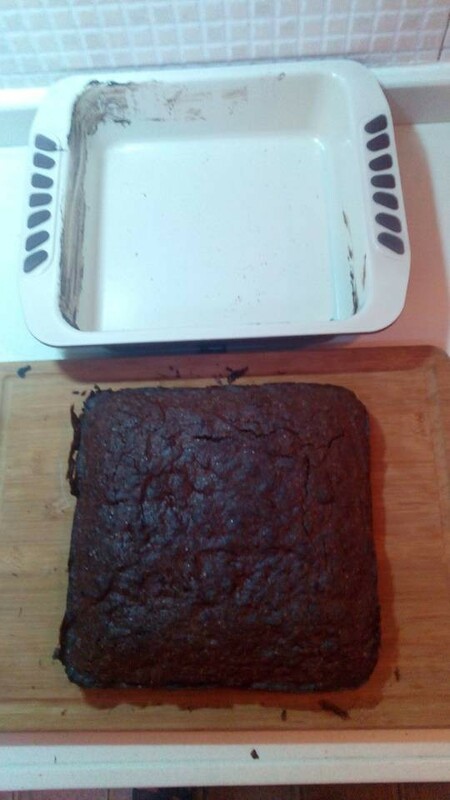 As shown in this phot, the chocolate cake has stuck at the side of the pan, but not at the bottom. If you want to get the whole cake or bread out of the pan in one piece, then sticking at the edge can adversely affect the appearance. With Lotus Rock on the other hand, the oil wiped on the pan provides non-stick release that is just as good at the side of the cake pan than at the bottom. 8“”9″ round cake pan ideal for layer cakes, fruit crisps, buns and more. 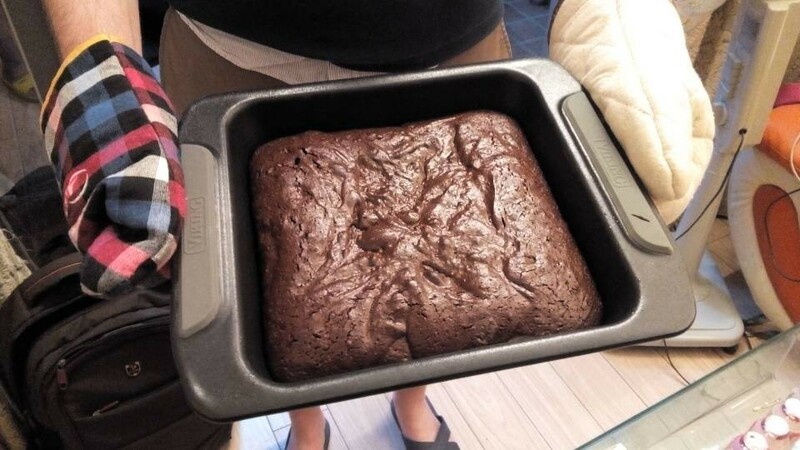 Versatile 8″ 9″ square cake pan is ideal for baking bar cookies, brownies and cakes. Hybrid ceramic coating is blended with a lotus-effect, lipophilic nonstick coating for easy release of every type of food, making it highly durable. Commercial-grade, heavy gauge steel distributes heat quickly and evenly for consistent baking results. Completely resistant to attack by sugars and other baking ingredients as well as cleansers. There have been a lot of technological advancements since the first non-stick pan appeared on the market in the 1960’s. 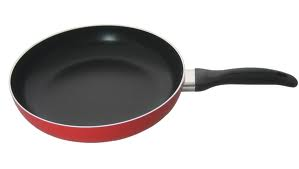 Yet, in spite of improvements such as adding reinforcing agents to non-stick coatings, and then later the development of ceramic sol-gel coatings, currently there is no cookware that can provide for the modern-day consumer both good non-stick release and at the same time high durability. 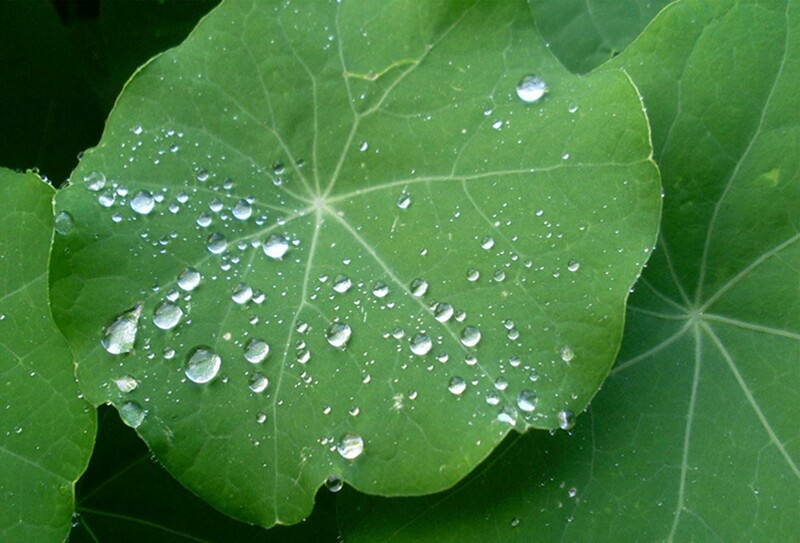 One type of durable, superhydrophobic coating that does exist is found in nature, it appears on plant leaves, such as a lotus leaf, and some insect wings. On every Lotus leaf there is a epicuticular wax coating that slightly sticks out from its surface. It has a size of 5-15 micrometers and this type of wax is possible to see through the lens of a microscope. However, what gives the Lotus leaf its particular potent water-hating properties is a layer of crystal wax that is a about 1 micrometer in diameter, which is positioned on top of the epidermal cell. It is this chemical and nano structure of the crystal wax which gives the lotus leaf its superhydrophobity. 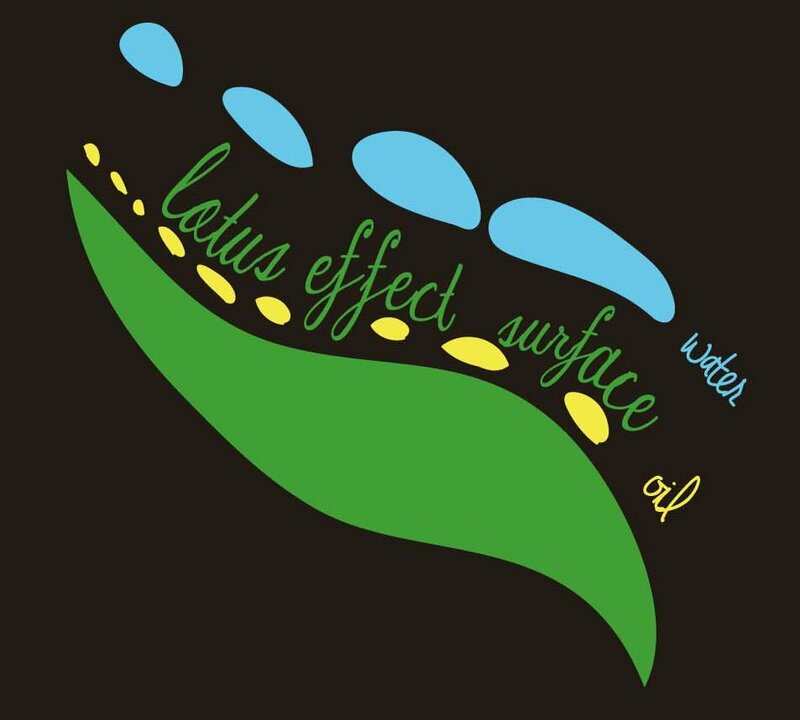 When water touches the surface of a lotus leaf, water droplets are formed because of the surface tension with the crystal wax. The area where water touches the crystal was is only 2-3% of the total area of the lotus leaf. If you tilt the leave’s surface, the rolling water droplets will adsorb the dirt and they will roll out of the leave’s surface together, hence it will be clean. 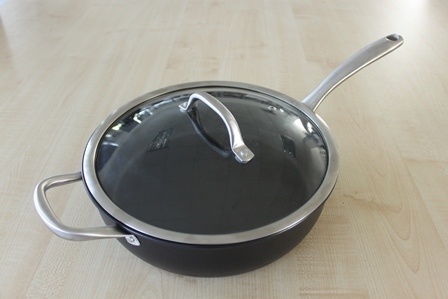 For Lotus Rock, instead of using fluorine atoms to produce a hydrophobic coating for cookware, like most coating manufacturers do today such as Teflon, the top layer of Lotus Rock is a silicon oxide crystal coating. 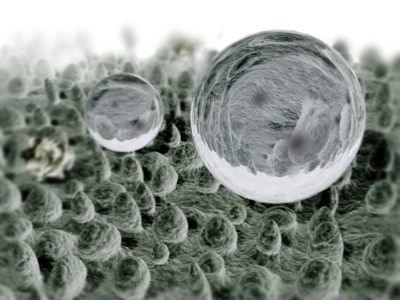 It produces the same water-repellent function as the Lotus leaf but without any fluoropolymers. The silicon oxide crystal coating copies the crystal structure of a real lotus leaf by using silica as the hydrophobic material. 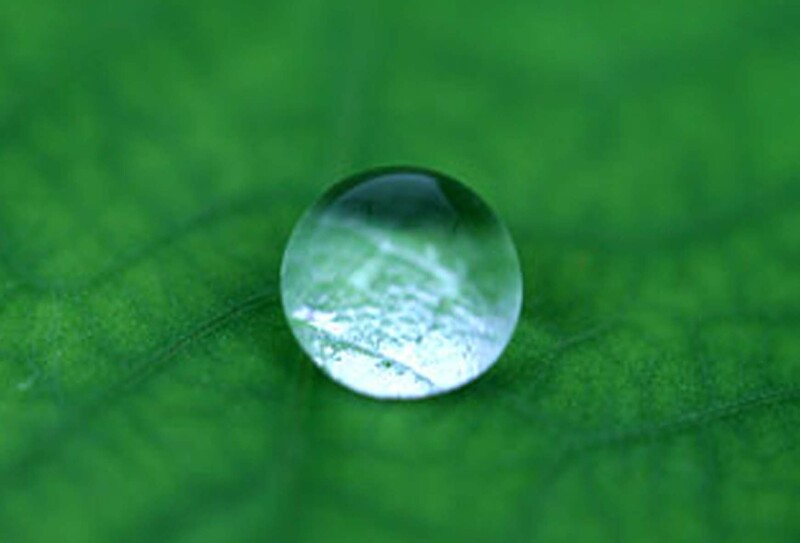 Just like with a lotus leaf, when water comes to touch the silicon oxide crystal surface, it will form water droplets because of surface tension. The nano-structure of the silicon oxide crystal improves the hydrophobic tendency because water touches only a small area of the coating surface, just like it does with the wax crystal on a Lotus leaf. In addition, the silicon oxide crystal coating also makes the dirt’s adhesion to lotus rock’s surface weaker, further improving the non-stick effect. To further improve the non-stick quality of the Lotus Rock surface the silicon-oxide crystal coating is also lipophilic = fat loving. For more information about this, please read here. 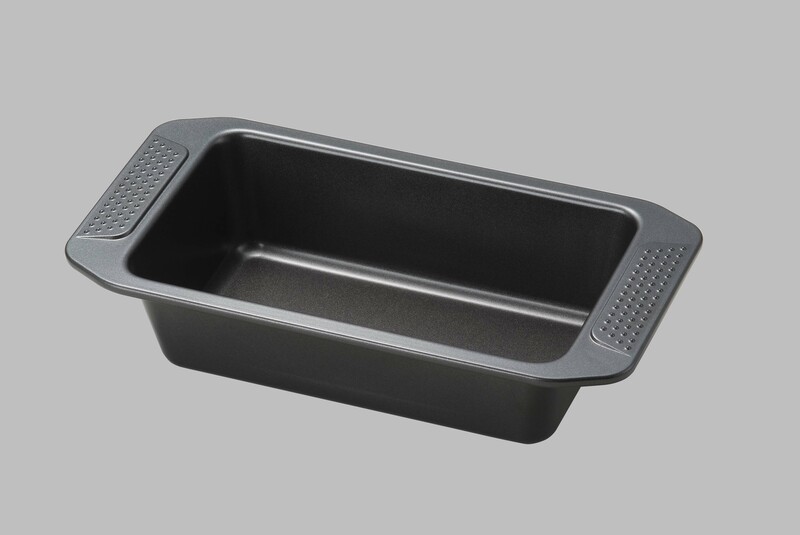 The heavy duty steel and thick, dark matte ceramic coating of Lotus Rock form the perfect material for a loaf pan. 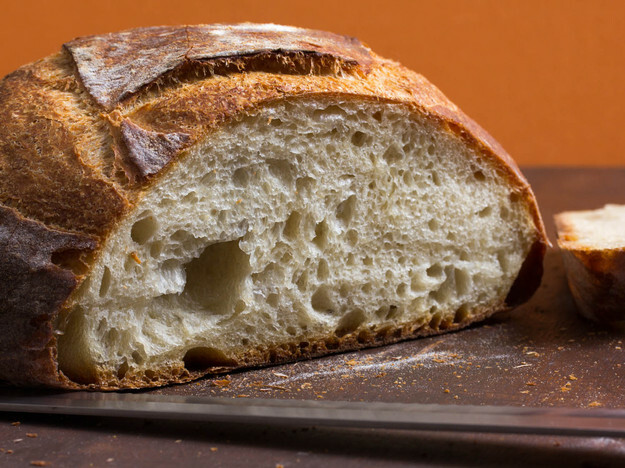 The thickness and dark colour trap high heat evenly inside the pan so that the Maillard Reaction can occur and impart a dark, golden crust on the bread for a perfect loaf. 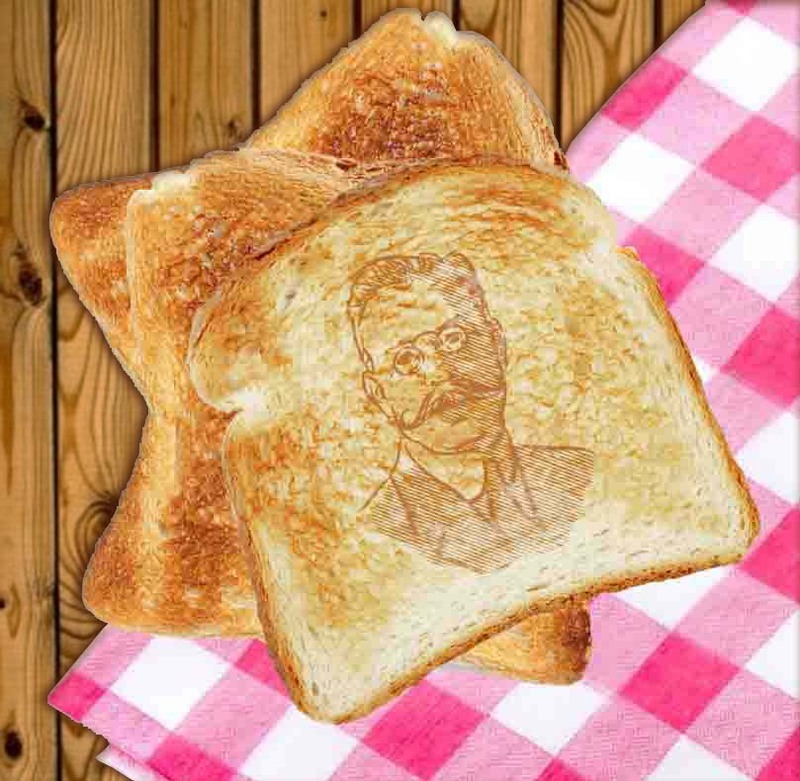 Also known as the browning reaction, the Maillard Reaction is the phenomenon responsible for giving bread a golden brown crust. It is named for Louis-Camille Maillard, a French chemist who studied the science of browning during the early 1900s. In simple terms, bread contains carbohydrates in the form of sugars, blended with amino acids in the form of proteins. As long as there is no outside catalyst, or cause for change, the bread dough remains white. 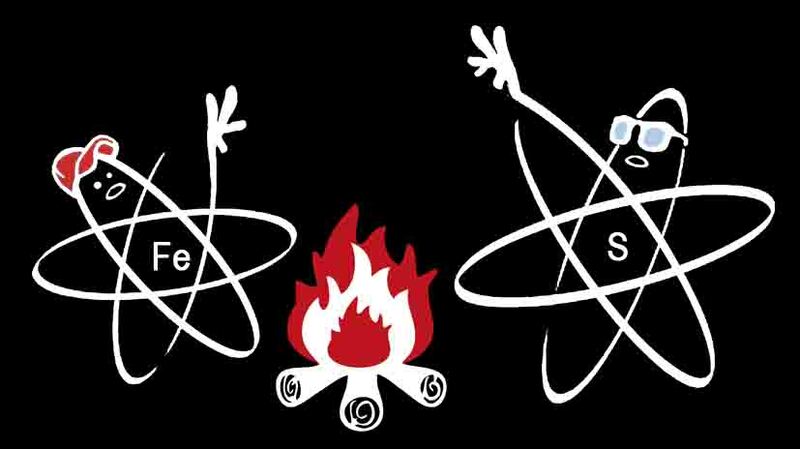 The Maillard reaction is the catalyst for change, primarily by the addition of heat. When bread dough is introduced to a hot oven, a complex chemical reaction occurs on the surface. The carbon molecules contained in the sugars, or carbohydrates, combine with the amino acids of the proteins. This combination cannot occur without the additional heat source, but more importantly, good, evenly spread browning better develops in a thick pan with a dark colour, such as a Lotus Rock loaf pan. Features lotus-effect, lipophilic nonstick coating for easy release of every type of food. Thermal shock resistant: can go directly from freezer to oven without peeling. Higly durability and resistance to rust and warping. Do you ever get tired of cleaning the inside of an oven? For instance, after roasting a chicken when splatters of oil or other liquids have nested inside the corners and edges of the oven interior. Or perhaps you live in an apartment which doesn’t have an oven and you can only fry or boil ingredients for a dish, and not also use an oven, like professional chefs do, for baking, roasting or just to use convention heat to cook through the final dish. Well, there is a solution to these twin problems, and that is the Lotus Rock Stove-Top Convention Cooker! The base is the foundation upon which all the other components of the stove-top convention cooker rest on. The sturdy, ergonimical construction of the base is essential not only for the durability of the product, but also for its high dry-heat cooking performance. The base has a circular open bottom to allow the heat from the gas stove to rise up towards and circulate around the food above it. In addition, there is an inner ring at the edge of the base for water to be added. This is particularly useful for grilling (as explaned below). 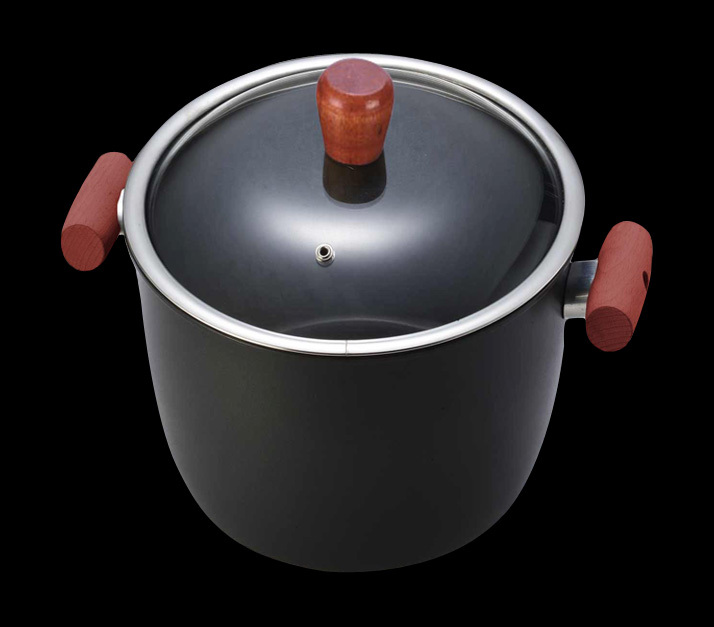 The addition of water in the base can reduce the temperature inside the cooking veseel, which can prolong the quality of the coating and material of the convention cooker. Made of heavy-gauge steel, the high strength of the tray makes it both highly resistant to warping from the gas flame below it, while at the same time strong enough to withstand the weight of heavy food, such as a Turkey, being roasted on top of it. Small, evenly punched holes at the edge of the tray allow heat to rise up and circulate evenly around the food for excellent dry-heat cooking. The tray is also very useful because other accessories can be added on top of it (as explained below) to increase the versatality of the cooking vessel. The last essential component of the stove-top convention cooker is the lid. The large, oval-shaped construction of it is essential to ensure there is enough room for hot air to circulate around the food for excellent dry heat cooking. Its spacious interior is also very useful if you want to cook food such as a turkey, which is quite often large in size. The knob is made of bakelite material which is stay-cool, thus the lid is easy and safe remove when necessary. 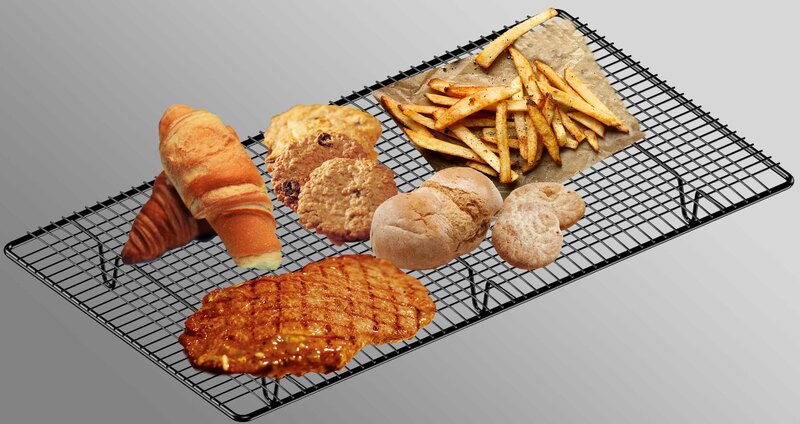 A useful addition to the stove-top convention cooker is a rack. By keeping meet such as chicken elevated above the tray, it is lifted out of its own juices. This has a few advantages for roasting, such as ensuring the bottom develops a nice and crispy crust, especially if a whole chicken is roasted with the skin still on. Another benefit is that the rack also allows the heated air to properly move around all over the meat and make sure the bottom gets cooked well, too. Last of all, the drippings which are left in the tray after roasting can be used to make a sauce to pour over the chicken for extra flavour. On the stove top, the heat from a gas flame can be quite intense and make the inside of the convection cooker hotter than it actually needs to be. One option mentioned above to reduce the detrimental effects of the high heat is to fill the inside of the base with water, which can reduce the temperature inside the convention cooker. However, one disadvantage of this method is that it might produce too much moisture inside and so limit the amount of browning that can occur on meat. So another option instead of water is to include a steel tri-pod inside the base that can reduce the rate of heat transfer and also spread the heat more evenly into the area within the lid above. 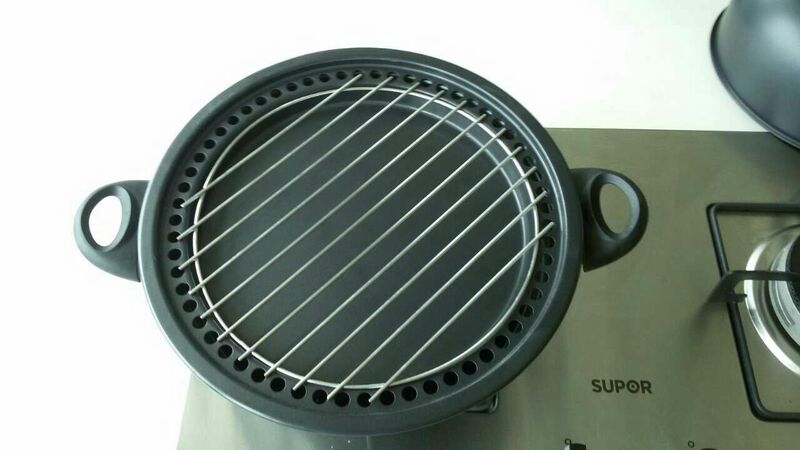 There is another accessory which can completely transform the use of this cooking vessell: this is the grill plate. With this accessory neither the tray nor the lid are necessary. The grill plate can be placed on the base to do Korean style BBQ cooking. Unlike with the rack described above, the thick ridges of the grill plate allow juices to flow to the edge of the plate and cascade through the holes into the ring of the base below. As mentioned previously, it is generally advisable to add water into the base when grilling to reduce the temperature and maintain the quality of the cooker for future usage. Lotus Rock stir woks, in association with Davis & Waddell in their Asia One range, have been sold throughout Australia for a number of years now. 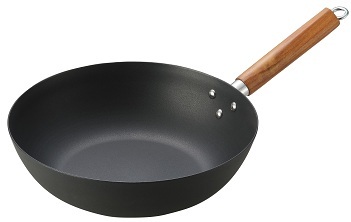 These woks come in 3 main sizes: 8″, 12″ and 14″. Lotus Rock stir wok are highly advantageous for an excellent stir fry, as explained here and here. 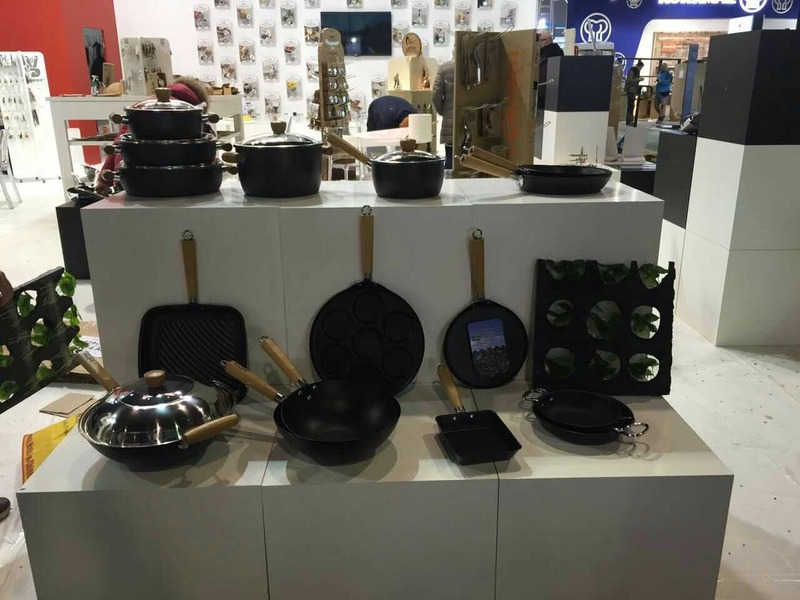 Since Lotus Rock stir woks have garnered such good reviews for cooking usage and general durability, and sold consistently well in a variety of different retail locations throughout Australia, this year Davis & Waddell have decided to expand the Lotus Rock range into other cooking utensils. These include a grill pan, two frying pans, a crepe pan and even a Blinis pan as well. Just like the stir woks, these Lotus Rock pans will still use the Acacia square wooden handle, which is soft-touch (especially useful when doing high heat cooking, which Lotus Rock’s material composition is highly suitable for doing), and riveted securely to the pan for a highly durable construction. A Lotus Rock frying pan is particular useful for high heat cooking, such as searing meat and vegetables, and then afterwards for making a delicious sauce. For information about the advantages of a Lotus Rock grill pan please read here. For information about the advantages of a Lotus Rock crepe pan please read here. 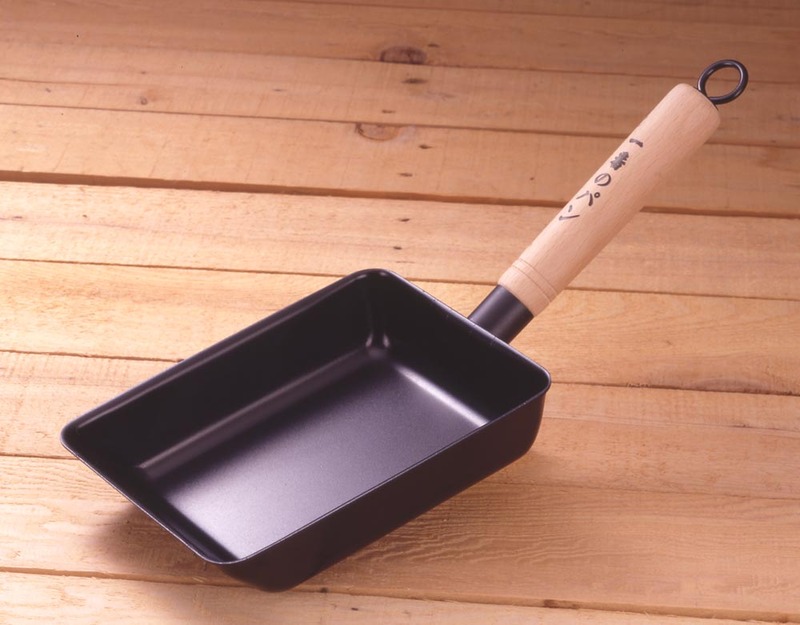 Quite often when a consumer considers the features of the coating for a Lotus Rock pan they might be impressed that it is metal utensil safe, or alternatively that it has very high heat and abrasion resistance. What they may not appreciate as much is the actual thickness of the Lotus Rock coating and the advantages that come with it. As you can see in the chart below, when compared to other commonly used non-stick coatings, Lotus Rock’s hard ceramic coating is quite considerably thicker. Even compared to a sol-gel ceramic coating, which is often advertised on the market for its strong, thick construction, the Lotus Rock coating is more than twice as thick. There are a number of significant advantages to a cookware utensil having a thick coating. First, it improves the heating effect of the pan. Most pots and pans on the market are either just a metal such as cast iron or stainless steel, or they have a metal substrate with a coating. For a cookware utensil the metal’s main purpose is for heat conduction; when the pan is heated the atoms within the metal lattice structure bounce into each other and thus pass on energy from the stove directly to the food. The two main benefits of a coating is to protect the pan from oxidation, and provide some non-stick release for easier cooking and cleaning. However, whether they are coated or not coated what a lot of these pans lack is the ability to retain heat within the pan. 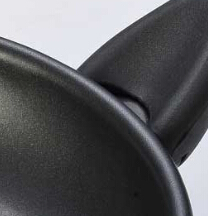 One way to improve the heat retention of a cookware utensil is increase the thickness of the metal, for instance, as explained here, Lotus Rock is made of heavy gauge 2.0mm steel, which with is highly dense carbon steel structure is much better than a metal such as aluminum at holding on to heat. But yet, with a Lotus Rock pan, its heat retention is further improved because of the highly thick ceramic layer of 100 microns on it. The thick ceramic layer acts as an insulator around the pan, which is highly beneficial for high heat cooking techniques such searing, sautéing, stir frying, barbecuing, and grilling that require a hot pan, which doesn’t suddenly drop in temperature when the food is added. Another important consideration which is often overlooked when considering the thickness of a coating for a pan is the exterior coating. A lot of cookware manufacturers, when they label that their pan has a coating thickness of 45 microns, often neglect to mention that this is only for the interior of the pan. Most often in order to save on cost, the exterior of cookware is sprayed with a silicone polyester coating, which is rarely thicker than 15 microns. This has very little effect on heat dispersion or retention for a pan and is purely there just to protect the pan from the atmosphere around it. With a Lotus Rock pan on the other hand, it has the same thickness on the interior and exterior of the pan. 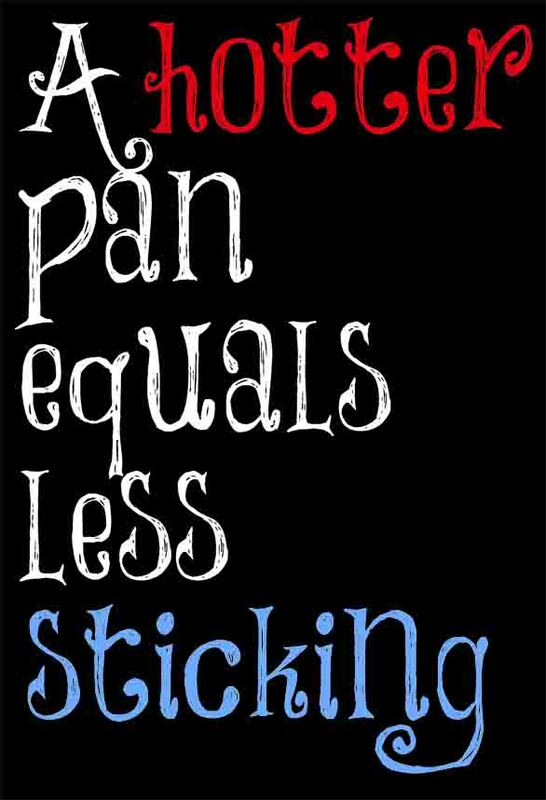 So quite often a general non-stick pan, when you add together both the interior and exterior coating, does not exceed a thickness of 50 microns. Whereas a Lotus Rock pan always has a thickness of around 200 microns, which is four times thicker than the average non-stick pan. 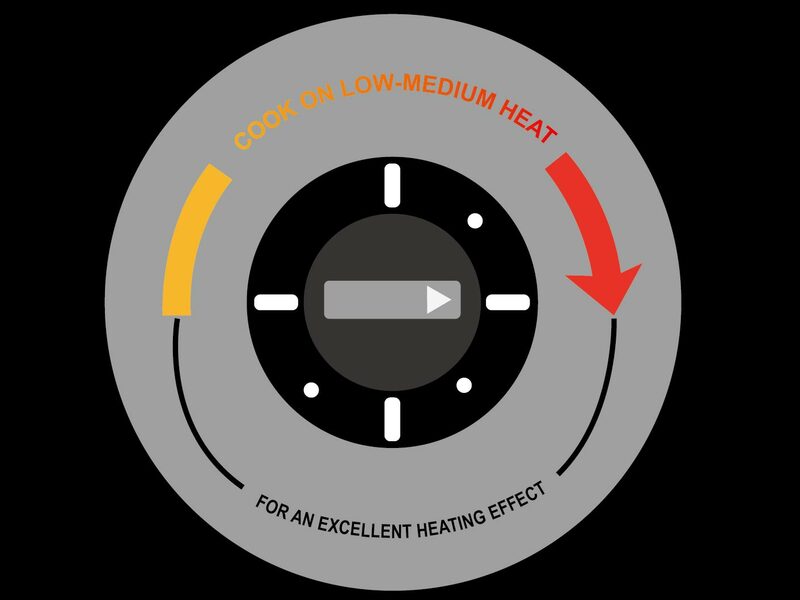 In addition to heat retention, a thicker coating is also advantageous for use with induction cooking top surfaces. This is because the main difficulty a lot of pans have with this type of cooking top surface is over-heating. Induction transmits heat incredibly efficiently, which for many pans can cause the metal to over-heat and deform. Or alternatively, the over-heating can cause burnt marks on the outside of the pan, or scorch the oil or food on the interior. In contrast, the thick exterior coating on a Lotus Rock pan can, because of its poorer electrical conductivity compared to a metal, slow down and disperse the heat travelling through the pan. Lastly, a thick exterior coating of Lotus Rock protects the pan from general cooking use much better than a pan with a silicone polyester coating. Whether from scratch marks during use on the sharp edges of a gas stove, or just general abrasion that might occur over time and thus erode the coating, a thicker coating will protect the metal substrate from exposure to the atmosphere for a longer period of time. 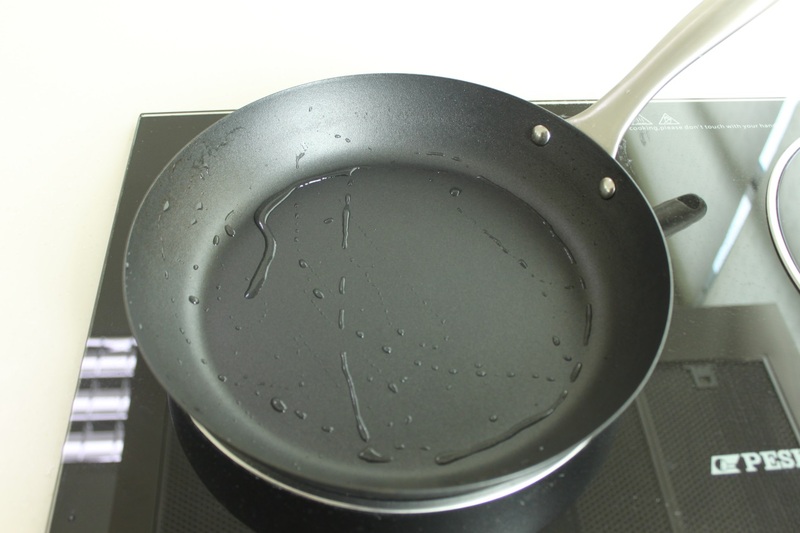 Lotus Rock FAQ #1 How do I remove oily marks and other stains from my pan? 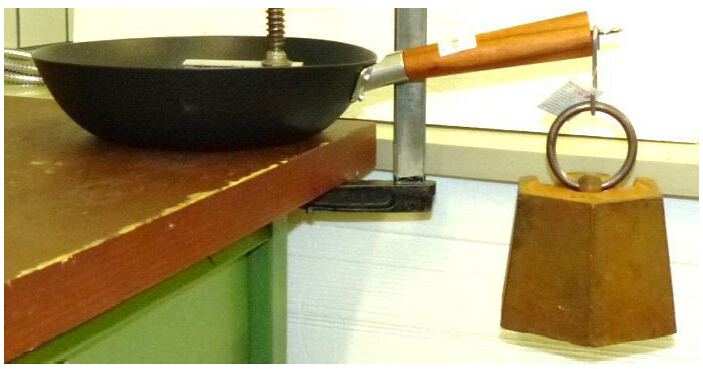 So far on this blog we have explained the various tests that are conducted to ensure that a Lotus Rock pan is safe and fit for purpose in a variety of domestic kitchens all over the world. Some of these tests are for the coating surface, some are for handles, and some are to check that the material composition of the pans contain no harmful substances or metals. However, in spite of all these tests there might still be some issues with a product which all of these tests cannot safeguard against. In fact, some problems can only be experienced and then later resolved once the product has actually been used by the consumer. One such issue, which some consumers of a Lotus Rock pan have mentioned, is staining on the coating surface. The reason this problem occurs on a Lotus Rock pan more often than, say, on either a non-stick or stainless steel pan, is that the coating surface of Lotus Rock is rougher and more uneven. As explained previously, these ‘valleys’ on a Lotus Rock pan surface are actually there for a very specific reason: to create a natural, durable non-stick surface. The silicon-oxide crystal coating is permeable to oil and rests in between these ‘valleys’. So the consumer can maintain the non-stick release of the pan regularly by wiping a small amount of oil on a Lotus Rock pan, just like they would do if they added oil to an uncoated steel or cast iron pan to season it. However, when consumers cook with a Lotus Rock pan occasionally other ingredients might intrude into these ‘valleys’. Or alternatively the consumer might use too much oil on the pan and the surface might then become too sticky. One particular advantage of a Lotus Rock pan which many consumers don’t fully appreciate is that it does have excellent abrasion and scratch resistance. Since the 1960’s when PTFE non-stick pans were first introduced, consumers have become accustomed to being careful about how they use and clean their non-stick pan for fear of damaging the non-stick surface. They will, for example, always use the yellow sponge side of a cleaning pad, and not the more abrasive green side. As explained, one of the significant advantages of a Lotus Rock pan is that it can be scrubbed and cleaned in a much more thorough and robust way than a general non-stick pan. Below is an example of a Lotus Rock which has some staining on the coating surface. 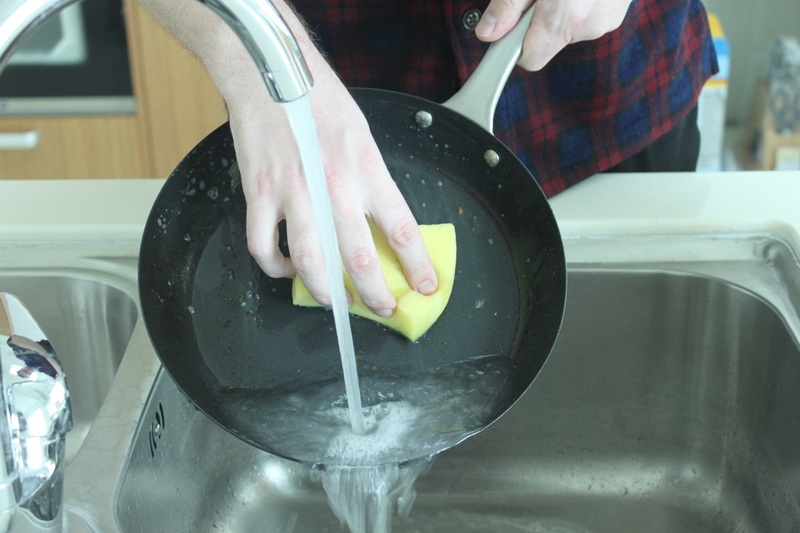 If either of the above two methods were used to clean a general non-stick coated pan then the pan could be made obsolete for further use: the coating could either peel off or crack. As you can see from the photo above, both methods cleaned this 34cm Lotus Rock paella pan with similar success. 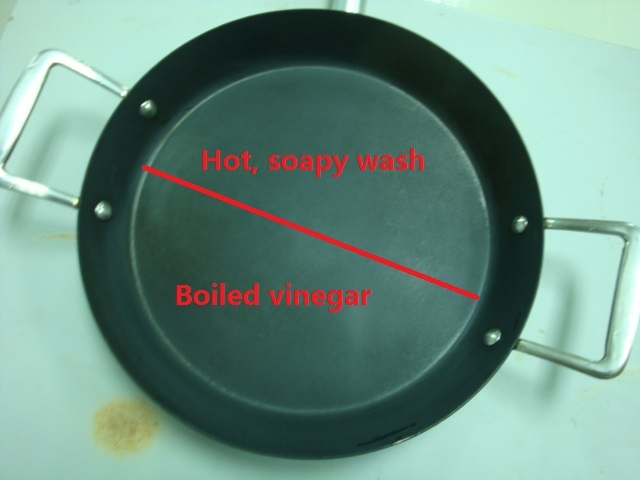 Although boiling vinegar over the pan did remove the staining, we would in most cases recommend just cleaning the pan with hot, soapy water and a general abrasive pad. If this does not remove all the staining, then the other option of boiling vinegar can be used. As many consumers have written in their reviews here, Lotus Rock has a number of significant benefits for cooking in a domestic kitchen. 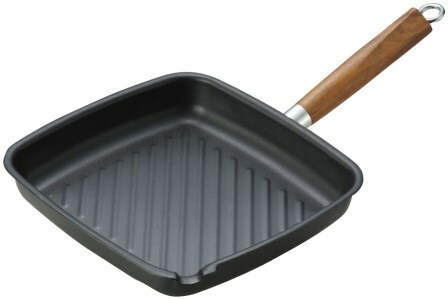 Some of these consumers mention about Lotus Rock’s excellent heating effect for pan frying, such as for chops, steak and frittatas; some like the weight of the pans – that they are heavy but not nearly as much as a cast iron pan; others love that they can use metal utensils without chipping off the surface; and some really appreciate that all Lotus Rock pans are induction safe. These are to name but a few of the benefits that come with using a Lotus Rock cookware utensil. However, it is highly probable that a number of these consumers enjoyed using their Lotus Rock pan because they had in fact done what many of us just don’t want to do and……..read the instructions first before use. 1. Hand wash in hot soapy water with a scouring pad. Put the pan on a medium heat setting and wait for all the moisture to evaporate. Once the pan is completely dry apply oil around the interior surface. For more information about this procedure please read here. 2. Transfers heat very fast. Pre-heat the pan on a medium-low setting, a little later add oil to the pan, and when it appears to be hot enough add the ingredients for cooking. For more information about this please read here. 3. Never leave your pan unattended while cooking. As the 2nd instruction states, a Lotus Rock pan heats up very quickly, much faster than most other standard materials used for cookware, so a pan should always be supervised while it is being heated on the stove. Quite often if this is not done then a white mark will appear on the pan. A Lotus Rock pan can still be used after this has happened, however some of the non-stick function from the silicone-oxide crystal coating would have been impaired beyond repair. 4. Always keep your pan dry when not in use. Primarily because of its extremely thick and strongly bonded coating, a Lotus Rock pan does have much better corrosion resistance than other coated carbon steel pans sold in the market today. However, if a Lotus Rock pan is stored in a very moist condition, or if it is left to soak in a sink for an extended period of time, then the likelihood of rust developing is much more likely. In fact, a Lotus Rock can technically be used in a dishwasher, but it is not recommend for two reasons. Firstly, as pointed out in the 4th instruction, although a Lotus Rock pan does have a very thick coating, the intensity and duration of a wash in a dishwasher will increase the likelihood of rust (especially along the edges of a pan). Second, dishwasher use may gradually impair the quality of the silicon-oxide crystal coating, which is an essential component for the non-stick release of a Lotus Rock pan. There is another very useful use and care instruction for a Lotus Rock pan which is not often included on the packaging because of its complexity and the lack of space available: this is to re-new the non-stick effect of the pan. For information about this please read here. 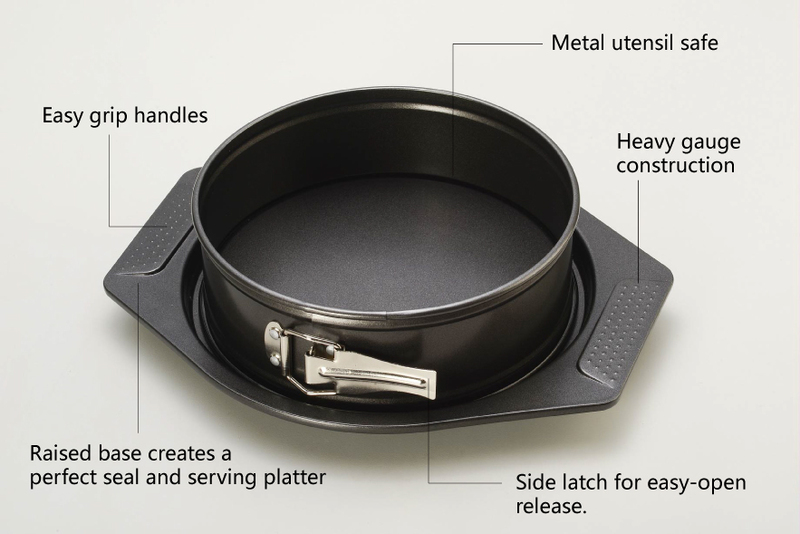 One of the significant benefits of a Lotus Rock pan is its special suitability for high heat cooking. Unlike a general non-stick pan, a Lotus Rock pan is excellent for pan-frying, grilling, stir frying, and sautéing on a high heat to develop a delicious, brown crust on meat, fish and vegetables. 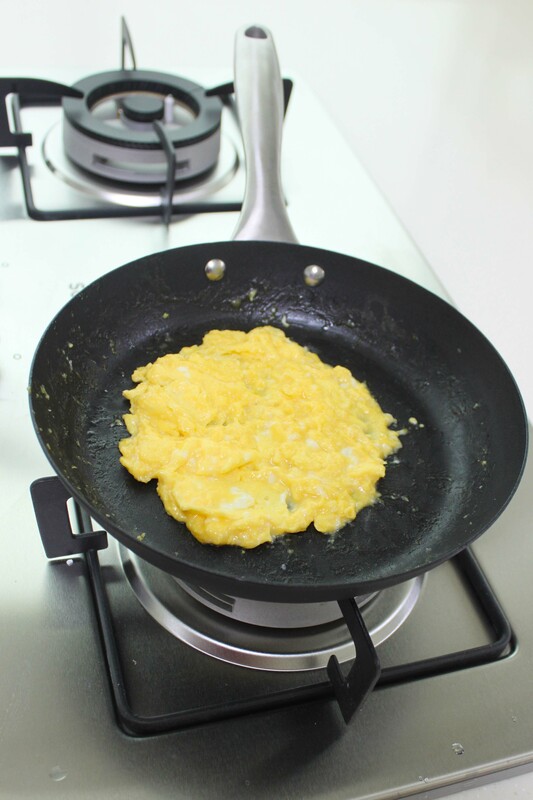 However, for some popular dishes such as scrambled eggs, the browning reaction is exactly what you do not want. If scrambled eggs are cooked this way then they will be tough and rubbery, rather than soft or fluffy. So since the Lotus Rock material construction is highly suitable for high heat cooking, does that make it impractical for the type of low temperature cooking that is needed for scrambled eggs? The straight answer to this question is an emphatic no, but in order to cook soft and fluffy scrambled eggs with a Lotus Rock pan a different type of cooking approach is needed. In fact, it is necessary to think more like a professional chef. In a restaurant kitchen, time and efficiency are of the utmost importance. It is for this reason that professional chefs often develop cooking techniques that make it possible to create some popular, well-known dishes in half the normal time, yet which taste just as good or, because of higher moisture or vitamin retention, even more delicious or healthy. Currently one of the most famous professional chefs around is Gordon Ramsey, the presenter of the popular television series Kitchen Nightmares. In this video clip Gordon decides to cook a delicious breakfast for his wife who is still in bed upstairs. However, just like all professional chefs, he wants to cook the scrambled eggs quickly, partly to save time, partly so it can be eaten while still warm with sautéed mushrooms, tomatoes, and toasted bread. So rather than just use the standard cooking technique for scrambled eggs, which would be to use an aluminum non-stick coated frying pan to cook the eggs slowly until they form curds, he develops a different approach. Not only does he use a different material for the pan, stainless steel, but instead of just leaving it on the stove, he continually moves the pan to the counter top and back to the heated stove, stirring the eggs thoroughly throughout. The advantage of not heating the eggs continually is that they do not get over-cooked and tough. At the same time the high heat retention of stainless steel means that the pan does not get too cold while it is on the counter top, and so there is a reduced chance that the eggs will uncurdle and break up. When cooking scrambled eggs with a Lotus Rock pan it would be advisable not to copy Gordon Ramsey’s cooking technique in its entirety because, although carbon steel, the substrate of all Lotus Rock pans, does have similar heat retention qualities to stainless steel, it also has a different rate of heat conductivity, which requires his technique to be modified slightly. Before adding any ingredients, pre-heat the pan at a very low temperature to allow the heat to be absorbed into its highly dense structure. Then turn the heat off and leave the pan to cool for about 10 seconds before adding the egg mixture, using a spatula to keep moving it from the outer part of the pan to the centre to allow as much of the mixture to cook evenly as possible. If during cooking you feel the pan has cooled down too much and the eggs are not coagulating as they should, return the pan to the stove to add some extra heat. Another way to prevent overcooking is to add milk or sour cream to the eggs when whisking them together. Or alternatively, copy the Gordon Ramsey approach and add crème fraiche towards the end of the cooking to help cool the temperature of the eggs down. So in conclusion, scrambled eggs can be cooked to perfection by removing a Lotus Rock pan from the heat source before adding the egg mixture, and by including another ingredient such as milk to slow the cooking process down. These soft and fluffy scrambled eggs can then be added to other ingredients for the perfect breakfast or entrée. However, some of the benefits listed above require the ‘use and care‘ instructions for Lotus Rock to be followed – if not the pan will not perform to its optimum ability and performance. Without a doubt one of the most important instructions for using a Lotus Rock pan is to “Use a low-medium heat setting”. Many pots and pans produced in the market today are made with aluminum. One of the advantages of aluminum for cookware is that it conducts heat very evenly; however it is not generally used for professional-style cooking because it has very poor heat retention. Its efficient heat conduction, along with its low density, means that aluminum has a low heat capacity, i.e. it loses heat very quickly. Consequently a medium-high heat setting has to be used in order to keep aluminium pans as hot as possible during cooking. Lotus Rock, on the other hand, has very different thermal qualities to aluminum. The metal substrate for all Lotus Rock pans is carbon steel, which conducts heat less evenly than aluminum. 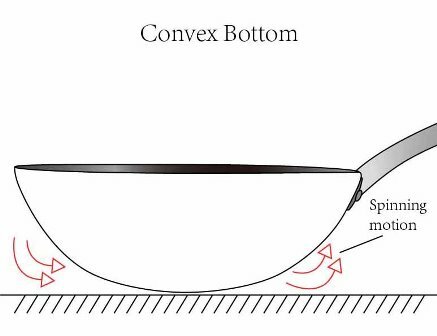 As explained in this blog post, if a carbon steel pan has a thin gauge then most of the heat will be distributed to the centre of the pan. However, a Lotus Rock pan has a very heavy gauge, along with the thick ceramic layer on both the interior and exterior of the pan, which causes the heat to be distributed more evenly. Below are some reviews that consumers in the USA have written above the heating effect for Lotus Rock pans. The thermal properties of aluminum and carbon steel can be imagined as a bucket of heat with faucets dumping heat into and draining heat out of the bucket. Aluminum with its high heat conductivity has large faucets letting a lot of heat into the bucket, but also a lot out of it. However, because it is not very dense it cannot hold much heat so the water travels through the bucket quite quickly. Carbon steel, on the other hand, has a lower heat conductivity and so has smaller faucets. But it does have a larger heat capacity so it can contain more water. 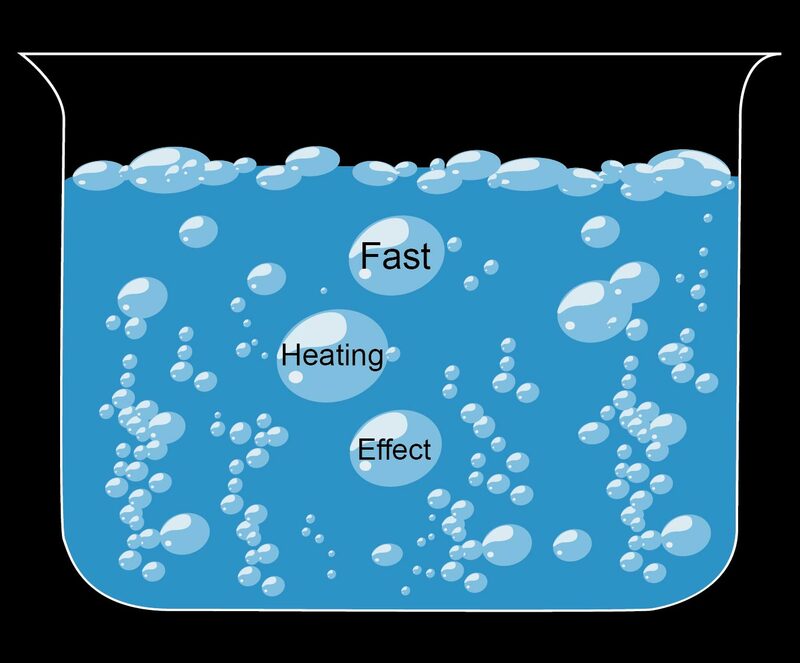 Therefore the water, just like the heat going through the pan, takes longer to get through and out of the tank. But even with its heavy gauge and thick, hard ceramic layer, if a Lotus Rock pan is put on a medium-high heat setting then it will not distribute heat as evenly as an aluminum pan. For a Lotus Rock pan to distribute heat evenly it needs to be put on a low-medium heat setting, so that the pan has the necessary time to build up and retain the heat inside it. It is true that even at a high heat setting a Lotus Rock pan will distribute heat around itself better than a pan with a thin gauge, but it will still be hotter at the centre than at the side of the pan. Overheating a Lotus Rock pan has two other main disadvantages. First, there is a risk of warping the pan, causing it to spin motion on a flat top cooking surface, or, if, the centre of the pan will rises higher than the sides, preventing oil spreading evenly over its surface. The second disadvantage of over-heating is scorching. If the oil or other small ingredients are over-heated then they can cover the silicon-oxide crystal coating and cancel the non-stick effect. 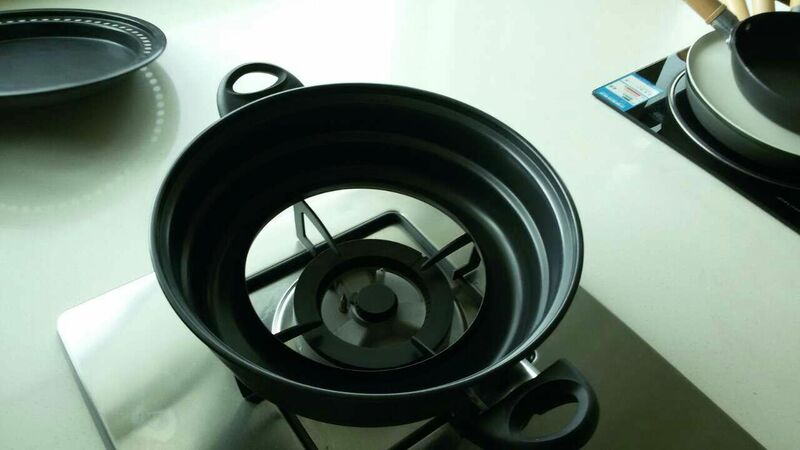 Therefore, it is essential for a Lotus Rock pan to be used a low-medium heat setting, to allow a slow heat buildup into the pan’s highly dense structure. 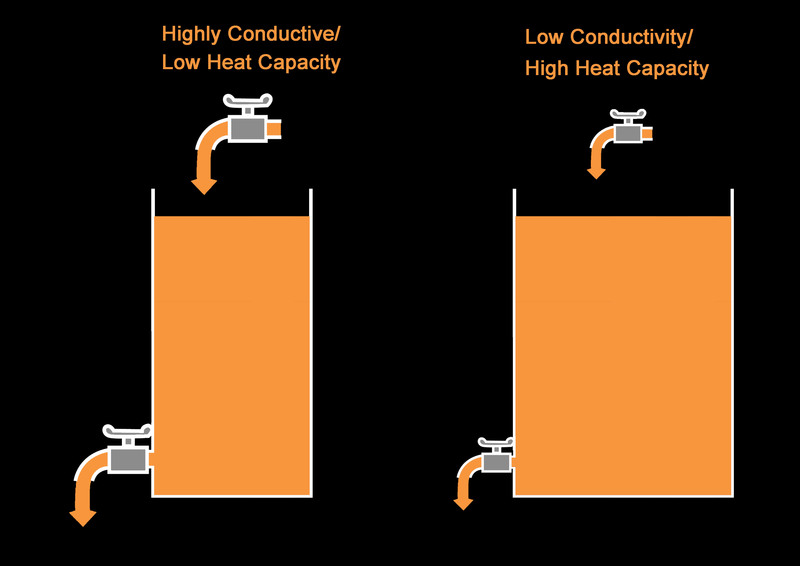 As explained above, unlike an aluminum pan, Lotus Rock has high heat retention even at a low heat setting. Heat from the stove top will not easily escape to the atmosphere or be drawn into ingredients on the pan’s surface. 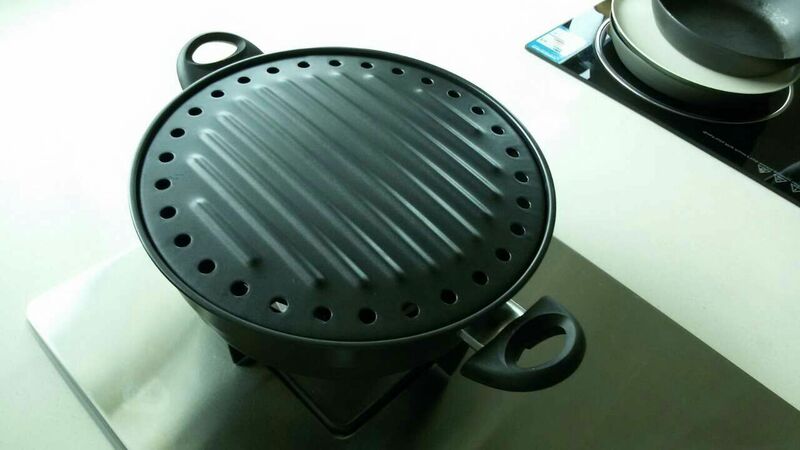 Therefore, for an excellent heating effect and to maintain the high quality of the Lotus Rock pan, it is essential to always pre-heat at a low-medium temperature. Remember: keep the heat down! A Lotus Rock roasting pan is highly versatile and extremely durable. Instead of just using it twice a year for special occasions such as Christmas or Thanksgiving, a Lotus Rock roasting pan can be used to roast, bake and sear a variety of dishes all year round. Not only can it be used to bake kitchen favourites such as lasagna, and maccorini & cheese, but a Lotus Rock roasting pan can also be used to make delicious gravy on the stove top. Its versatility is such that you don’t even need to worry about which type of stove top you can use it on because Lotus Rock is compatible for induction and all other typs of cooking top surfaces. Lotus Rock’s heavy gauge steel construction, along with a highly thick interior and exterior coating make it a very durable pan, which is especially suitable to withstand the constant wear and tear of a roasting rack sliding back & forth in a highly grease stain environment. 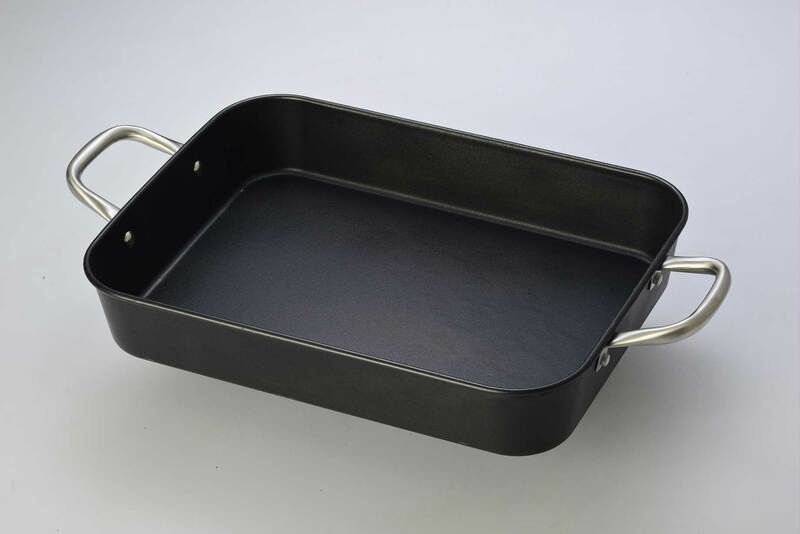 The thick, black matte construction of Lotus Rock also ensures the roasting pan heats evenly, with no hot spots, for an excellent heating effect for golden brown potatoes and much else. So the next time you consider to purchase a roasting pan, remember it doesn’t just have to be for Christmas, it can be a pan for life! Durable Lotus Rock construction stands up to the intense heat of your oven, stove-top or grill. Large stainless steel handles are easy to grasp even when wearing grilling mitts. Made with a durable, hard ceramic coating with a silicon-oxide crystal PFOA/PTFE-free, natural nonstick surface for easy food release and cleaning. Nonreactive cooking surface is ideal for deglazing pan and making gravies and sauces on the stovetop. As previously explained here, for best use a Lotus Rock pan should be pre-heated at a low-medium temperature. This way the pan will build up heat within its highly dense structure more gradually and evenly than if it is heated on a high flame immediately. Similar to cast iron, when a Lotus Rock pan has a lot of heat stored in it, the pan will brown, saute, grill, and stir fry food much better than if the food is added when the pan is still cold. High protein content food, such as steaks, stick during cooking when the sulfur atoms in the protein react with the metal atoms in the pan, forming a strong chemical bond and fusing the meat to the skillet. 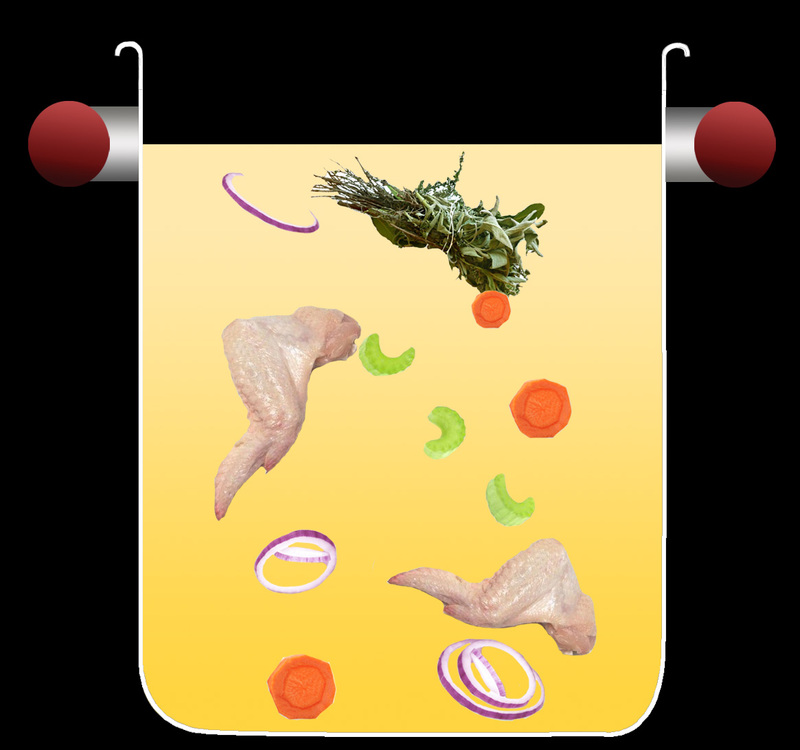 Once the pan becomes hot enough, the link between the protein and the metal will loosen, and the bond will eventually break. A Lotus Rock pan is ideal for searing highly stick-prone food, such as a steak, because it can be pre-heated to a high temperature without damaging the pan’s non-stick performance or pan’s construction. Most general non-stick cookware is organic-bonded and so can easily break under a high temperature. If a non-stick coating is continually over-heated then it will either quickly start to degrade (such as peeling off or blistering), or if it contains PTFE for its non-stick release, a hazardous chemical smoke may appear which has been proven to be fatal to birds. One of the first fundamental skills which any professional culinary student learns is how to make a delicious stock. Not only is making your own stock extremely rewarding, it will taste better and be healthier than anything you can buy. Often dubbed “liquid gold”, a well-made gelatinous stock is what enables chefs to make those restaurant quality sauces. A Lotus Rock stock pot comes with a heavy-duty bottom. Not only does this make the pot extremely durable, it delivers even, controlled browning, which is essential for cooking dishes such as chilli. 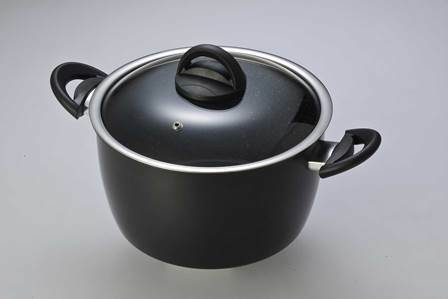 The Lotus Rock Stock Pot is produced with a diameter of 24cm and with a capacity of 7.40QT. A Lotus Rock Baking Sheet isn’t just for baking cookies, it is a Kitchen Workhorse. Cooking enthusiasts might reach for a rimmed baking sheet many times a day. For such intense usage a pan that cannot be twisted and doesn’t warp easily is essential. The most common problem with a baking sheet is warping due to its long length. A Lotus Rock Baking Sheet is made of heavy gauge steel, which can withstand frequent, daiily use and still be highly resistant to deformation. 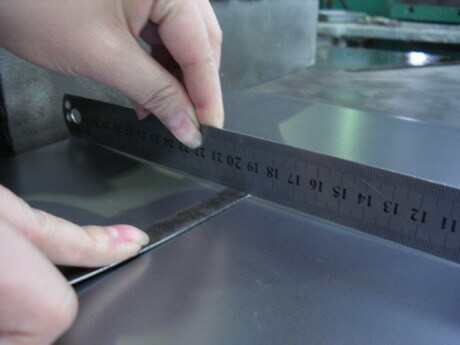 A simple ruler test can be done to judge the concavity of the baking sheet. Turn the pan over and set the ruler on top. Normally, if another ruler can be placed underneath, while at the same time touching the ruler above it, then the concavity is about correct. 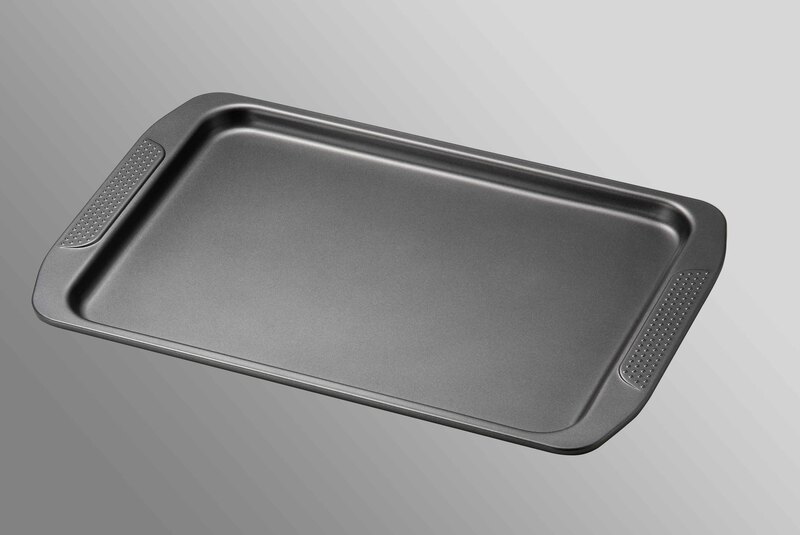 The Lotus Rock Baking Sheet is produced in 3 different sizes: 13″, 14″, & 17″. Combination Cooking involves both dry and moist-heat cooking. This type of cooking method requires long, gentle cooking to turn tougher cuts of meat into those fork-tender dishes that we often refer to as “comfort foods”. A Lotus Rock Braiser is best used for recipes which require meats or vegetables that need to be seared quickly in the open pan and then covered with a lid to cook slowly in their liquid (either in the oven or over the stove). 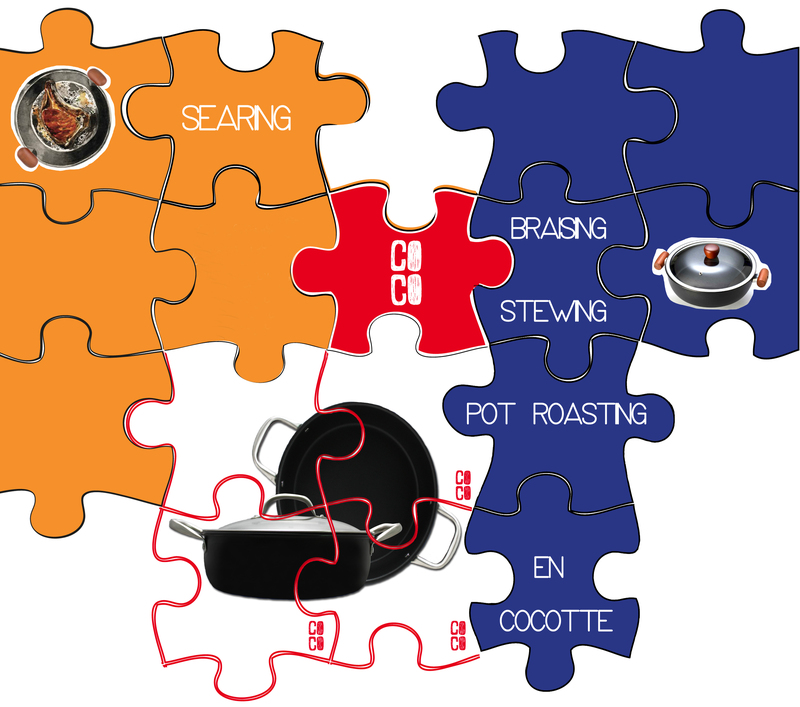 Popular combination cooking techniques used with this pan after searing include braising, stewing, pot roasting and en cocotte. 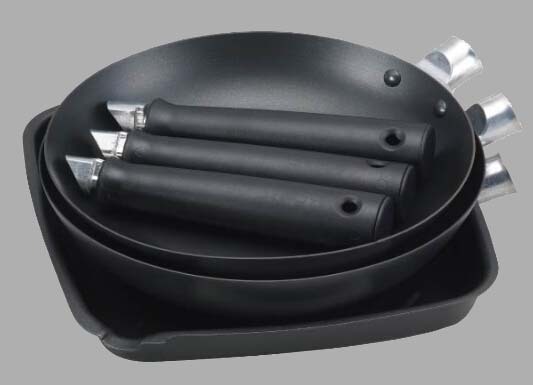 The Lotus Rock Braiser is produced in 3 different sizes:24cm (2.54QT), 26cm(3.49QT), and 28cm (4.33QT). Moist-heat cooking uses water or steam to emphasize the natural flavor in foods. As previously explained here, a Lotus Rock Stir Wok can be an excellent way to steam a variety of seafood or vegetables. Conversely, for a submersion method of cooking, such as boiling, then either a Lotus Rock Sauce pan or Casserole is particularly good. 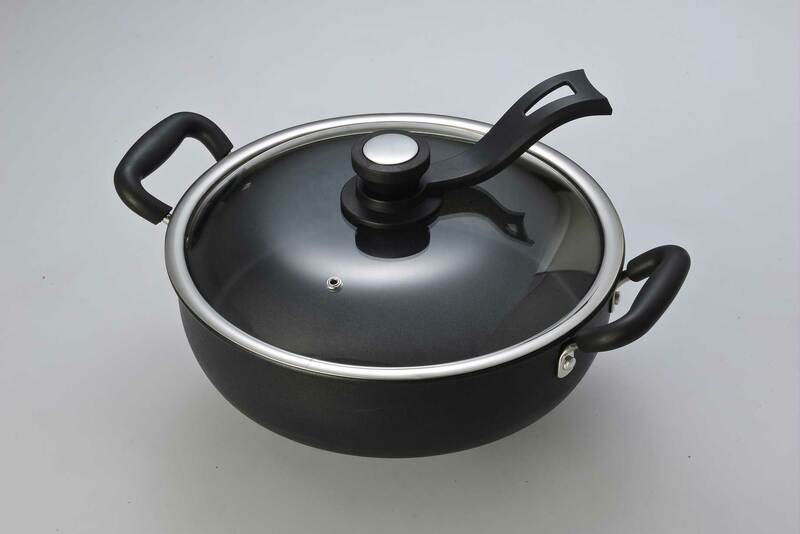 The fast heating effect of the carbon steel substrate in a Lotus Rock Sauce pan and Casserole can reach the boiling point in water quickly. Cooking food within the rapid movement of bubbles in water, as they churn upwards to the surface, is an excellent cooking method to preserve the colour and nutrient content of some ingredients. In contrast, if certain types of ingredients are cooked for too long in water, such as through poaching or simmering, then they can either be discoloured or become quite mushy. 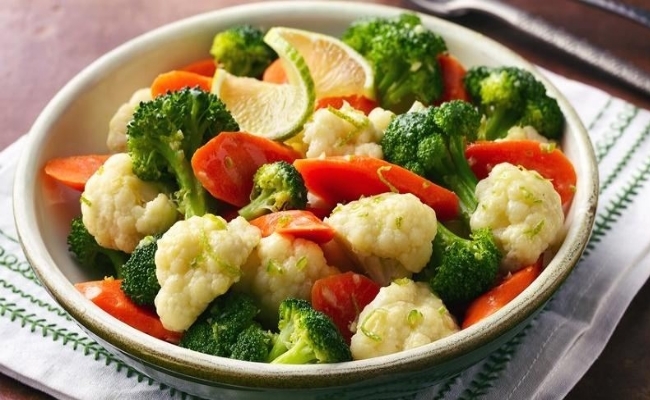 A quick boil of some vegetables, such as through Blanching or Parboiling, is also very useful if you want to prepare them for cooking later or for making an appetizing Crudite. Alternatively, boiling can also be used to re-heat vegetables instead of using the microwave. 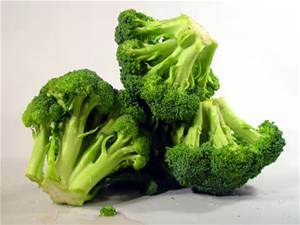 Green vegetables, such as Broccoli, Asparagus, and Green Beans, contain the pigment Chlorophyll, which is very sensitive to heat. If these vegetables are cooked for too long they will suffer major colour loss. The fast heating effect of a Lotus Rock Sauce pan or Casserole is the perfect utensil to preserve the pigment of green vegetables. A quick boiling in water not only maintains the flavour and colour of the vegetables, but also produces the desired texture too. 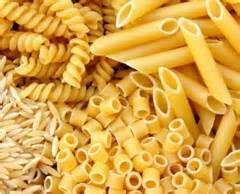 In addition to some vegetables, other types of food such as pasta also require water to be rapidly boiling while it is being cooked. This is so the pasta moves freely, cooks evenly, and so it doesn’t stick together. The fast heating effect of a Lotus Rock saucepan can ensure that the pasta is always cooked this way for a perfect ‘al dente’ crunch. 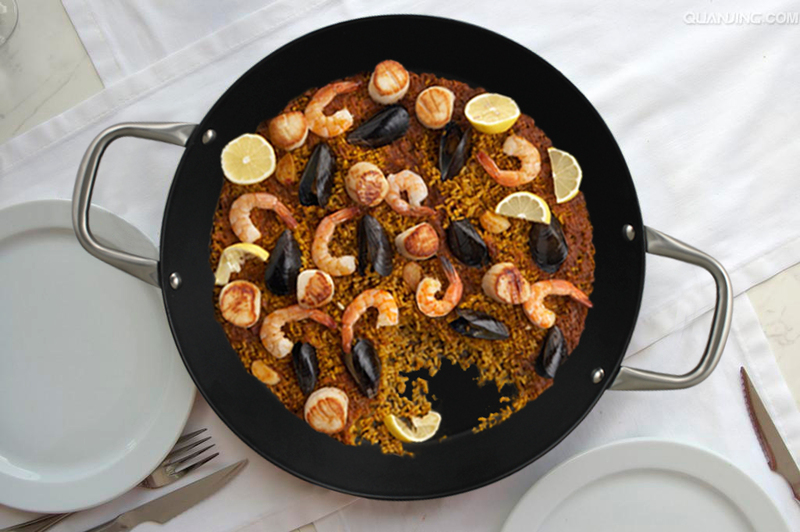 Well-designed paella pans encourage the formation of a light crust of rice on the bottom of the pan. In Spanish this is known as Socarrat which means lightly toasted. 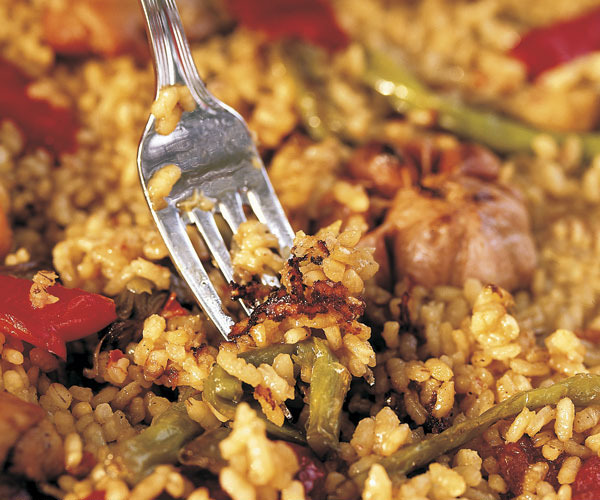 This is the most prized part of a Spanish paella and can only be achieved with a paella pan. The secret is to increase the heat during the last 3 minutes or so of cooking. If you listen carefully the rice will begin to crackle slightly. Take the paella off the heat when this happens in case it begins to burn. The objective is to get toasted rice on the base (which has a nutty aroma) rather than burnt rice. A Lotus Rock paella pan is perfect for achieving Socarrat. This is because without oiling the surface of it rice can stick to the pan and then the delicious, caramelized crust can be formed. Non-stick pans on the other hand are not ideal because they don’t allow rice to stick to the bottom and for Socarrat to form. The standard way to check if Socarrat has been formed or not is to insert a fork into the rice, if a slight resistance is felt just before the fork reaches the base of the pan then a layer of Socarrat exists. General non-stick pans might be easily damaged while checking for Socarrat as the sharp edges of a metal fork penetrates the bottom layer of the rice and scratches the coating. 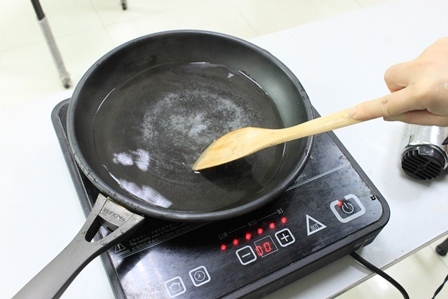 However, with a Lotus Rock paella pan this test can be done without fear because the highly durable, thick ceramic coating is metal utensil safe, with excellent scratch resistance. 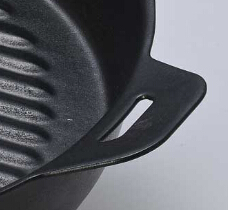 A significant benefit of using dual sided steel handles with the Lotus Rock paella pan is is to increase its versatility: for use not only on the stove, but also for over the grill and in the oven, with an oven-safe temperature to 650 F. Restaurant chefs quick sear ingredients with carbon steel pans to develop a brown crust, and then slide them into the oven to cook through the interior for a moist, juicy finish. With a Lotus Rock paella pan, so can you! Heavyweight 2.0mm steel gauge transfers and retains heat evenly. Thick ceramic coating is metal utensil safe. Resistant to rust, chipping and cracking, the lipophilic coating only needs cooking oil for non-stick release when the recipe requires it. Specially formulated black matte interior has high heat resistance (650 degrees Fahrenheit) and a rougher surface for better browning. Smooth base compatible with all cooktops, including induction. Double-riveted stainless-steel handles for comfortable grip and long-life durability. The very best stir-fries will have a hint of what is called Wok Hei, or the “breath of the wok“. This is a complex smoky flavour that is only achieved by cooking fresh ingredients over extreme heat, meaning that the flavour develops while simultaneously retaining the textural crunch. Lotus Rock’s construction and coating configuration is ideally suited for a stir wok to impart the types of flavours and tastes associated with Wok Hei. Unlike non-stick coated stir woks, a Lotus Rock stir wok has very high heat resistance (it can reach temperatures of 350 degrees centigrate, in contrast a non-stick coating generally starts to expire around 260 degrees centigrade). For excellent stir frying a wok should be heated gradually so that it reaches a very high temperature just before the oil, raw vegetables and meat are added. 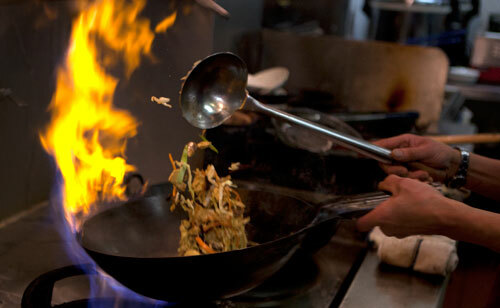 It is only with a hot wok that the flavour and tastes of Wok Hei can be imparted on food during stir frying. Easy and safe handling is essential for proper stir frying, especially when cooking over a very high heat to create the flavours associated with Wok Hei. While a cast iron wok can be cumbersome and difficult to lift, a Lotus Rock wok is thick enough not to warp easily under high heat but is still not so heavy that the wok can be lifted to toss ingredients quickly. For an excellent stir fry, to impart delicious flavours such as Wok Hei, the wok must maintain a high heat at all times. The various different ingredients for the stir fry, whether it is a protein, vegetable or aromatic should never stream in their own juices, but instead be seared to impart a special caramelized and smoky flavor. In contrast to stainless steel, which takes a long time to heat up and cool down, all Lotus Rock woks are made with heavy gauge carbon steel, which is excellent at absorbing and retaining heat for an all-round excellent, stir-fry Wok Hei effect. 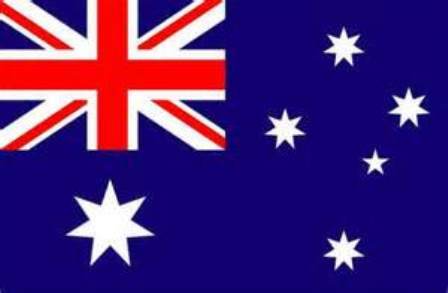 In association with the Davis & Waddell Asia One range, Lotus Rock stir woks are now sold throughout Australia in a number of store outlets, such as Kitchen Warehouse. Currently these stir woks are sold in two different sizes, 12″ and 14″, both of which have the Acacia square wooden handle. 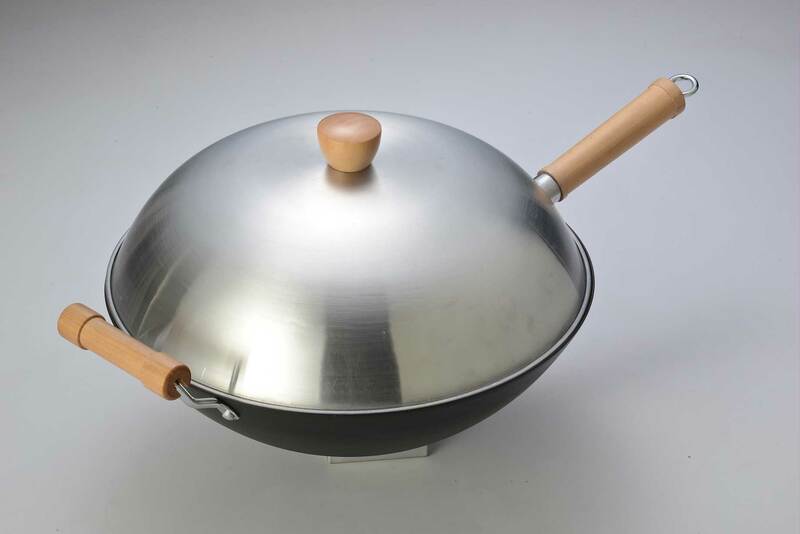 A Lotus Rock wok is a highly versatile cooking utensil. In addition to being excellent for stir frying, a Lotus Rock wok can also be used for a number of other cooking techniques, these include steaming, smoking and deep fat frying. 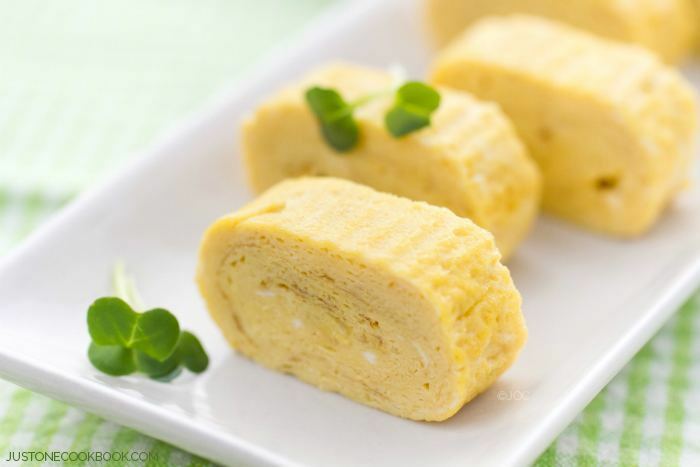 In Japanese cuisine rolled omelettes are made as rectangular thin omelettes and then rolled into a cylindrical or elongated cube shape using Japanese kitchen chopsticks. To obtain a roll with a constant diameter over the entire lengths, the thin omelette should be of rectangular shape. To obtain this shape a special rectangular frying pan is used. This type of pan shape for making Japanese-style rolled omelettes is generally called Makiyakinabe, but in other parts of Japan it is also known as tamagoyakiki. 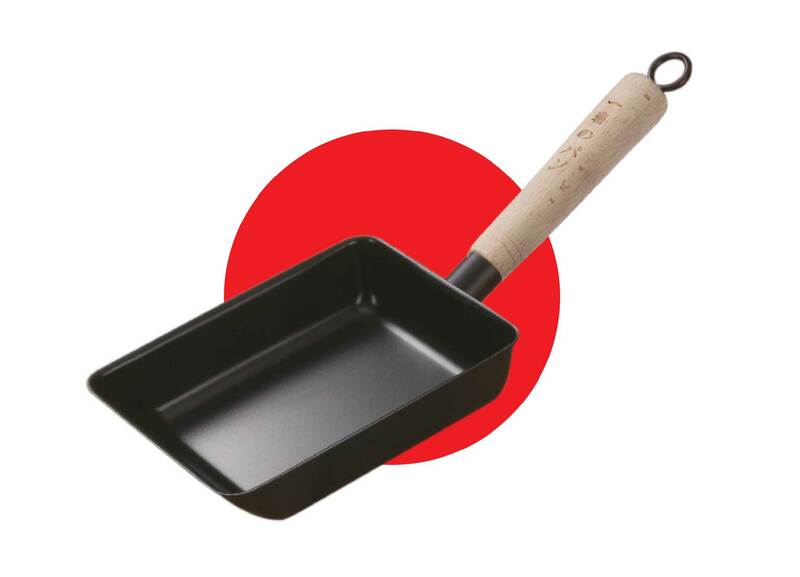 In the market place today the Makiyakinabe pan is most often made of iron, with either a plastic or wooden handle. 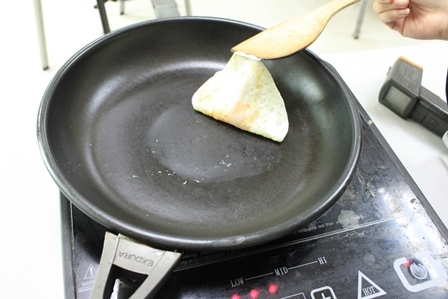 Since the main purpose of Makiyakinabe is to use a lot of eggs to make an omelette, a non-stick coating is applied to the pan to facilitate easy rolling of the omelette into an elongated cube shape. To prepare a Japanese-style rolled omelette the eggs need to be beaten in a bowl, with the soy sauce, mirin, sugar and salt added later to the mix. The Makiyakinabe pan should be brought up to a medium heat and then a small amount of cooking oil should be added. Next the egg mixture is poured into the pan and when it is slightly uncooked should be pushed to the side of the pan. After this another small amount of the egg mix should be added to the pan. Once this has cooked for a bit it can be rolled over the first bit of egg mixture that rolled up the pan earlier. Keep adding the egg in new layers until you have used it all up. Once this is done the omelette can be removed from the pan, and once it cooled can be sliced into thin pieces with a sharp knife. Scratching, both on the interior and exterior of the pan. Rust, in some cases this has appeared after only a few uses. Uneven heating, the omelette would cook faster in one section of the pan. Poor non-stick release, eggs would stick quite easily even after just 3 times of use. Difficult to clean, eggs are difficult to remove from non-stick coating. Thickness. 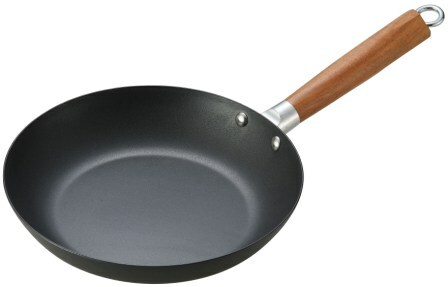 A number of the consumers on Amazon complained about both the thin metal base and non-stick coating. 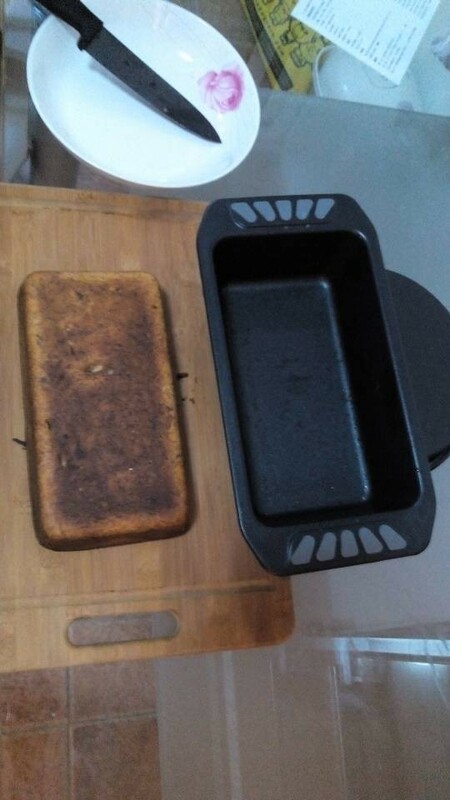 This particular pan did not heat evenly (or retain heat well), and the non-stick coating easily scratched, causing the iron surface below to rust quite easily. 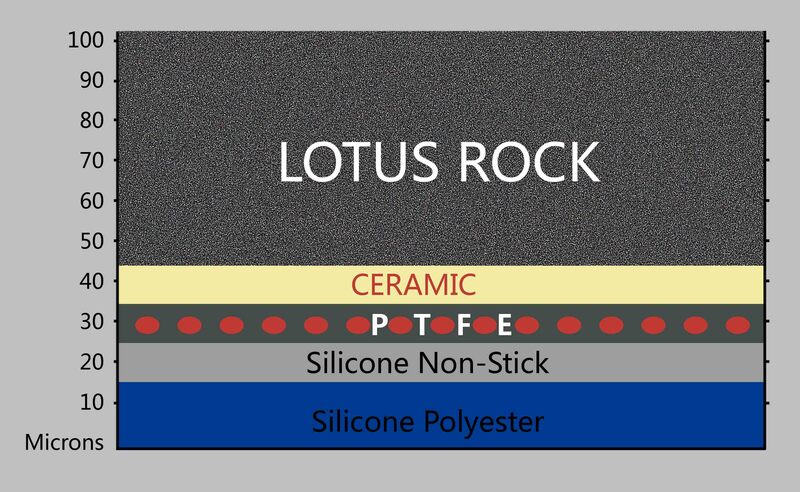 As previously explained here, Lotus Rock has both a heavy gauge carbon steel base, as well as a very thick ceramic layer around it (up to 100 microns). 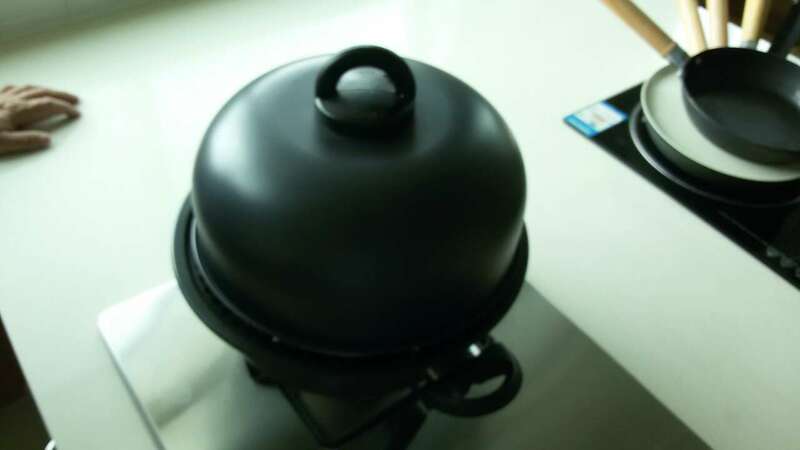 Therefore, not only does a Lotus Rock Makiyakinabe pan heat up evenly and quickly for an excellent heating effect, but the coating is extremely scratch resistant to use on the stove top or to whatever material it is being stored on in the kitchen. The thickness of the Lotus Rock ceramic layer also provides excellent corrosion resistance, so no rust spots should appear in spite of intensive, daily use. Non-stick release. One of the most common complaints about the pan reviewed on Amazon was that the non-stick effect wore off extremely quickly. In contrast, all Lotus Rock pans have a natural, highly durable non-stick release. As explained above, one of the cooking instructions for all Japanese-style rolled omelettes is that after the egg mixture is rolled up the pan cooking oil should be added again to make the next layer of the omelette. As the video above clearly demonstrates, no sticking occurred when the egg mixture was added to the Lotus Rock Makiyakinabe pan. The high durability of the Lotus Rock natural non-stick surface is perfect for a consumer who wants to use this type of pan on a daily basis for breakfast. Metal utensil safe. In order to cook a Japanese-style rolled omelette correctly, speed of movement is important. A tough and sharp utensil is needed to get quickly underneath the egg mixture to roll it over so it settles nicely at the top of the pan. For the pan reviewed on Amazon a fair number of consumers complained that they had to be careful which type of utensil they used, otherwise they might scratch and then impair the quality of the coating. On the other hand for a Lotus Rock Makiyankinabe pan, because the silicon-oxide crystal coating is extremely thin, no metal utensils can damage it or the thick ceramic layer it is coated on. Therefore, a consumer can use any type of utensil, such as a metal spatula, fork or chopsticks without any fear that using them might scratch the coating. If you are a passionate lover of Japanese cuisine, and you would like to cook a delicious Japanese-style rolled omelette then perhaps you should consider to purchase a Lotus Rock Makiyakinabe pan. It can be used for your daily breakfast, over a long period of time without any worries over scratching or poor non-stick release. As many readers of this blog will already know, Lotus Rock cookware is excellent for high-heat cooking. Sautéing is one such commonly used high heat cooking method, popular in both domestic and professional kitchens. To sauté is to cook food quickly in a minimal amount of fat over relatively high heat. The word comes from the French verb sauter, which means “to jump,” and describes not only how food reacts when placed in a hot pan but also the method of tossing the food in the pan. i) The food should be cut into smaller, bite-sized pieces. ii) A high heat and a good sizzle should generally be maintained at all times. iii) The food should be tossed from time-to-time to ensure that it cooks evenly. As has been explained here and here, a Lotus Rock pan has excellent thermal properties for high heat cooking, such as for sautéing. For a brief summary there are a few reasons for this. First, a Lotus Rock pan heats up very quickly because of the material properties of the carbon steel substrate within it. Secondly, its steel material gauge along with the ceramic layer coated around it is very thick. This high thickness ensures that heat is spread evenly around a Lotus Rock pan. Lastly, the high density of the steel along with the excellent insulation capability of the ceramic layer around it means that even when food is added for sautéing the temperature of the pan will not drop significantly. Thus, with a Lotus Rock pan a good sizzle can start immediately and be maintained without the food steaming in its own juices, for excellent browning and a succulent flavour. However, even before the sautéing process can begin, it is important that the pan is pre-heated to a high temperature before adding oil or butter to it. If ingredients are added to a cold pan, with cold oil on it, and then slowly heated up this will result in food which is bone dry. The reason for this is related to moisture retention: if a piece of food is heated up slowly, the ingredients of the dish will gradually release moisture, gently simmering in their own fat. Instead for a better sautéing cooking result small cuts of meat and vegetables should be browned quickly at a high heat, which will at the same retain their moist and rich flavours. A Lotus Rock pan is particularly suitable for being pre-heated to a high temperature for Sautéing. This is because the coating of Lotus Rock has a specially configured design which has very high heat resistance. The Lotus Rock silicon-oxide crystal coating is made up of inorganic substances: it is in the form of a thin crystal, which has no traces of carbon within it. Conversely, the type of ceramic material that the silicon-oxide crystal coating rests on can resist temperatures of up to 350 degrees centigrade. This is particularly advantageous for a high-heat cooking method such as sautéing which requires the pan to be preheated to a high enough temperature so browning can start immediately once the food is added to the pan. In contrast to Lotus Rock, most general non-stick cookware is organic-bonded and so can easily break under a high temperature. If a non-stick coating is continually over-heated then it will either quickly start to degrade (such as peeling off or blistering), or if it contains PTFE for its non-stick release, a hazardous chemical smoke may appear which has been proven to be fatal to birds. So in general, non-stick pans are not suitable to be pre-heated to a high temperature for a cooking method such as sautéing. Instead they are more appropriate for cooking more delicate produce, such as tofu or fried eggs, which do not require a very high heat at the start of cooking. 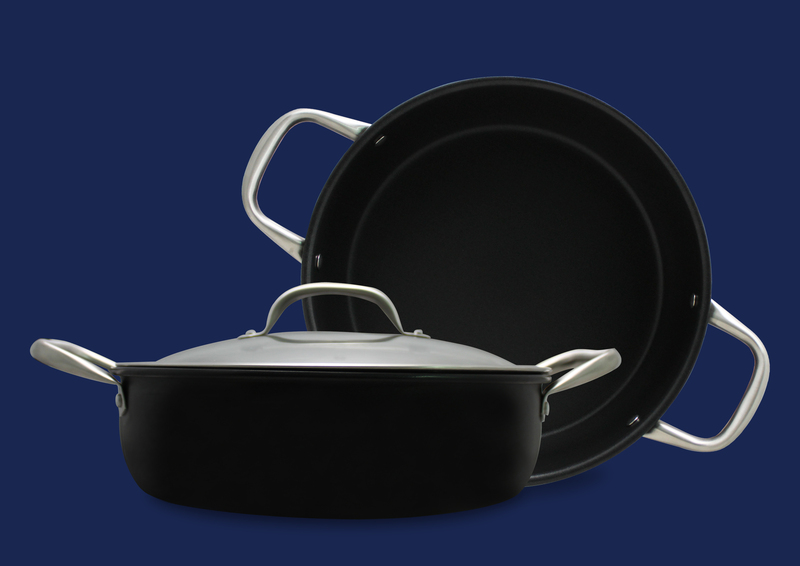 In addition to Lotus Rock, another material for cookware which does have very high heat resistance is cast iron. Pans made of this material have an excellent intense and even heating effect and can maintain a good sizzle at all times during sautéing. However, as was noted in point 3, generally a good saute requires some tossing and because of the heavy weight of cast iron pans, for most people this would be quite troublesome. Also, with sautéing it is important not to overcook the food in order to avoid excess moisture loss. Cast iron cookware is very slow to cool down, so unless the food is taken out of the pan very quickly, many of the bite-sized pieces may well continue to sizzle too long and be browned too much. Sauteing is a dry heat cooking method, and it is an ideal means for searing or browning food, a process that imparts significant flavor. To accomplish this, high heat is needed and food must not be introduced until the pan and the fat have been pre-heated first. A Lotus Rock pan is ideal for sautéing because it can be pre-heated to a high enough temperature* to start browning and caramelizing meat and vegetables immediately, without damaging the pan’s non-stick performance or construction. 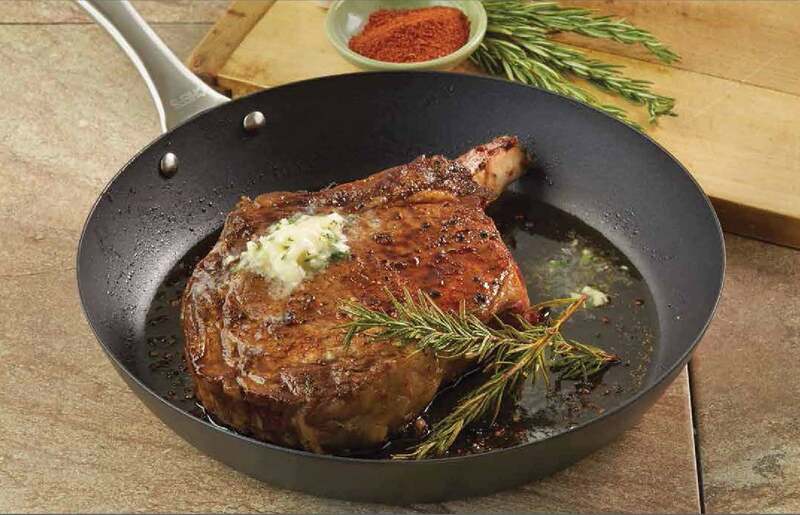 A Lotus Rock pan’s heavy gauge carbon steel and thick ceramic coating has the necessary thermal properties to generate intense heat for a good sizzle, all of which is essential for sautéing. Conversely, a Lotus Rock pan is not so heavy that it cannot be tossed from time-to-time to ensure that the sautéed food cooks evenly. Conversely, the thick gauge and density of the steel substrate, along with the excellent insulation properties of the ceramic layer coated around it, mean that even when food is added to a Lotus Rock pan only a limited amount of heat is lost from it. This means that when a cook wants to add some diced potatoes or chicken to saute it doesn’t have to readjust the heat setting to get the pan hot enough again at the optimum temperature for excellent browning and caramelizing. *Important! Although a Lotus Rock pan does have excellent high heat resistance, its fast heating effect does mean that the pan should always be heated at a low-medium temperature. This way a Lotus Rock pan will build up heat within its highly dense structure more gradually and evenly than if it is heated on a high flame immediately. As explained above, when a pan has a lot of heat stored in it, the pan will brown, sauté, grill and stir fry food much better than if the food is added when the pan is still cold. If a Lotus Rock pan is heated up too quickly this may damage it through warping its base into either in a convex or concave shape, which could make the pan obsolete for use on a flat top cooking surface. A popular Saute pan in the Lotus Rock cookware collection has a 28cm diameter and is attached with the Zurich forged stainless steel handle. Straight sides accommodate liquids; a lid locks in moisture for slow braising. Rims are shaped to allow for dripless pouring. 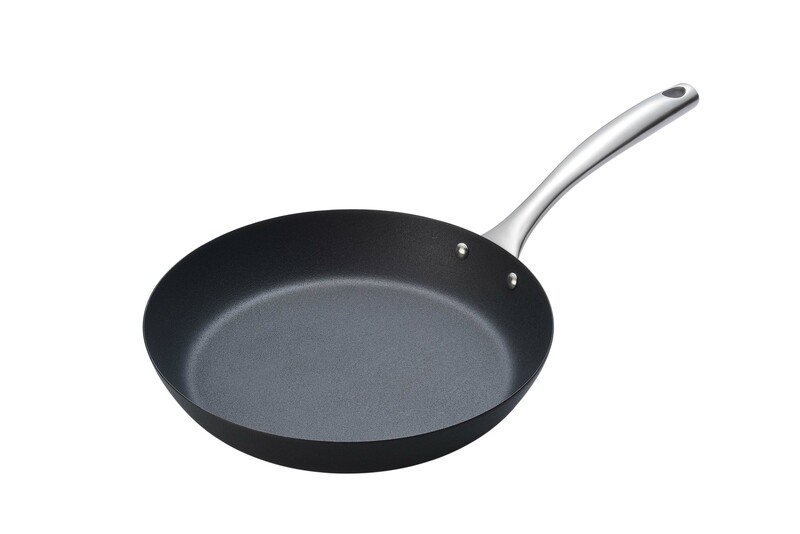 When a consumer is searching for a cooking utensil to buy, one of the many questions they might well ask themselves is ‘What kind of cooking task do I want to do?’ Naturally their first consideration would be the pan shape, for example a sauté pan, with its high, straight sides has quite an advantageous shape for high heat searing and then for braising afterwards. The consumer might then consider the thermal properties of the material in the pan (as discussed previously here). Once both of these have been fully evaluated, a fairly experienced chef might also look into the reactivity of the pan’s surface. The terms “reactive” and “non-reactive” refer to the type of metal from which the cooking utensil is made. Generally speaking, aluminum, cast iron, and copper are all “reactive.” Stainless steel, ceramic, glass and metal cookware with enamel coating are all “non-reactive.” Those metals listed as “reactive” will all generally react with acidic and alkaline foods, but they are all a good choice for boiling water, sautéing vegetables, or searing meat. Acidic ingredients that metals such as aluminum will react with include tomatoes or lemon juice, which give your food a metallic flavor, especially if the cooking time is very long. In addition, with a reactive cooking surface cooking with acidic ingredients might also produce undesirable colours and/or flavours. Tomato sauce and other tomato products react with aluminum because of their acidity, and acids don’t mix well with aluminum. Highly acidic foods cause oxidation, which can darken the aluminum pan and alter the taste of the food. A special case is anodized aluminum, which is aluminum that has been treated with an electrolytic process to create a harder surface that is still somewhat reactive, but significantly less so than untreated aluminum. 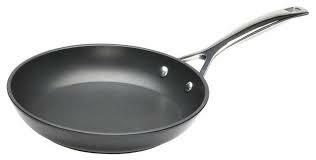 If food is cooked with this type of cookware then it may pick up chemical elements from the surface. However, ingesting iron is not a health concern as the human body can process iron relatively easy. When properly seasoned a cast iron pan’s surface becomes less reactive and some acidic ingredients can be used for a short period of time. However, these pans must be continually re-seasoned otherwise the surface will become more reactive and begin to discolour and pit when used with acidic ingredients. An uncoated copper surface is actually beneficial for some cooking techniques, such as whipping egg whites (makes the whites more stable). However, unlike iron, the human body has a much harder time eliminating copper after ingesting it, so a cookware utensil with this type of surface should be used sparingly. Other problems with copper cookware include discoloring and scratching. 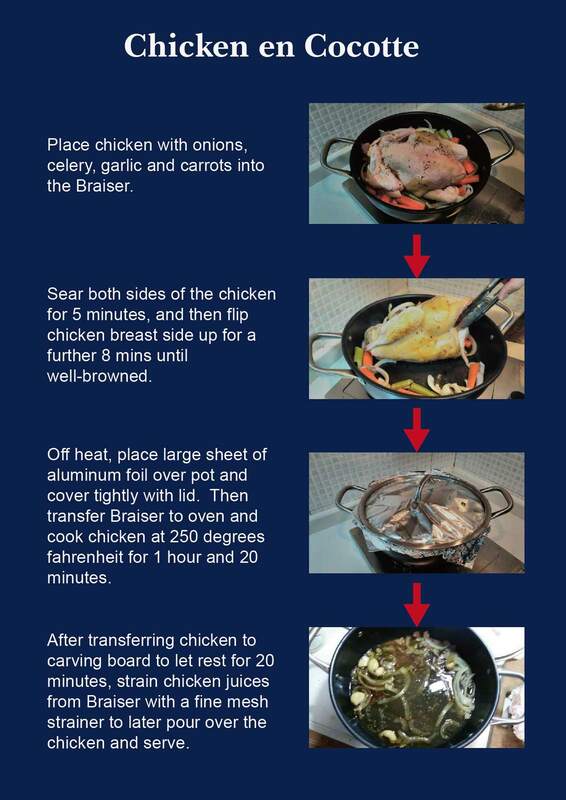 One significant benefit of a non-stick coating on, for example, an aluminum pan, is that it provides a complete non-reactive surface for cooking. Whether the coating contains PTFE or silicone oil for its non-stick release, acidic or alkali ingredients will not react with either the inert coating or the surface metal below it. However, there is one major disadvantage with the non-reactive surface of a non-stick coating: it is not suitable for deglazing. First and foremost, non-stick coatings are not appropriate to use for high heat cooking, which is important for browning meat and vegetables. However, even if a non-stick coating was used for searing large cuts of meat with a brown crust on them, de-glazing can still not be done because these little brown bits formed after the meat is seared will not stick to the pan during cooking. It is these leftover bits on the pan (the fond) which are an essential ingredient for de-glazing, to create a delicious sauce which can then be poured over the just seared meat. All Lotus Rock pans come with a non-reactive surface. This means that during cooking certain ingredients, usually acidic ones, will not chemically combine and alter the flavor and colour of the finished palette. For example, tomato juice can be used for a Bolognese sauce and lemon juice can be added where necessary to give a dish extra flavor. These sauces can then be cleaned from the pan after cooking without any colour staining or visible scarring on the coating’s surface. Unlike cast iron, a Lotus Rock pan does not need to be continually re-seasoned to make it less reactive to acidic ingredients. Likewise, unlike a copper pan, Lotus Rock can be used on a regular basis without heavy metals being absorbed into the cooked food. Lastly, because of its non-reactive surface, a Lotus Rock pan is highly appropriate for de-glazing after meat has been seared at a high temperature. The residue of the Fond can be made to form part of a delicious sauce through the addition of some kind of acidic solution, such as a broth or cup of wine. 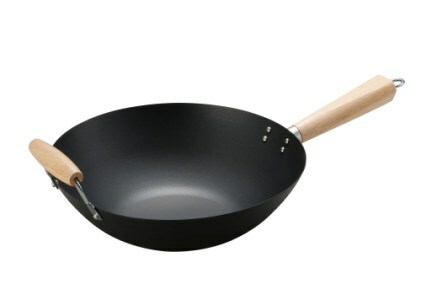 Previous posts on this blog have explained how a Lotus Rock wok can be used for a number of different basic cooking techniques, such as stir frying, steaming and deep fat frying. However, its versatility doesn’t stop there; a Lotus Rock wok is also excellent for smoking various types of popular dishes, such as salmon and chicken wings. Normally when people think of a cooking technigue such as smoking they would imagine a large backyard with a big outdoor grill, but in fact this is not necessary. All you require is a wok, aluminum foil and a stove top. However, a wok isn’t just more convenient to use for smoking, it has some other advantages over an outdoor grill. One such benefit is that the heat under a wok is much more adjustable than the blast you get from hot coals on a grill or in a smoker, which expands the possibilities when it comes to choosing ingredients to smoke with. 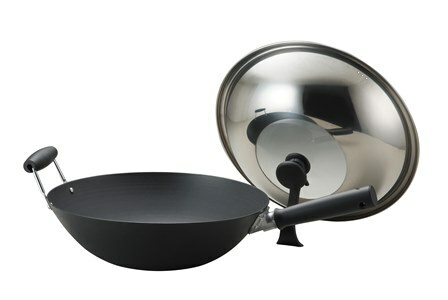 A wok is also very suitable for smoking compared to other standard pans because its spacious interior provides more room for smoke to circulate around the food. 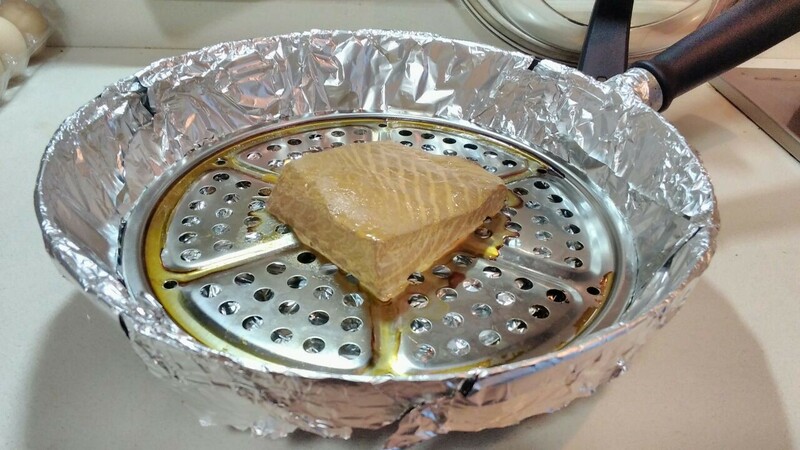 The method for smoking salmon, for example, with a wok is simple: scatter tea leaves, sugar, and rice in the bottom of a foil-lined wok—the tea contributes aromatic smoke, the sugar caramelizes to lightly color and sweeten the food, and the rice acts as the fuel source, keeping everything smoking. Take another piece of foil and make it into a small circle that will cover the mixed ingredients below. 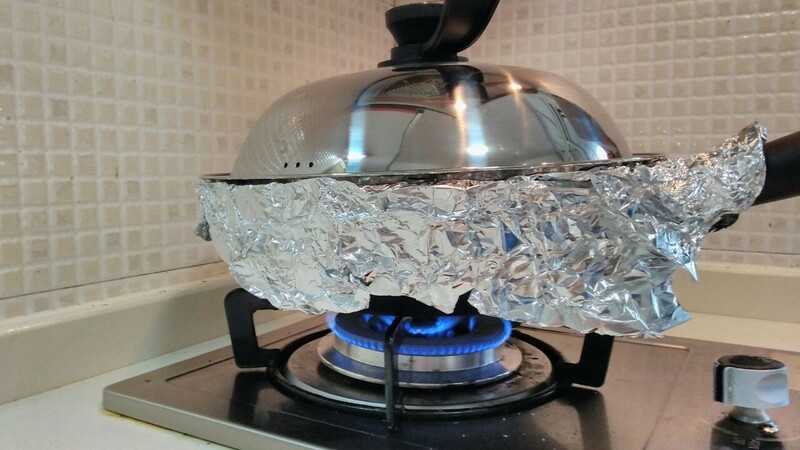 Then get a round cooling rack and place it on top of the aluminum foil. After placing the salmon on the centre of the rack, cover the wok with another large piece of aluminum foil, and tent it so there is enough space for the smoke to circulate above and around the salmon. Make sure to press on the edges of the aluminum foil so no smoke gets out. Before you put the wok on the stove top place a dome shaped lid carefully on top of it. Heat the wok on high until you see smoke coming out of it, at that point you will need to lower the heat to about medium and let it smoke for about roughly 10 minutes. When the salmon is ready to be checked make sure you go outside before taking off the lid. As explained in the previous post, a Lotus Rock Stir Wok is an excellent cooking utensil for steaming various types of food. However, unlike steaming which uses boiling water, Lotus Rock’s non-reactive coating can also be used for another highly intensive cooking method which instead uses boiling oil: deep fat frying. Good deep fat frying is all about getting the right oil temperature. Among cooking experts 325 degrees Fahrenheit is generally considered the optimum temperature at which to deep fry food, such as for chicken, shrimp and French fries. At this temperature the heat is high enough to turn the water in a piece of chicken to steam, to dry out the outer edge, and to form a brown, crispy crust, all the while cooking it for a moisty and creamy centre. However, if the temperature is too low then the browning reaction does not occur. 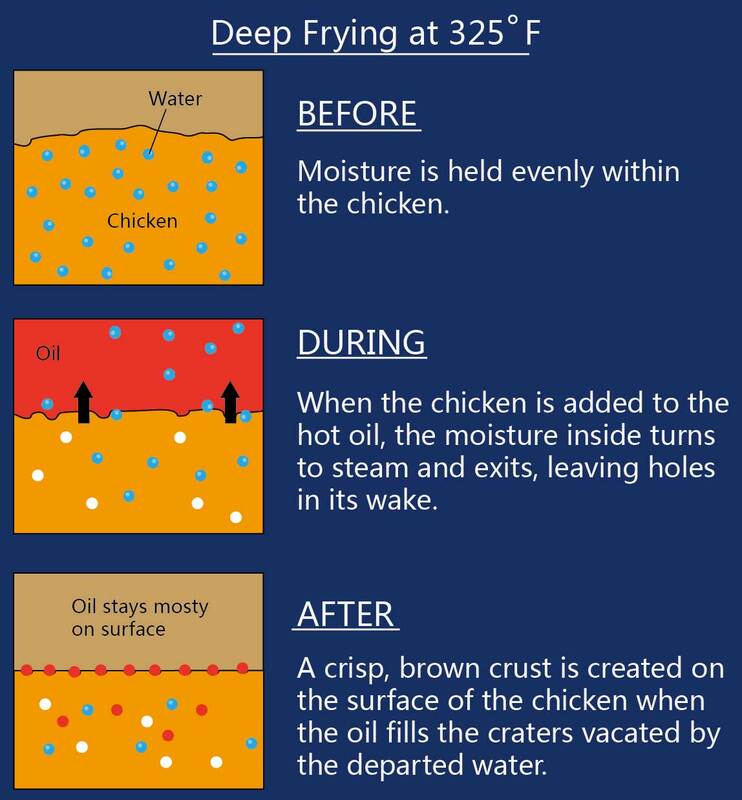 If this happens then there is nothing keeping the moisture of the fried food from migrating to the outer edges, and the result is a limp and soggy end product. So, for delicious fried food the oil temperature is very important and a Lotus Rock stir wok has excellent thermal properties to not only reach a a high temperature quickly but also to retain it within the pan while the food is being fried. Lotus Rock is made up of a thick 2.0mm carbon steel substrate, a material which heats up very quickly. On an induction cooking top surface it can reach an internal surface temperature of 284 degrees Fahrenheit after only 60 seconds of heating. At this fast rate of heat conduction the ideal oil temperature for deep fat frying of 325 degrees Fahrenheit can be reached quickly. Conversely, because of the high density of the heavy 2.0mm gauge carbon steel, a high amount of the conducted heat is retained within the wok to maintain a high oil temperature despite the cooling effect of adding food for frying. Messy. The straight-sided edges of a Dutch Oven mean the kitchen surface can quite often get splattered with little droplets of oil splashing out from the sizzling food inside the pot. In contrast, the edges of a wok spread out a good 7 centimeters or so on either side from where the oil is cooking, catching any splashes of oil and keeping your kitchen surface cleaner. Cooking surface area. 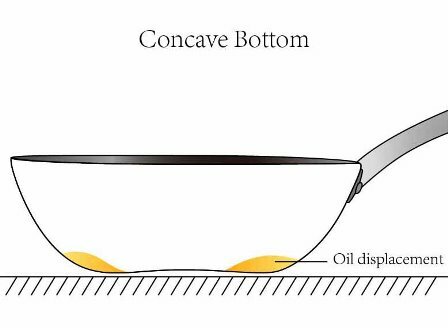 The extra space provided with the wide edges of a stir wok is not only beneficial for keeping oil inside, but it is also useful for maintaining a high oil temperature. With deep fat frying it is important that the food is not too crowded inside the pan. 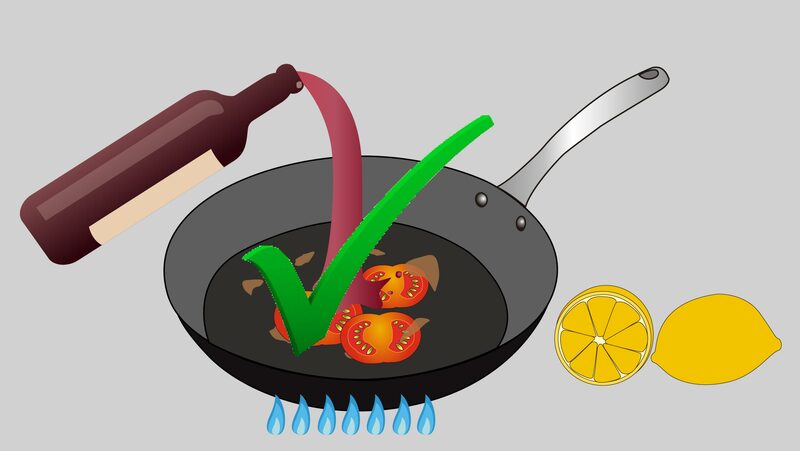 If there is too much food in the pan then it will be more likely to congregate together which would cause the temperature of the oil to decrease. 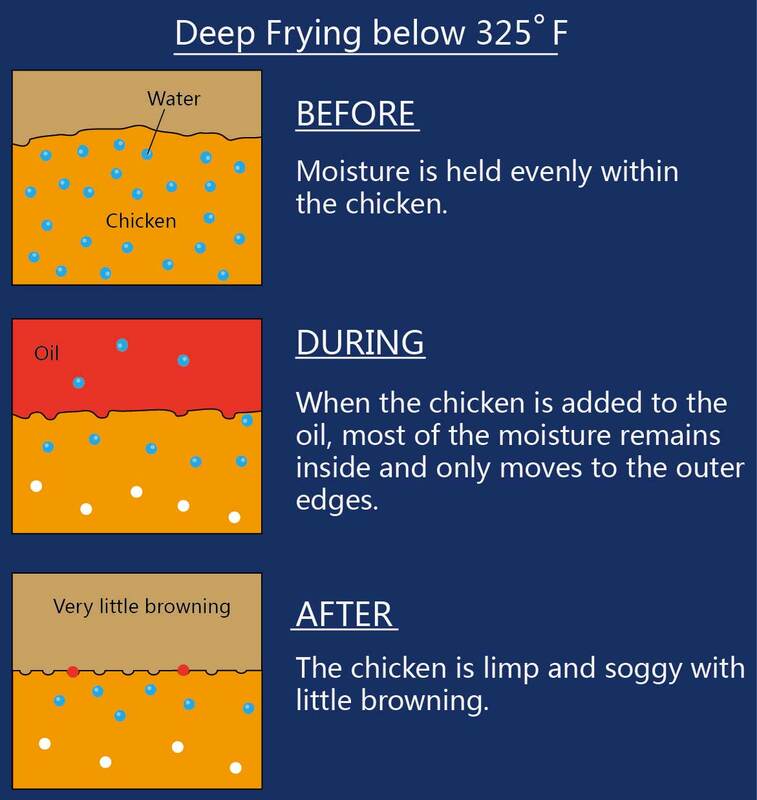 As explained above, if this happens and the temperature drops to below 325F (generally considered the optimum temperature for deep fat frying) it can leave the surface of the fried food soggy when instead it should be crispy. With the wider cooking area of a stir wok compared to a Dutch Oven, food can be fried more evenly, at a high temperature in order to develop a tasty dry, crispy crust. Easier cleaning. 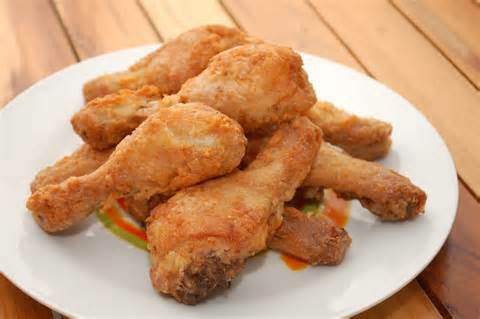 During deep fat frying bits of fried food, such as burnt bread crumbs, will separate and sink to the bottom. With a Dutch Oven these can congregate in the corners of the pan making it very hard to clean properly. With a wok, on the other hand, these dirty particles have nowhere to hide and are easier to remove with a strainer as you fry. Less oil needed. 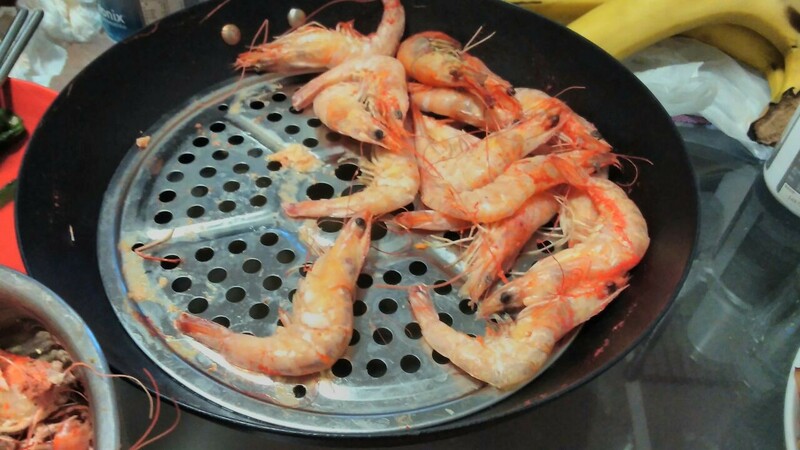 Deep-frying in a wok is ideal because its concave shape requires less oil than a regular pot. This is especially useful because you cannot dispose of oil in in a plastic garbage liner. So the less oil you have after cooking, the less hassle you will have to get rid of it. 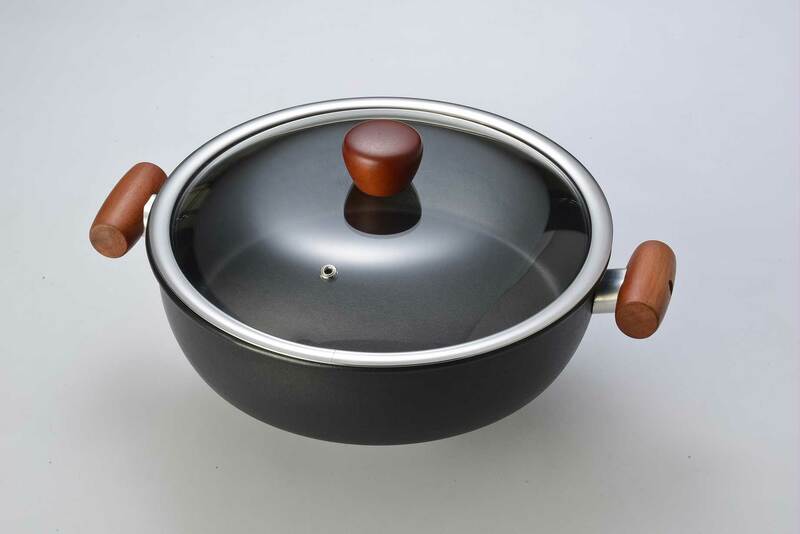 A Lotus Rock stir wok’s material composition and shape makes it particularly suitable for deep fat frying. 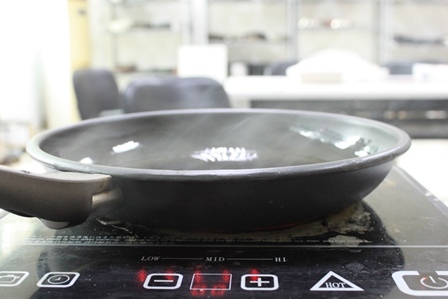 It’s fast heating effect can get the oil up to a high temperature quickly while its thickness and density can maintain that temperature even when food is being added to the wok. Unlike a PTFE non-stick coated wok, which might get damaged from hot particles of oil getting inside the coating, a Lotus Rock stir wok has an extremely tight bonded ceramic layer, which has very high heat resistance and can withstand the rigors of deep fat frying. Other materials for a wok, such as stainless steel, might well have a strong construction to withstand the effects of a high oil temperature, but they will not heat up as quickly or retain heat quite as well as a Lotus Rock stir wok. 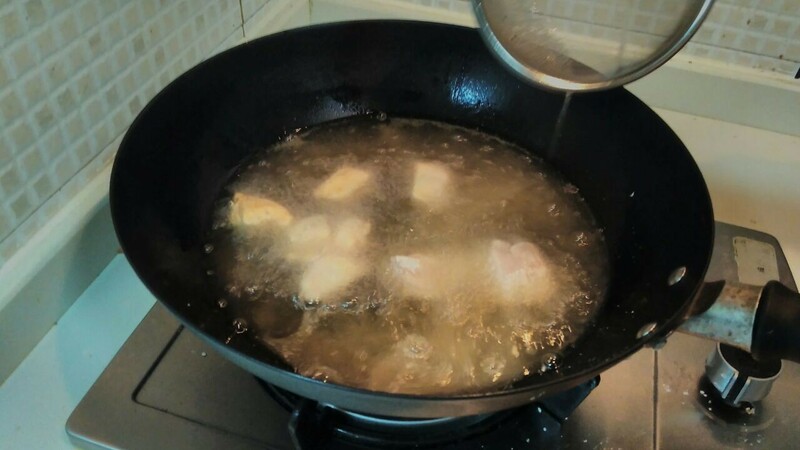 Getting the right oil temperature inside the wok is very important for good deep fat frying for if it is not hot enough, then the moisture inside the food will not turn to steam, the outer edge will not dry out, and the trademark brown and crispy crust will not form. 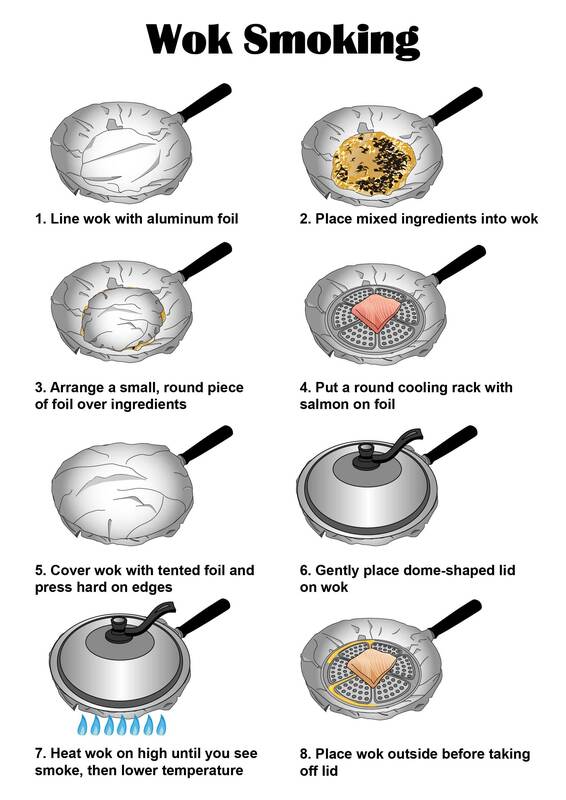 Deep-frying in a wok is ideal because its concave shape requires less oil than a Dutch Oven, and the wide cooking surface area of the wok allows more food to be fried at one time without over-crowding, which with a Dutch Oven would mean frying in fewer batches. A wok can be used for a variety of different cooking methods. These include the most obvious one, stir frying, and also deep frying and smoking. It is less well known that with the right accessories, such a steel rack and a dome-shaped lid, a wok can also be used for steaming. Pastry-based foods, such as dumplings or other dim sum-related dishes. Green vegetables, such as broccoli, artichoke, eggplant, are all very suitable for steaming. Soft, fatty cuts of meat before stir frying. What are the benefits of steaming compared to other cooking methods? Steaming is a relatively quick and hassle-free cooking method for those who wish to spend less time in the kitchen, but without compromising the taste and nutritional value of their food. Steaming preserves nutrients in the food that are destroyed by micro-waving, pressure-cooking or boiling, especially folic acid and vitamin C. Studies have shown that boiling reduces folic acid by 35% and vitamin C by 25%, whereas steaming reduces both by only 15%. Why use a Lotus Rock stir wok for steaming? Steaming requires a large amount of water to be boiled, making it preferable for the wok’s surface to be non-reactive (i.e. coated). If it is not, boiling water in the wok will cause rust or will remove or discolour the seasoning. Consequently uncoated carbon steel and cast iron woks, which both have excellent thermal properties for stir frying, are unsuitable for steaming. Aluminum non-stick coated stir woks have the opposite problem. Although a PTFE non-stick coating is very non-reactive, it is not bonded very tightly together and during steaming the particles of fast moving water vapour can penetrate the coating, making it peel off and impairing its quality. In recent years ceramic coatings have been used on stir woks, and this type of coating is much more tightly bonded together than a PTFE non-stick coating. However, although a ceramic coating may have a stronger construction than a PTFE non-stick coating, the silicone oil which gives the coating its non-stick release cannot withstand the high temperature which occurs during steaming and so often the silicone oil dries out quite quickly. Uncoated stainless steel is a more appropriate material for steaming, as its surface is more non-reactive than either carbon steel or cast iron, and there is no non-stick coating to be damaged. However, steaming is a very intense cooking process and even a stainless steel wok can, over time, start to rust if frequently used for steaming. In addition its thermal properties (uneven heat transmission, with a high tendency for hot spots) make it less suitable for stir frying, which is what woks are mostly used for. A Lotus Rock pan has none of these disadvantages. Unlike uncoated carbon steel and cast iron, a Lotus Rock pan has a non-reactive surface which is suitable for boiling water. Unlike most general non-stick cookware (whether PTFE or ceramic), which is organic bonded and can easily break under a high temperature, the Lotus Rock coating is made up of inorganic substances and has much higher heat resistance. This type of coating material is more advantageous for a cooking method such as steaming, especially when compared to a general non-stick coating, which will either break up or dry out in such hot and moist conditions. Lastly, in contrast to stainless steel, a Lotus Rock stir wok’s thick carbon steel base has a much better heating effect for stir frying, making it more multi-functional. A Lotus Rock steamer rack is thick and strong enough to withstand the weight of one or more porcelain dishes on top of it, for steaming entrees, such as fish, which taste better if the juices can be used for a sauce. The stainless steel material is highly heat-proof, with excellent corrosion resistance. The holes in the rack are wide enough to create convection currents to circulate the steam around your food. However, they are also small enough to prevent food falling into the boiling water below. 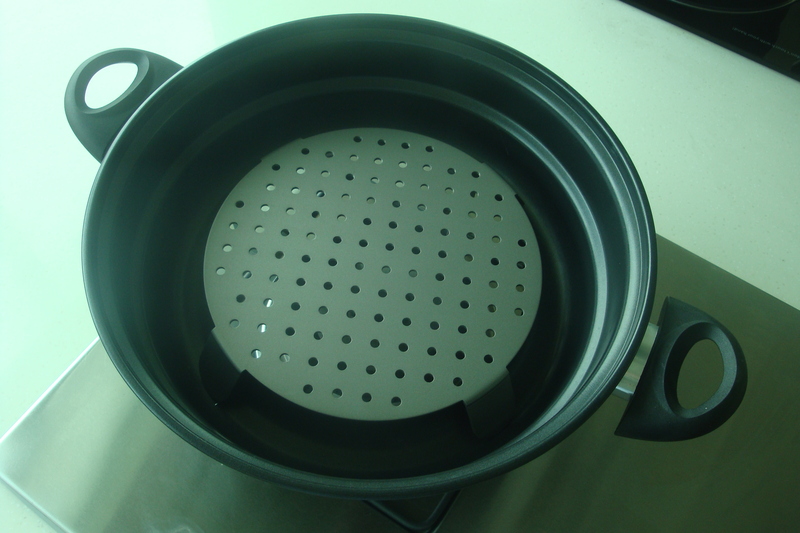 All Lotus Rock steamer racks are sold with a diameter which generally fits half way down the stir wok. This way there is enough space for the steam to circulate between the food and the lid, while at the same time ensuring there is enough distance between the rack and the boiling water to avoid water splattering and soaking the food. 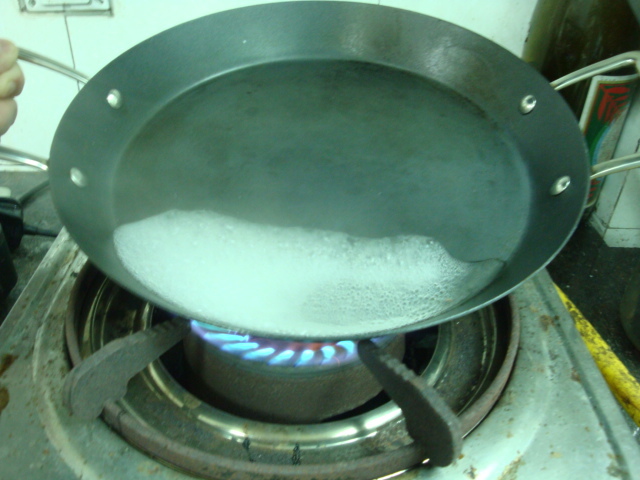 A tight-fitting dome-shaped lid is essential for steaming. In order to ensure that very little steam escapes from the wok during cooking all Lotus Rock lids are manufactured to fit the edges of the wok very tightly. The dome shape is important because it allows condensation to run down the sides of the lid, rather than dripping onto the food you are steaming. The rim and sides of a Lotus Rock stir wok lid are made of stainless steel, whose its strong construction can withstand the intense heat from the rising steam below it. To steam food well timing is all important (if you steam for too long then the food can be quite dry), so a glass centre allows the cook to monitor the progress of the cooking more easily and safely. Lastly, the lid has a clip-on knob design which allows the lid to be safely removed from the wok (especially useful after steaming as the temperature inside the wok can get very hot). After this the lid can then be placed upright on the kitchen worktop with the clip-on handle as support. While shopping in a department store, the average consumer may not consider the base concavity of a cooking utensil their most important consideration when they are making a purchasing decision. More likely the price of the item, the look and feel of the surface coating, and perhaps the pan’s weight and appearance are all reasons which a consumer might decide are most important before they buy a cooking utensil, such as a stir wok. However, if the base of a pan is not made according to the correct specifications then it could become obsolete for cooking use quite quickly, thus negating any benefits that the pan might have had because of its price, material quality or attractive appearance. For example, if the concavity of the pan is set too high then the heat source, from a cooking top surface such as a gas or electric stove, could force the centre of the pan to rise upwards to quite a large extent. Consequently, the pan would then have a bump in the centre which would cause cooking oil and sauces to slide to the edge of the pan. Alternatively, another difficulty may arise if the pan concavity is too shallow. This would mean that heat from the stove top would have a stronger effect towards the side of the pan and push the edges of the bottom upwards, which would then create a convex shape at the bottom of the pan. This would not only cause cooking ingredients to congregate in the centre of the pan, and so reduce cooking space, but it would also create a safety hazard as the pan would spin around during cooking. So, for the reasons stated above, it is essential for the durability of all pots and pans that they have the correct bottom concavity height. If they do not, then whether the pan is made with high quality material or the non-stick coating is excellent becomes irrelevant because either a spinning motion or highly concave pan will develop on the bottom. There is a commonly used test in the kitchenware industry to demonstrate whether the concavity of a cookware utensil is correct or not. This test involves turning a pan upside down and placing a specially designed, straight edged measuring instrument across the bottom of the pan. This test requires that the pan’s concavity is measured both before and after it has been heated. The cold condition (room temperature) test stipulates that the pan must have a concavity of between 0.3% – 0.6%. The warm condition test (200 degrees +/- 5 degrees dry heating) specifies that after the pan is heated the bottom must not have a concavity of more than 0.3%. The Lotus Rock standard concave required range is between 0.003 – 0.006 thousandths. 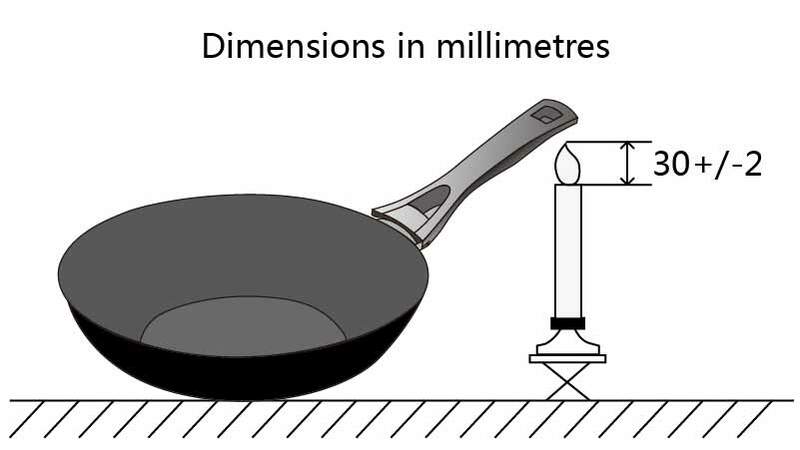 With a concave base set between these parameters the pan should neither expand too much through the centre, which if it did would cause oil or sauces to settle at the edges of the pan, but neither should a convex shape develop at the bottom, which if it did would create a spinning motion on a flat top cooking surface. So along with a metal utensil safe surface, a heavy gauge steel substrate, and a PTFE-free lipophilic coating, a Lotus Rock pan will, with the correct base concavity, be a cookware utensil that can be used for a long period of time. As was explained in the previous blog post, the sharp, protruding edges of a gas stove require a high quality cooking utensil to have a tough, strongly constructed outer coating to withstand chipping and highly visible scratch marks. 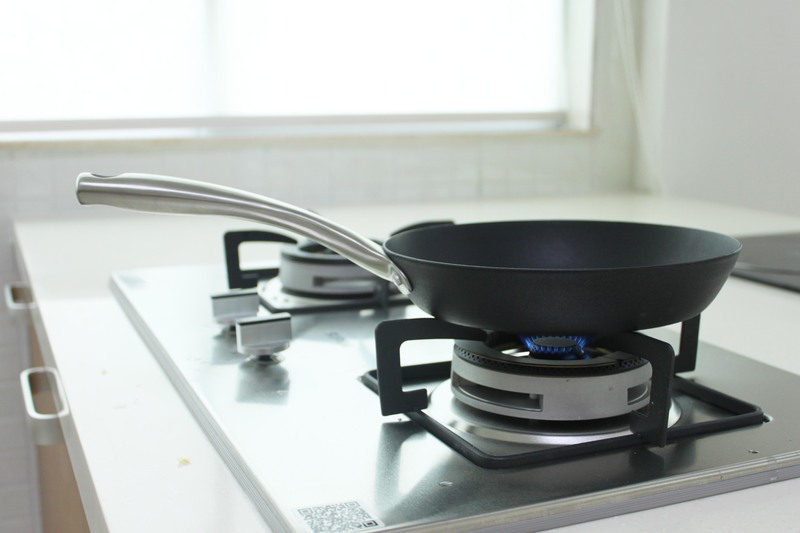 However, cooking on a gas stove also necessitates a high quality handle because often the flame from the gas stove can, in certain cases, reach up the side of the pan and come into contact with the handle. This would be especially the case for high heat cooking methods, such as stir frying, or making a delicious, crispy crepe (all of which a Lotus Rock pan is very suitable for doing). 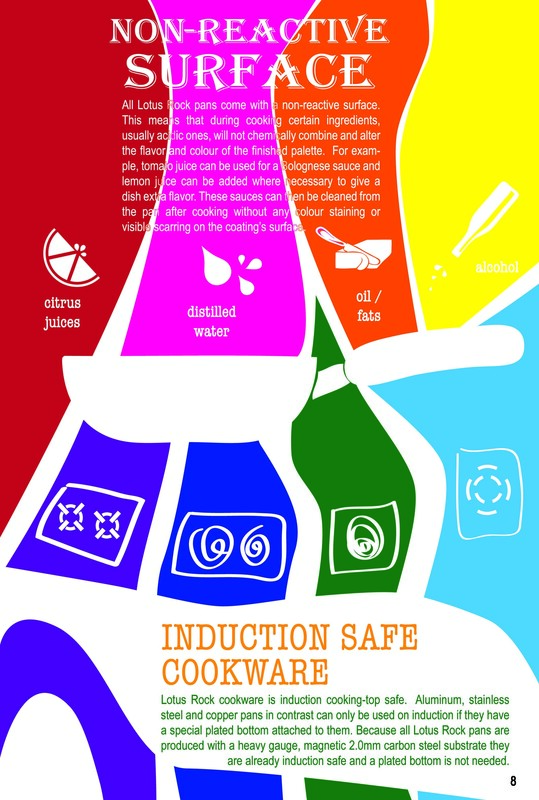 The kitchenware industry commonly uses a test, from BS EN 12983-1 2000 cookware standard regulations, to assess how flammable the material of a handle is to a candle flame set underneath it. For a pass to be awarded no visible sign of molten or burning material should have melted or dripped off the handle, after it has been heated for 30 seconds. In addition, once extinguished the handle material should not spontaneously re-ignite. Step 1 = Attach cookware to the rigid base. Step 2 = Position the burner, alight, with airhole closed, so that the tip of the flame just touches the underside of the end of the combustible part of the handle. By means of the gas flow adjust the flame height to 30mm + 2mm. Ensure that the air hole is closed throughout the test.. Step 3 = Expose the handle to the flame for 30 s + 1s, remove the flame and allow the handle to burn either until any flame self-extinguishes or for 15 s, whichever occurs first. Observe whether any molten or burning material falls from the handle during this period.. Step 4 = Measure and record the length of time the handle continues to burn following the removal of the flame. 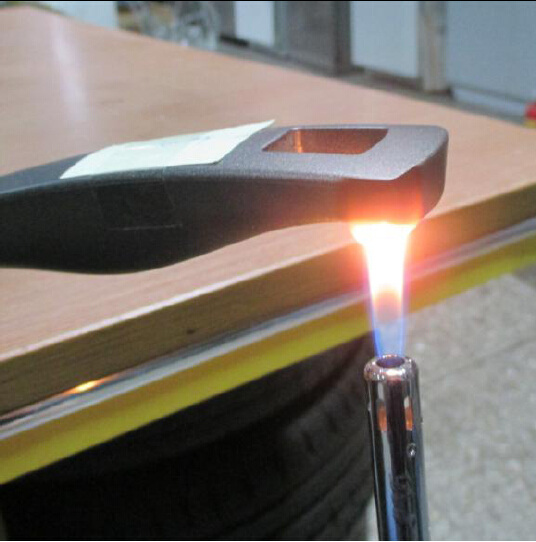 On 15th January 2015, in an Acton testing laboratory, the Lotus Rock bakelite Titlis handle passed the above resistance to burning test. 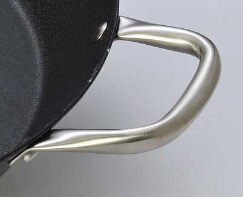 This handle, along with many others designed and patented by Lotus Rock, is safe to use over a gas stove for numerous high heat cooking methods. Whether moving a crepe pan sideways to get the mixture spread around the pan for a delicious, crispy texture, or to quickly toss vegetables and thinly cut pieces of meat inside a stir wok, a Lotus Rock pan has the handles which are safe and non-flammable to do this. A previous blog post described how a migration test can be done to test the surface reactivity of a cookware pan. 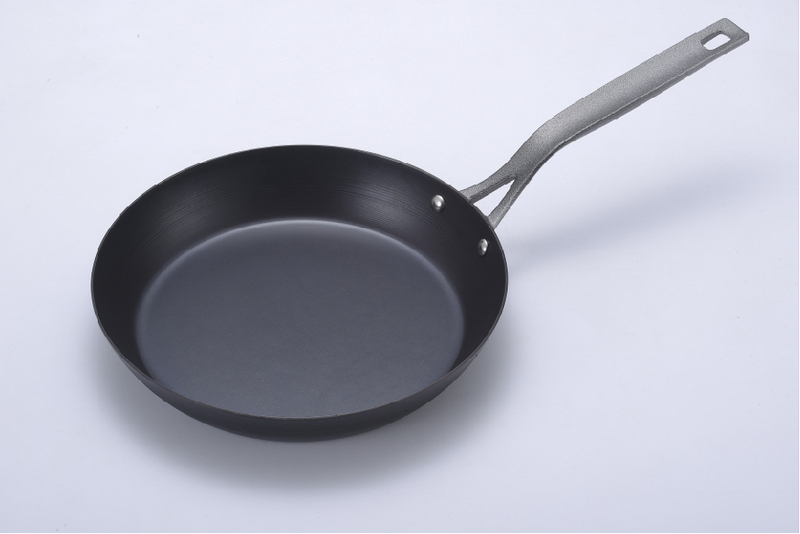 The benefit of a non-stick coating on a pan is that it contains a substance called PTFE, which has very low reactivity with substances in contact with it. Even to this day, PTFE has been proven to have the lowest coefficient of friction (CoF) of any known solid. In other words, the majority of materials do not stick to it. Therefore, because of its excellent non-stick release and low reactivity to substances in contact with it, a PTFE-based non-stick coating should pass a standard BS EN 1186-1: 2002 migration test quite easily. However, although PTFE does undoubtedly provide excellent non-stick release and low reactivity for a coating on a cookware utensil, it does have some significant disadvantages; one of these is a tendency of a PTFE-based non-stick coating to peel off. Within a non-stick coating PTFE does not bond well to itself, which means it can have a pinhole problem. This difficulty can be exacerbated not only through general scratching with a utensil and rubbing with a cleaning pad, but also when oil is heated on a pan to a high temperature for high heat cooking methods, such as stir frying or sautéing etc. For these types of high heat cooking methods, the molecules of cooking oil can decrease in size quite rapidly and then penetrate the highly porous PTFE coating. This can lead to the coating breaking up and peeling off – thus not only impairing the quality of the non-stick release but also creating a safety hazard as bits of the coating mix with the food on the pan. One method to determine the resistance of non-stick coatings to separation from substrates, such as aluminum or steel, is to utilize a tool by cutting a right angle lattice pattern into the coating, penetrating all the way to the substrate. This is called the Cross Cut Adhesion Test, otherwise known as ISO 2409-2013. Some coatings may have a multi-layer system, and so this test can also be used to determine the resistance to separation of different layers from one another. 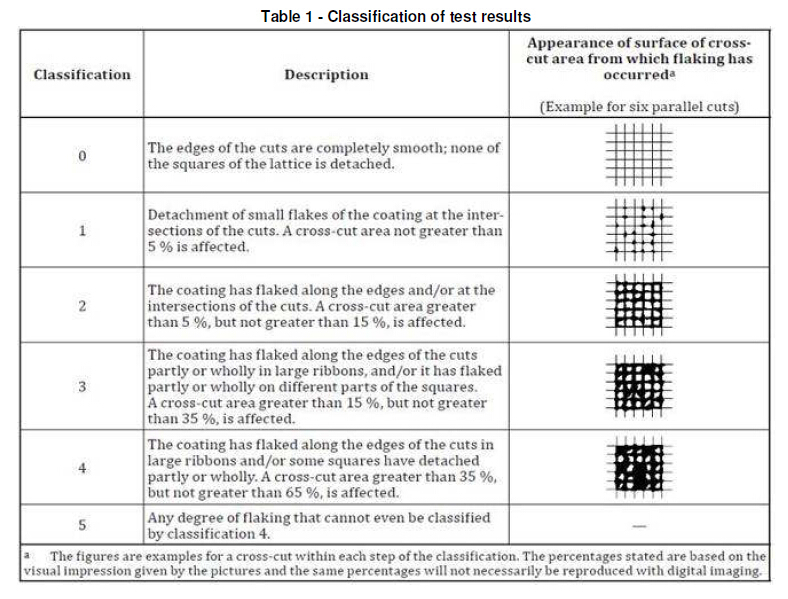 The below table are the classification of test results for an ISO 2409-2013 Cross Cut Adhesion Test. 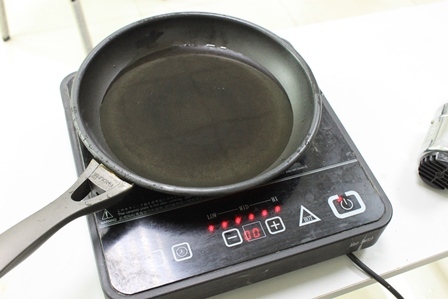 An ISO 2409-2013 test was conducted by SGS testing services, from 16th January 2015 to 21st January 2015, on a Lotus Rock frying pan. The test result was as follows. As you can see from the results above and the photos of the tested samples below, a Lotus Rock pan got a perfect score of 0; the edges of the cuts are completely smooth, and none of the squares of the lattice are detached. This excellent result is in part due to the fact that the coating on a Lotus Rock pan is not a standard PTFE based coating. All Lotus Rock pans have a very thick ceramic layer, up to 100 microns thick, on top of the heavy gauge carbon steel substrate. Nestled on top of the ceramic layer is a very thin silicon-oxide crystal coating which is so thin that it is very difficult for a utensil or other piece of equirement to dettach it from the ceramic layer below it. 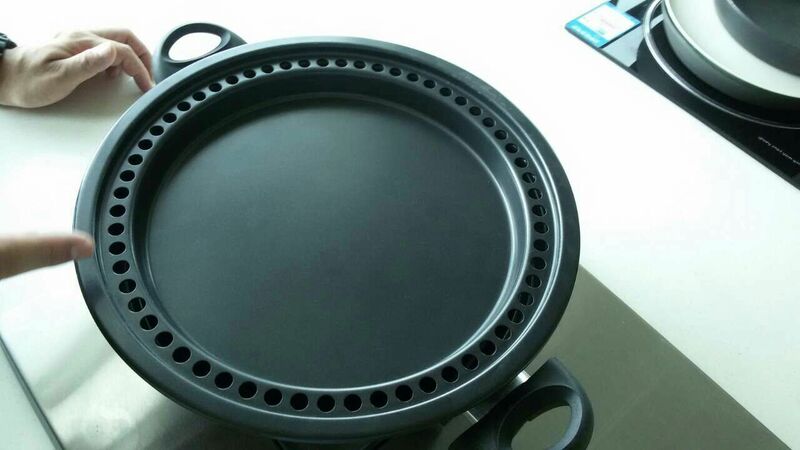 Therefore unlike a weakly bonded and thinly coated PTFE based coating, a Lotus Rock pan can, with its strongly constructed coating, be cooked on for an extended period of time without any fear that the coating will peel off or break up. As has been noted previously on this blog, Lotus Rock cookware is a metal utensil safe product: stainless steel spatulas, knives and forks can be used on it without damaging the coating. In addition, a Lotus Rock pan can be scrubbed hard with a standard abrasive pad for cleaning without impairing the quality of the pan’s coating. The interior coating for all Lotus Rock pans has been tested and passed, by an independent testing authority, according to BS 7069 Abrasion and Scratch resistance testing standards. A Pencil Hardness test has been used by the kitchenware industry for many years to determine the scratch hardness for the exterior coating of a pan. This test uses special pencils with different degrees of hardness to scratch the coating, which then determines its hardness. A complete set will have the following pencil gradings, starting with the hardest — 9H, 8H, 7H, 6H, 5H, 4H, 3H, 2H, F, HB, B, 2B, 3B, 4B, 5B, 6B, 7B, 8B and 9B (the latter is the softest pencil; it contains the most graphite and the least amount of clay). The “H” stands for “hardness” and the “B” stands for “blackness,” which comes from the amount of graphite used in the softer pencils. The simplicity of the pencil hardness test is its great advantage. The special pencils used for doing the test are made of various combinations of graphite and clays, baked in ovens to harden their compositions. By adjusting the amounts of these two organic materials, the pencils are either very soft or quite hard. Step 1 = Set up apparatus with a 5H lead loaded to either 4 N or 8 N + 0,2 N.
Step 2 = Draw the apparatus across 25mm of an untouched area of the test surface. Step 3 = If the lead has cut a clean path through the coating, repeats steps 1 & 2 reducing the grade of the lead by one step each time until it fails to cut a clean path through to the substrate. Step 4 = Report the hardness of the coating as the hardness of the first lead which failed to cut a clean path through to the substrate. 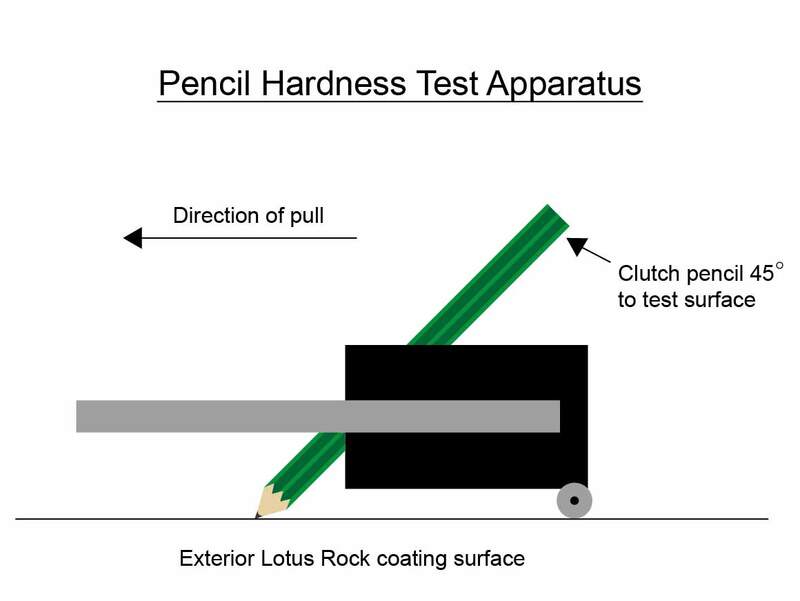 Generally, even with the stricter standard of a fixed pressure of 8.0 Newtons (765g±2%) applied to the exterior coating, a Lotus Rock pan can pass a Pencil Hardness test with a standard of at least 8H hardness. In fact, more often than not, even if a Lotus Rock pan’s outer coating is scratched a bit from the sharp edges of a gas stove, the surface can still be scrubbed with a standard abrasive pad and the scratch will in most cases be removed. This excellent scratch resistance allows a Lotus Rock pan to be used for a much longer period of time, than say a non-stick coated pan, most of which only have a thin, silicone polyester coating on the outside of the pan. For a standard pencil hardness test, without any heat applied to the surface, then a silicone polyester coating can pass at a 4H hardness standard. If, however, the ambient temperature test is included whereby the surface temperature of the pan is increased to 200 degrees, then a silicone polyester coating is liable to become quite soft, and will then only pass a 2H hardness standard. To counter this problem some manufacturers use a sol gel technology ceramic coating instead of a silicone polyester coating, which is usually twice as thick, with a stronger bonded construction. However, even this type of coating can only reach a 6H hardness standard, still below the Lotus Rock scratch resistant quality of 8H. 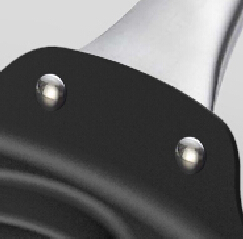 As explained in the previous blog post, Lotus Rock has designed and patented a number of highly eye-catching, ergonomic handles for its various cookware and BBQ items. Handle materials can vary from forged steel, to a natural wood such as acacia or bamboo, to bakelite with soft-touch coating, and lastly a silicone material, molded into a variety of different shapes, such as a lollipop. However, for cookware usage a good handle should not just have an attractive appearance or a comfortable, stay-cool grip, it should also be safe to use as well. One particularly important feature for a handle with a Lotus Rock pan is its strength and secure attachment to the pan’s body. All Lotus Rock pans come with a very heavy carbon steel substrate of 2.0mm in thickness. Although not nearly as heavy as cast iron a Lotus Rock pan is still quite a heavy weight for certain types of cooking utensils, such as a 12” stir wok or a 28cm frying pan. 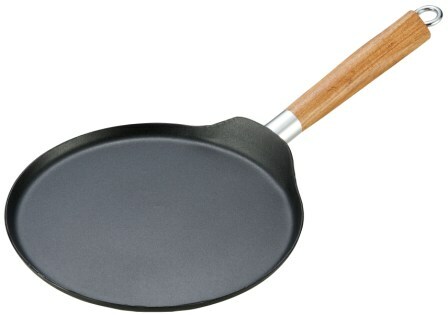 Therefore, a strong, well-designed handle is especially important for a safe cooking experience with a Lotus Rock pan. The kitchenware industry commonly uses a bending strength test, from testing standard BS EN 12983/ 7.5, to assess whether a handle is sturdy and strongly attached enough to a pot or pan. Attach the cookware firmly to the rigid base so that the contacting face of the loading bar is 10mm + 1mm from the end of the handle. Then apply the load, gradually without shock, to the handle, until the load is supported or the fixing system fails. 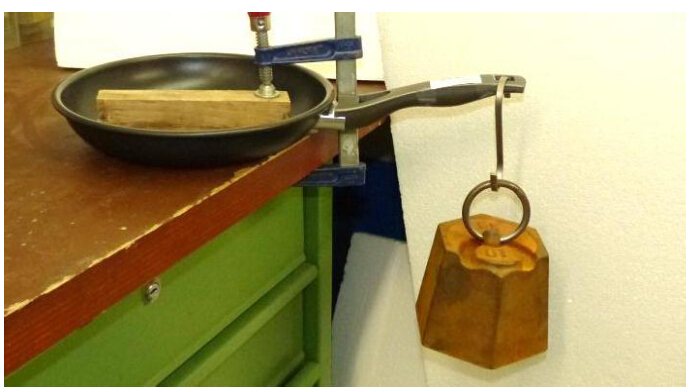 Since Lotus Rock’s was introduced into the market, a number of different types of handles for Lotus Rock pans have been tested according to the BS EN 12983/ 7.5 bending strength test. As shown in the photos above both the Acacia square wooden handle, which uses a riveted attachment method, and the Titlis bakelite handle, which uses a welding attachment method, have both been stress tested with a 10kg weight attached firmly to the end of the handle. Both of these handles passed without any recorded major failure at a SQTS (Swiss Quality Testing Services) testing lab. 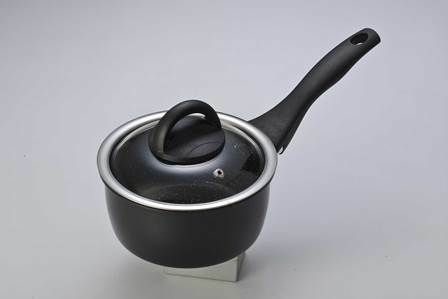 To supplement an excellent Lotus Rock pan, a well-constructed, ergonomic handle is also needed. 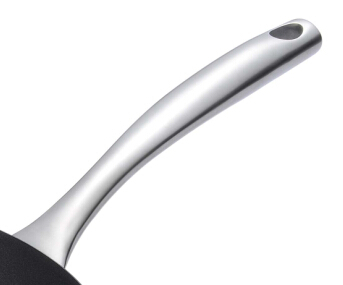 Lotus Rock has designed and patented a number of its own handles, each of which have their own distinct benefits and characteristcs for a particular type of pan shape. 1. Long handle. If the pan is over 30cm diameter (often a stir wok), then a smaller helper-handle will be attached on the opposite side. The large handle facilitates flipping, while the short handle makes it easy to lift. 2. Dual handle. Having a handle on either side is ideal for a large wok, paella pan or braiser, where the amount of food contained will be too heavy to lift if there was just one handle. Riveted. This gives the pan and the handle a strongly constructed appearance. Welded. With no rivets the interior of the pan is easier to clean and some consider it makes the pan more attractive. Molded. Shares the benefits of both types of handles above, however it will transmit heat more easily so some care is needed. Detachable. With this type of handle the pan uses less storage space. It is also very simple for the consumer to attach and detach themselves. 1. Natural wood. This type of handle does not transmit heat easily, so it is safe for the consumer to hold and use during cooking. Its appearance also matches quite well with the design of most stir woks. 2. Professional & Forged. Either polished or brushed stainless steel handles are often seen as a signal that the pan is of a high quality. If well designed, then the handles should not transmit heat too well either. Suitable for use in the oven and on an outdoor grill. 3. Soft-grip. Lotus Rock bakelite handles have soft-touch coating added to them to make them highly comfortable to hold and cook with. 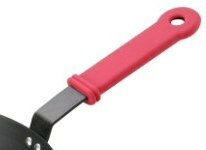 For a more trendy, distinct and eye-catching appearance then a silicone handle can be riveted to a pan. 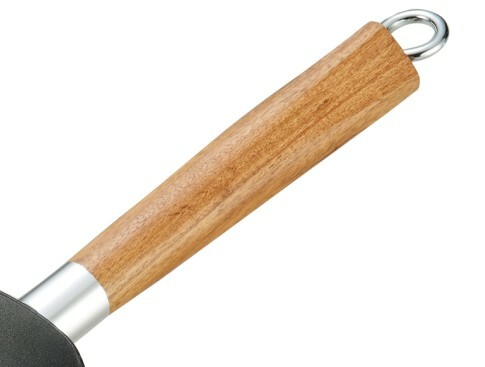 One such handle is the Lotus Rock Lollipop handle, as shown below. This particular handle is suitable for use in the oven and on an outdoor BBQ. The term ‘heavy metals’, is most commonly used to describe metallic elements of higher atomic mass that are toxic at low concentrations. If a consumer product, which is used for contact with food, has high levels of a heavy metal then it can be hazardous to human health. The short term effects of heavy metal poisoning can range from skin irritation to vomiting, but high level exposure can cause anything from liver damage to renal failure. In order to demonstrate that all Lotus Rock pans are free of heavy metals that can leach into cooked food and cause poisoning, an Extractable Heavy Metals Test was commissioned with SGS Testing Services Ltd. 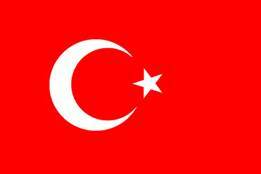 The testing standards were done in accordance with LFGB* (German food law) regulations. 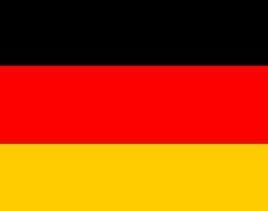 *In September 2005, the new German Food commodity and Feed Law (Lebensmittel – Bedarfsgegenstandegesetz und Futtermittelegsetzbuch –LFGB) replaced the old German Food & Commodities Act (Lebensmittel und Bedarfsgegenstandegesetz–LMBG). Within the kitchenware industry LFGB is considered to have the most stringent test standards for assessing the level at which heavy metals can be extracted from a manufactured product. 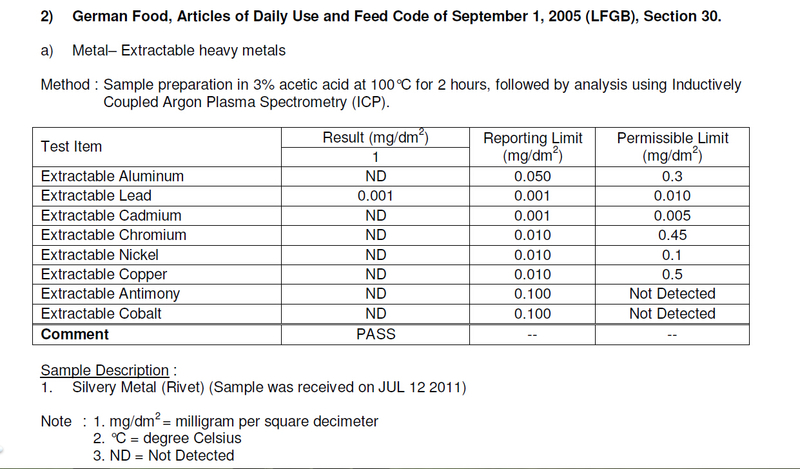 As is shown above, a number of heavy metals were tested for in the Lotus Rock pan using an acid solution, for example, similar to a recipe which might use tomatoes to make a sauce. Some of the heavy metals that were tested for included Cadmium and Mercury; these are toxic to the human body as they undergo bioaccumulation. This means that they are absorbed by the body at a faster rate than they can be removed, and, over a period of time, can cause chronic poisoning, even if the levels found in the environment are low. Other heavy metals, such as Copper, are essential to bodily functions, but at higher levels they begin to alter metabolic processes and become toxic. Other than Cadmium, the other heavy metal considered to be most toxic to human health is Lead. High levels of exposure to lead can have numerous, severe health problems. These include neurological damage and damage to organs such as the liver and kidney. 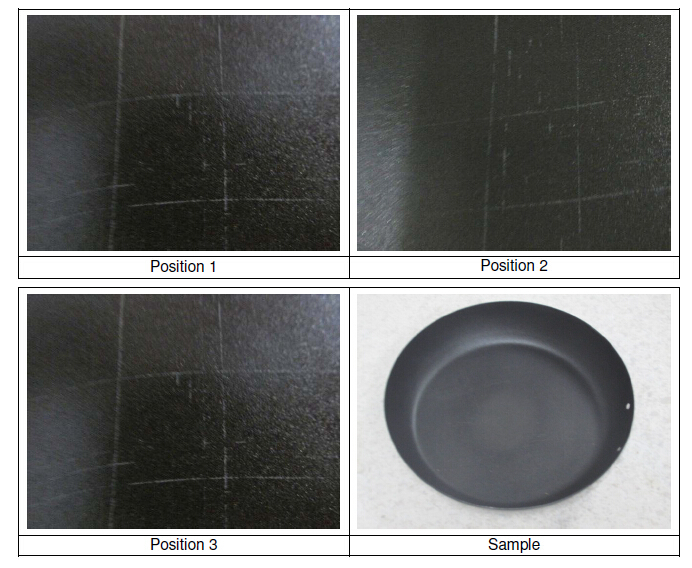 The previous blog post described how a migration test can be done to test the surface reactivity of a cookware pan. The benefit of a non-stick coating on a pan is that it provides a non-reactive surface whereby all kinds of ingredients, whether they are highly acidic or not, can be used for cooking without creating any undesirable colors and/ or flavors. Generally speaking, most non-stick coatings contain a substance called PTFE. This gives the coating its non-stick release and has been proven to have the lowest coefficient of friction (CoF) of any known solid. In other words, the majority of materials do not stick to a PTFE-based non-stick coating. Therefore, because of its excellent non-stick release and non-reactive surface, a PTFE-based non-stick coating should pass a standard BS EN 1186-1: 2002 migration test quite easily. However, although PTFE- based coatings do undoubtedly provide a highly non-reactive surface for a cookware utensil, they also have some significant disadvantages; one of these is a tendency of PTFE-based non-stick coatings to peel off. Within a non-stick coating PTFE does not bond well to itself, and so by and large it doesn’t have a very stable construction. 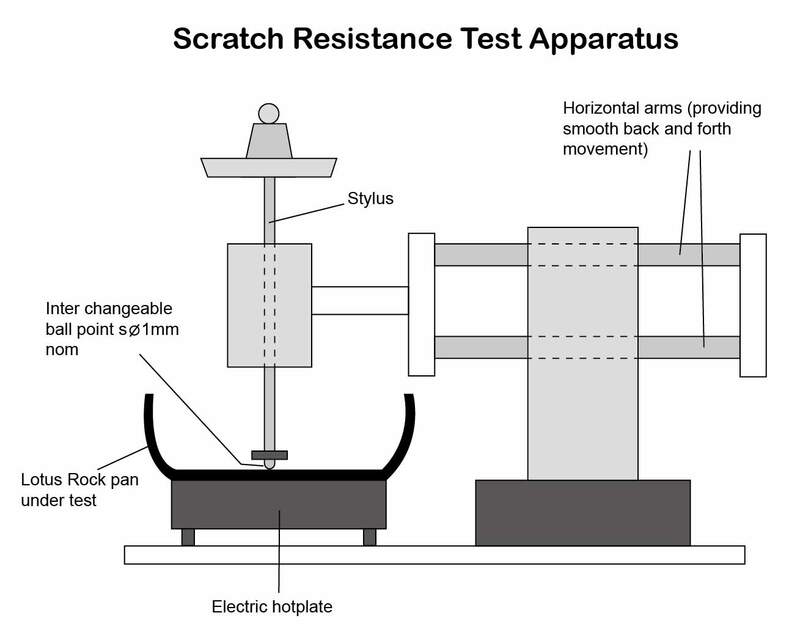 This weak coating structure is degraded through general scratching with a utensil, and also by rubbing it with a standard abrasive cleaning pad. Moreover, PTFE based coatings are generally quite thin, roughly 15-20 microns in thickness. This thinness makes PTFE-based coatings quite liable to break up and expose the substrate below it, such as aluminum or steel, to foodstuffs or oxygen which could produce some undesirable reactions and damage the quality of the cookware utensil. Lotus Rock, on the other hand, contains no PTFE or any other non-stick chemical within its coating. 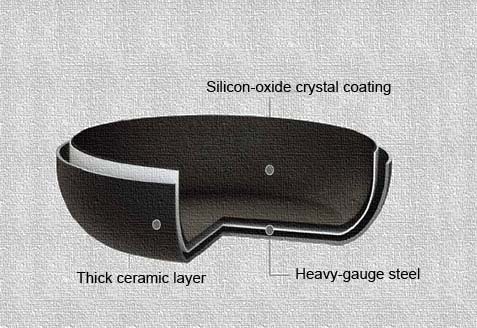 On both the interior and exterior of all Lotus Rock pans is a thick ceramic layer, which is up to 100 microns thick. This not only provides excellent protection to the steel substrate below it, but the strongly bonded construction of the ceramic layer also ensures that all Lotus Rock pans have outstanding scratch and abrasion resistance. There are two well-known tests within the kitchenware industry, from the BS 7069 : 1988 British Standard Specification for Cookware, which can demonstrate whether or not a cookware utensil has excellent scratch and abrasion resistance. 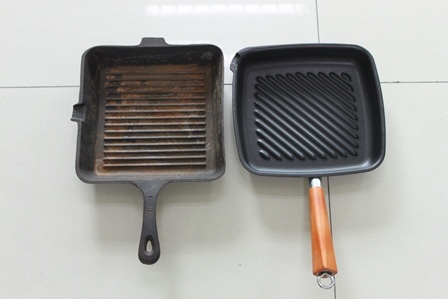 Both of these tests have been used on a Lotus Rock frying pan. Mount the item of cookware under test rigidity on the reciprocating support and apply the loaded abrasive pad to the non-stick surface, lubricate the surface by the addition of domestic washing-up liquid. Keeping the loaded abrasive pad stationary, move the reciprocating support backwards and forwards over a distance 50mm+2.5mm. Continue for 250 cycles. Renew the abrasive pad at 50 cycle intervals. Place a quantity of corn oil, sufficient to just cover the base of the article into it. Heat the vessel to a temperature of 220+5C and apply the loaded stylus to the heated surface. Move the loaded stylus across the surface for a distance of not less than 80mm in 1+0.1s. One of the significant benefits of a Lotus Rock pan is the high durability of the pan’s surface. Unlike general non-stick PTFE-coated pans, Lotus Rock is metal utensil safe, which means a stainless steel spatula or knife and fork can be used on the surface without any concern that the quality of the coating will be impaired or the non-stick release ruined through scratching. 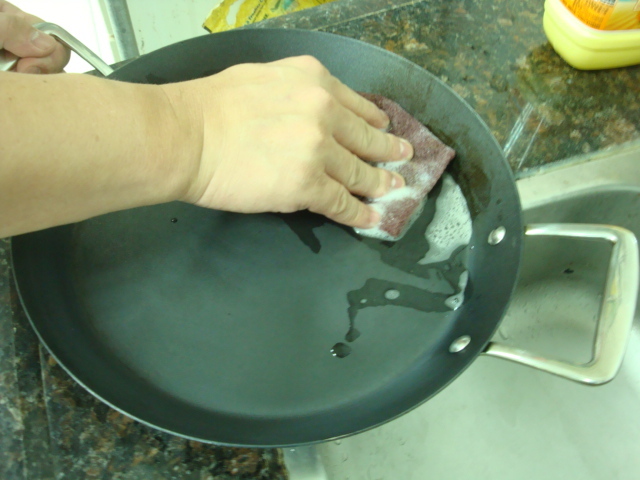 Moreover, for cleaning purposes a Lotus Rock pan can, unlike with a general PTFE non-stick coated pan, be scrubbed and washed vigorously with a standard abrasive cleaning pad without causing the coating to peel off. The introduction of a new, highly innovative product into the market often generates considerable excitement and interest. However, at the same time, there is naturally also some concern as to whether this new product is safe to use and not hazardous to human health. A famous example of this was when PTFE-coated cookware was first introduced in the 1960’s. This new, technological breakthrough in non-stick coating for cookware was a huge hit among consumers who wanted an easier, and more hassle-free way to cook daily staples, such as eggs. But in the late 90’s it was found that the emulsifier used to spread the PTFE coating evenly around the pan, called PFOA, caused birth defects in laboratory animals. This substance was subsequently banned by the Food & Drug Administration (FDA) of USA, and by government departments in many other countries. Since its creation a number of years ago, Lotus Rock cookware and bakeware has been sold throughout the world, in countries such as USA, Australia, Israel, Turkey, South Africa and India. 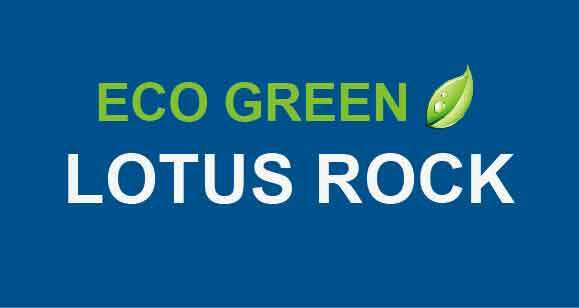 Part of the reason why so many retailers and wholesalers in these countries have enthusiastically sold and recommended Lotus Rock has been the numerous testing reports, produced by reputable companies such as SGS and TUV, which have demonstrated Lotus Rock’s safety for use in the kitchen. The kitchenware industry commonly uses a migration test to assess the reactivity of a product’s surface. Cookware materials that are highly reactive are those which tend to have chemical reactions with other substances around them. Highly reactive materials include iron, copper, aluminum and carbon steel. Highly reactive cooking surfaces are disadvantageous for certain ingredients and ways of cooking because the reactions can produce undesirable colors and/or flavors. No Lotus Rock pans are highly reactive with any ingredients because they have a thick non-reactive ceramic layer on both the interior and exterior of the 2.0mm carbon steel substrate. Further, the interior of all Lotus Rock pans has an additional top coating of silicon-oxide crystal, which is permeable to cooking oil but impervious to other substances. Thus, highly reactive ingredients such as tomatoes, spinach, wine and lemon juice can be used on Lotus Rock pans without creating any chemical reactions. Rectified olive oil, for general high heat cooking methods, such as frying, sautéing, stir frying, browning and grilling. 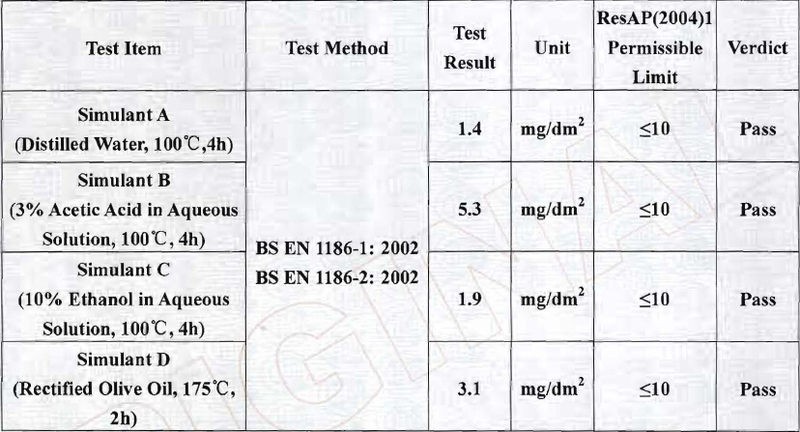 The table below is the result of just such a BS EN 1186-1.2 2002 test, one which was performed on a Lotus Rock frying pan, grill pan and saucepan. The testing standard for each simulant is expressed in milligrams of extracted of deposited material per decimeter squared. As is clearly demonstrated above, each simulant recorded an extracted quantity well below the permissible limit of 10 milligrams per decimeter squared. 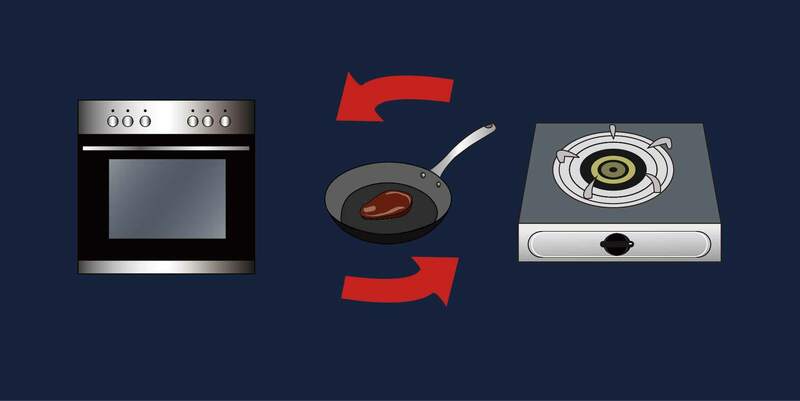 The above BS EN 1186-1: 2002 migration test clearly proves that a Lotus Rock pan can be used for a variety of cooking methods, such as boiling, frying and deglazing, and can be cooked with a variety of different ingredients, without any concern that the an unwanted reaction might take place with the pan’s surface. Strong construction. With a heavy-gauge steel substrate and a thick layer of ceramic on both the interior and exterior of all pans, Lotus Rock pans will not warp or disfigure easily. Carbon steel is a very dense material, and the 2.0mm gauge used in all Lotus Rock pans makes them strong and long-lasting,* unlike pans made with aluminum, a material with a very low density, which can be dented and disfigured quite easily, for example, if accidently dropped on the kitchen floor. 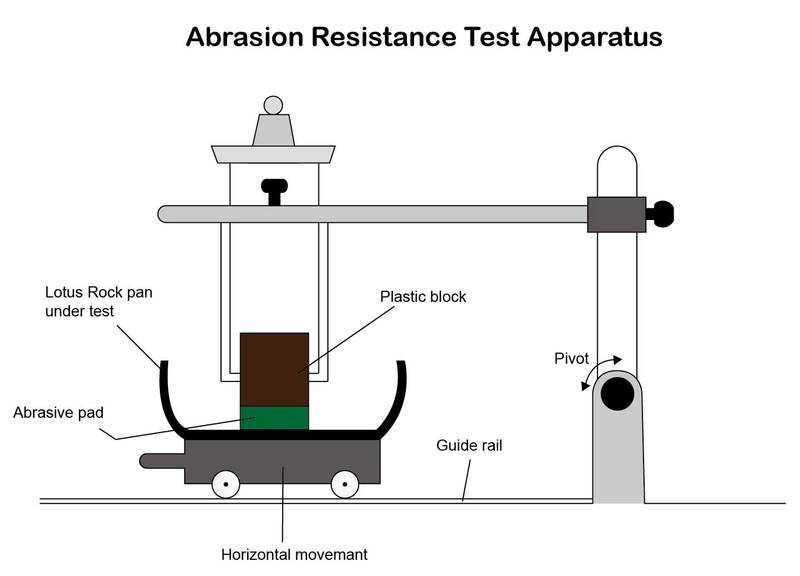 Abrasion resistance. 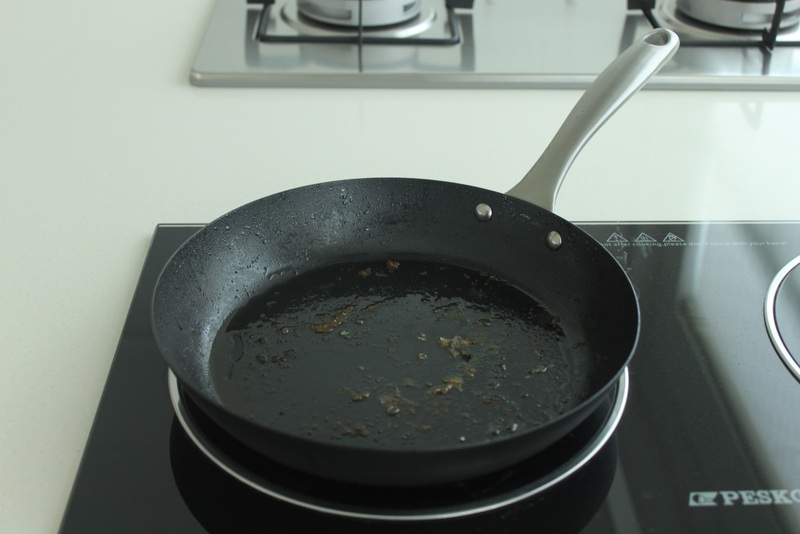 A common complaint about non-stick pans is that the coating often peels off quite easily, making the pan unusable and requiring its replacement. A Lotus Rock pan, in contrast, is metal utensil-safe. The coating is extremely hard and can withstand scrubbing with a 3M pad for a long period of time. Natural non-stick release. A non-stick coating with either PTFE or ceramic sol-gel technology will, depending on its quality, eventually become a ‘stick’ pan. Once the non-stick release has worn out the pan will become difficult to clean, and the consumer will most likely discard it. In contrast the natural non-stick coating on a Lotus Rock can be renewed by simply wiping oil onto the surface before each use. This method gives the pan a much longer lifetime than a general non-stick pan. * If the Stable Concave design is included a Lotus Rock pan’s lifetime is extended even further In addition to its durablity, a Lotus Rock pan can also because of its fast heating effect be labelled eco-green. Many professional chefs prefer carbon steel for cooking utensils such as stir woks, crepe pans, paella pans and frying pans because it heats up very quickly. This is especially so compared to other commonly used metal substrates such as aluminum or stainless steel. If the steel for a pan is produced at a thick gauge then it can heat up quickly, but also evenly across the pan’s surface. The main environmental benefit of a faster heating effect is that it saves energy from the stove top burner, thus reducing CO2 emissions. .
As noted previously here, all Lotus Rock pans have an excellent high heating effect, a desirable quality which helps produce delicious tasty food. What thermal properties give a cooking utensil an excellent heating effect? Well, first, the pan must heat up quickly when placed on the heat sources; second, it has to be thick enough to heat up evenly across its surface; and third, it needs a large enough thermal capacity to minimise loss of heat when food is added to the pan. Let’s start with the Lotus Rock pan’s prompt response to heat. Although carbon steel does not heat as evenly as aluminum, it does heat up much more quickly. Some methods of cooking require the pan to have reached a certain temperature before it is used; for example, browning, which is best done on a pan with a temperature of 180 degrees (this is the temperature when the Maillard Reaction begins to take effect). 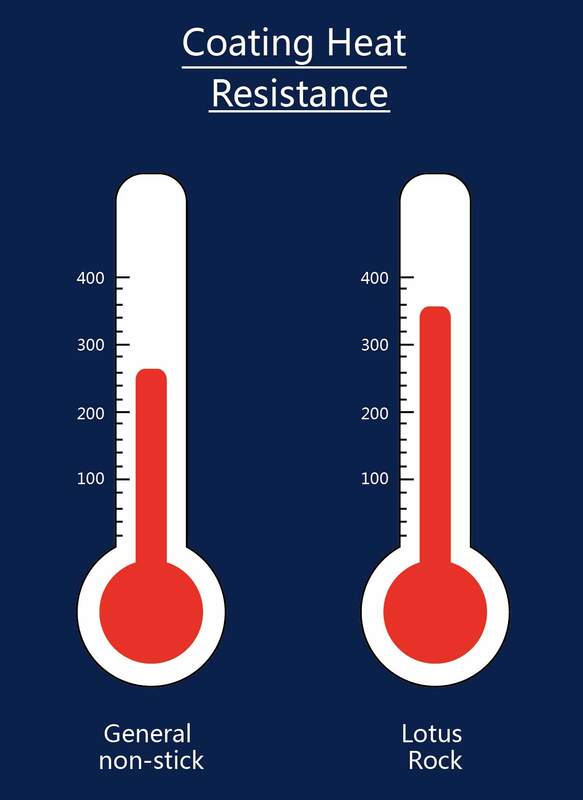 If an impatient cook starts before the pan reaches this temperature then the meat or vegetables being seared might still be browned but will have lost a large amount of moisture, making it dry and un-appetizing. However, although carbon steel heats up quickly, a thin gauge of steel will do so unevenly, heating up most quickly in the centre of the pan. This not only creates a hot spot, causing uneven cooking, but will eventually warp the pan and give it a convex shape, causing oil and other liquids to slide to the edges. In order to disperse the heat more evenly around the pan all Lotus Rock pans are made with 2.0mm gauge steel. As is shown in the diagram below, a thicker gauge broadens the area at which the heat reaches the surface of the pan. So with carbon steel as its substrate Lotus Rock pans can not only heat up very quickly but can also, due to the steel’s thick 2.0 gauge, provide a more dispersed heating effect so that the food is cooked evenly. It thus meets the first and second criteria for an excellent high heating effect. What about the third criterion? What happens to the heating effect of a Lotus Rock pan when food is added? 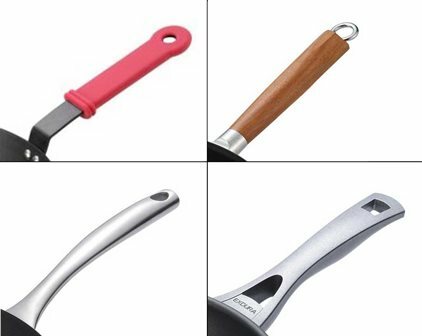 If you were to compare all the main metals for cookware usage, you would find that carbon steel is among the most dense (three times more dense than aluminum, for example), and as we know, Lotus Rock has a very heavy carbon steel gauge. This extra mass and space in its substrate means a Lotus Rock pan has a high heat storage capability, an essential component for an excellent heating effect. When a steak is placed on a grill pan to impart that smoky, chargrilled aroma, or a large quantity of vegetables are quickly added to a stir wok, the high thickness and density of a Lotus Rock pan will minimiss heat loss. So instead of steaming in their own juices, the steak and vegetables will sizzle and heat up quickly and evenly for a delicious and crispy taste. A second factor facillitating heat retention is the thick layer of ceramic on both the interior and exterior of all Lotus Rock pans. Most coatings on cookware sold throughout the world today have a thickness between 15-30 microns; the ceramic layer on Lotus Rock pans is in contrast around 100 microns thick. This thick coating increases the heat retention capability of all Lotus Rock pans due both to its extra mass and poor heat conductivity. Ceramic does not conduct heat very well, but it is good at storing heat – this is why it is often used for oven dishes. So when food is added to an already well heated Lotus Rock pan the temperature should not drop significantly, in part because of the heavy gauge carbon steel substrate but also because of the thick ceramic layer on both the interior and exterior of the pans. Thus the very thick material of a Lotus Rock pan is perfect for high heat cooking methods, such as for sautéing, searing, grilling and stir frying. 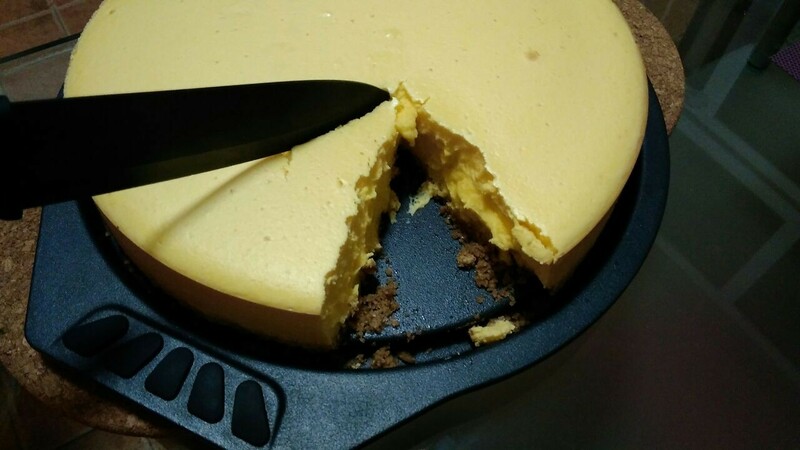 Professional-quality Lotus Rock spring form cake pan releases flawless cheesecake, torte, coffee cake and frozen dessert. The pan’s rim springs free from the base when the clamp is released, so you can remove baked goods without breaking. Easy to grip handles allow easy movement to and from the oven. Natural, highly durable non-stick coating, with a metal utensil safe surface – suitable for carving a cake with a sharp, steel knife for serving directly on the table. Lotus Rock bakeware’s hydrophobic surface is easy-to-clean and with excellent colour stain resistance. Heavy gauge steel substrate, with a thick layer of ceramic on both the interior and exterior of the pan distributes heat quickly and evenly for consistent baking results. Easy-close latch creates a leak-resistant seal, keeping dessert intact. Spring form design is particularly helpful when releasing items that can’t be inverted, such as cheesecake, quiche, deep-dish pizza and layered frozen desserts. Rolled edges add rigidity to retain pan shape. Raised base creates a perfect seal and serving platter. Thick-walled construction prevents warping or bending. The premium Lotus Rock bakeware will not rust, chip, flake, peel or blister. Natural, durable nonstick coating ensures easy release and clean up. Ceramic coating on base is metal utensil safe. Lotus Rock bakeware is oven-safe to 550 F and broiler-safe. PTFE- and PFOA-free round springform pan is nonreactive to acidic or dairy ingredients and will not affect the flavors of foods or discolor over time like natural metals. What oil should be used with Lotus Rock? One of the significant benefits of a Lotus Rock pan is its amazing heating effect, for example, it is perfect for searing a delicious brown crust on meat and vegetables. 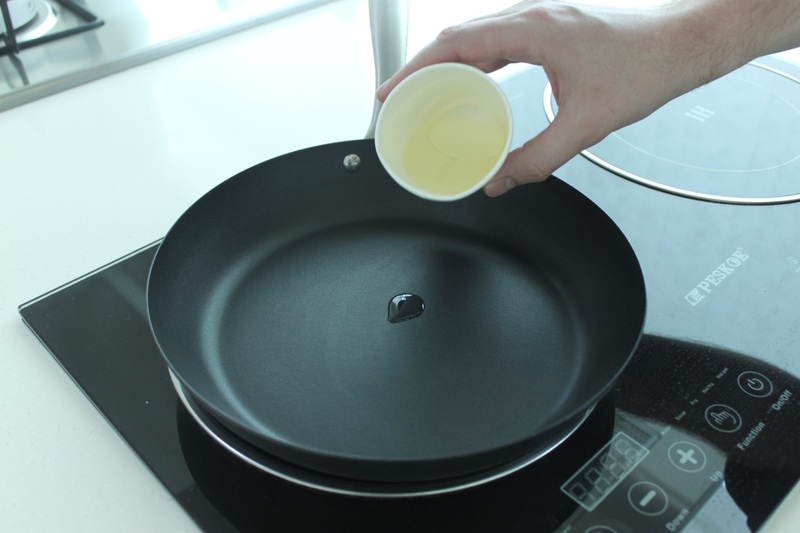 However, if the wrong cooking oil is used for this heating effect then a dark build-up on the surface of the pan can appear, in most cases this is because of oil carbonization. 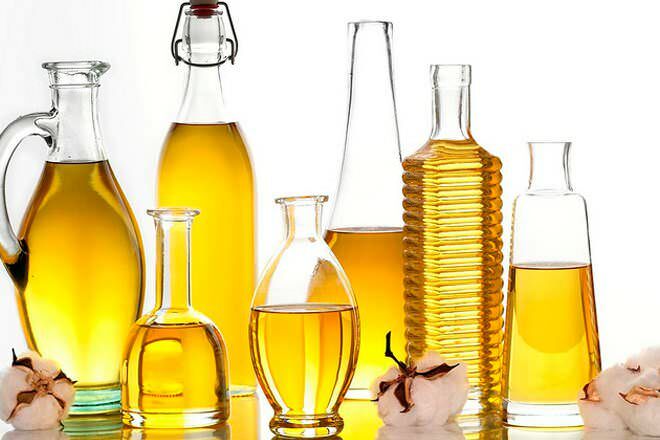 This occurs over time when cooking oil is used above its smoke point – extra virgin olive oil or butter is the usual culprit. Oil carbonization can impart two particular defects to a Lotus Rock pan, first it makes it very difficult to clean, the pan no longer has a hydrophobic surface to assist for easy cleaning. 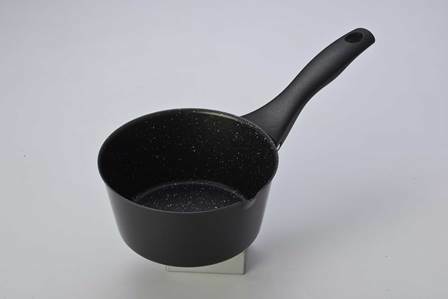 The second difficulty with oil carbonization on a Lotus Rock pan is that it stops any cooking oil from permeating the lipophilic surface of the silicon-oxide crystal coating – thus making the pan no longer non-stick. Using a cooking oil with a high smoke point is very important, as it can give the oil time to seep into the Lotus Rock pan’s surface and provide a non-stick release for cooking, before it can carbonize and scorch on the pan. Lotus Rock recommends vegetable, canola or extra-light olive oil for most cooking needs. Unlike olive oil, for example, which should never be used because it has a very low smoke point, these three oils have quite a high smoke point and so are more suitable for the fast and high heating effect of Lotus Rock pans. In addition to using the correct cooking oil, after each use a Lotus Rock pan should be scrubbed thoroughly with a grease fighting dish soap. This will stop too much oil from remaining on the pan, which might later become quite sticky and therefore scorch the pan when it is next used. 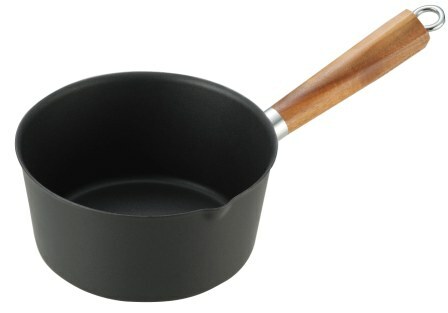 What if my Lotus Rock pan already has an oil carbonization mark on it? 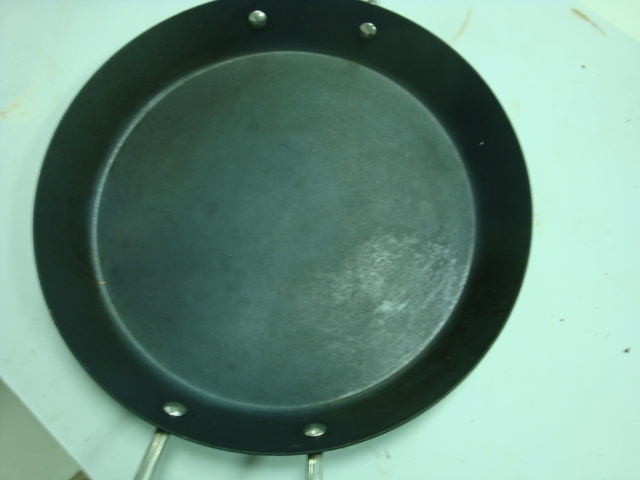 A lot of cookware manufacturers recommend using baking powder and water to remove oil carbonization marks on a pan. However, from our own testing we have found this to be not very effective at completely removing the marks from the pan. 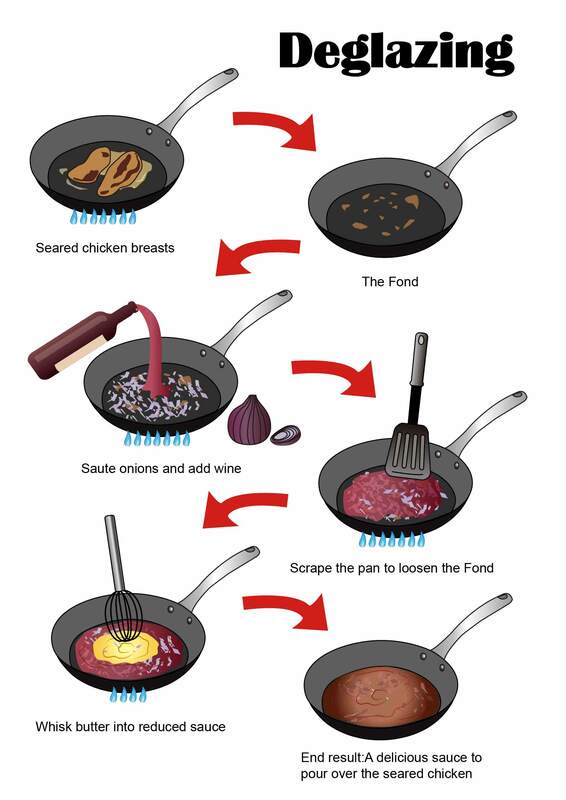 Instead we recommend using the procedure as described here to purify the pan and renew the non-stick release. As was noted previously here, Lotus Rock does not have a chemical non-stick release. Unlike most other famous non-stick coated pans, such as Calphalon, Scanpan and Tefal, which contain a chemical compound called PTFE for non-stick release, a Lotus Rock pan has instead a natural, durable non-stick release, which is PTFE-free. When a general, PTFE non-stick coated pan loses its non-stick release, it cannot be renewed – it becomes obsolete. 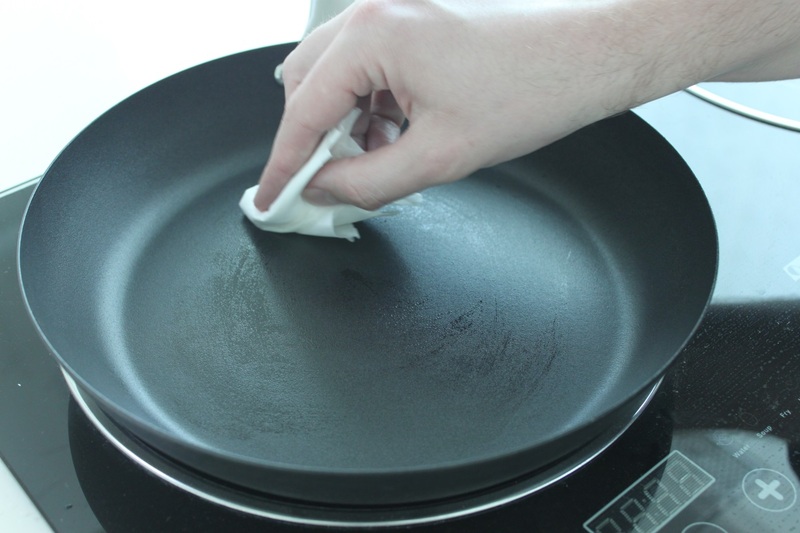 With no non-stick release a PTFE-coated pan will become harder to clean and the coating may start to peel off, making the pan unfit and hazardous for further use. However, if after some use, food begins to stick to a Lotus Rock pan and it becomes harder to clean then it can, just like with uncoated cast iron or steel, be “re-seasoned”, or to put it in a more appropiate way for a Lotus Rock pan, the non-stick release can be ‘renewed’. *Please note, that in addition to the steps shown below, the consumer must still wipe some oil onto the surface of a Lotus Rock pan before each use. Fill a Lotus Rock pan half full of water and heat until boiling. Continue boiling the water for around 10-15 minutes, until the residual substances inside the surface of the pan are released. Some gentle scrubbing may need to be done to help complete this process. Once finished, pour the water out of the pan, clean it and then dry. Fill the pan with oil about 1cm deep and heat the oil until it starts to smoke. Then, carefully pour the oil out of the pan into a suitable container. As is shown in the photos above, the Lotus Rock pan used in this test has a special feature included – the Stable Concave design. For more information about this please read here. Does a Lotus Rock pan need to be seasoned? The metal substrate for all Lotus Rock pans is heavy gauge carbon steel. There are numerous reasons why Lotus Rock uses this substrate instead of more commonly used metals for cookware, such as aluminum or stainless steel, as explained here. Traditionally for cookware usage carbon steel is often sold as uncoated, with just a protective coating on it which needs to be removed prior to use. 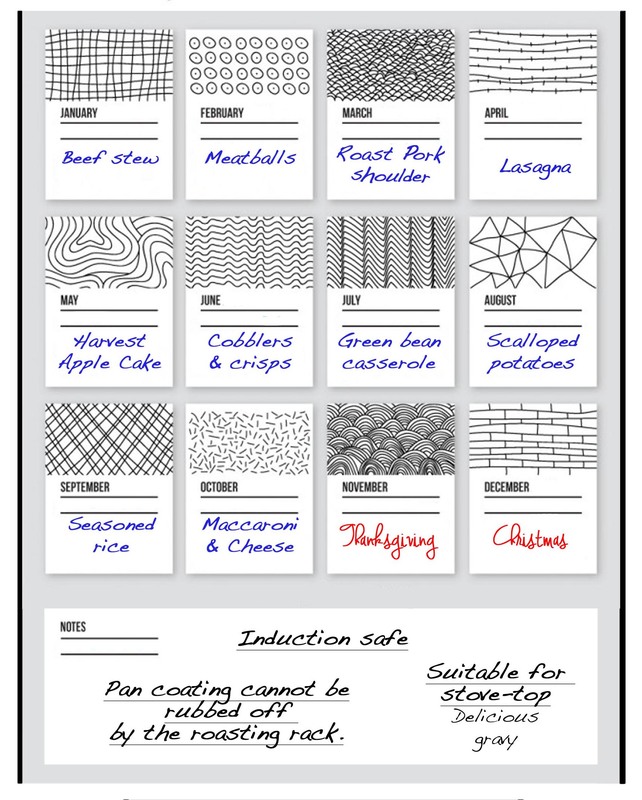 Generally, the instructions on the packaging for uncoated carbon steel cookware items such as stir woks, frying pans and paella pans advise the consumer to season the pan before use. Regarding the first reason to season a carbon steel pan – corrosion resistance – this is not necessary for Lotus Rock. This is because on both the interior and exterior of all Lotus Rock pans there is a thick ceramic coating. So, as long as the Use & Care instructions are followed properly a Lotus Rock pan will not rust because the coating prevents the surface of the steel from any form of oxidation. Is seasoning needed for non-stick release? For the second reason to season a carbon steel pan – the non-stick release – this is also not necessary because all Lotus Rock pans have a silicon-oxide crystal coating. As explained here, this lipophilic coating gives all Lotus Rock pans a natural, durable non-stick release. 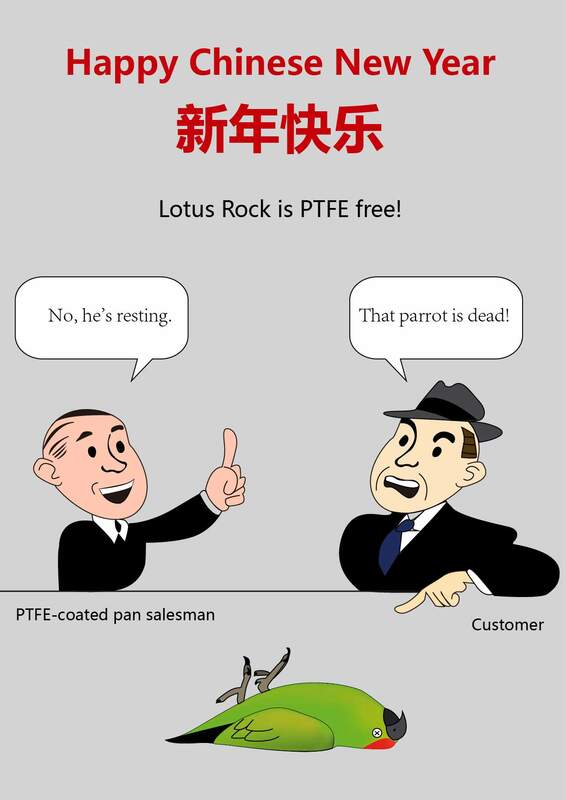 While most non-stick pans on the market today have PTFE included in their coating to give them a non-stick effect, all Lotus Rock pans in contrast are PTFE/ PFOA free. The non-stick release for Lotus Rock comes from the consumer adding oil themselves to the pan prior to cooking and letting it permeate the silicon-oxide crystal coating. However, although both seasoning and the process explained above do involve heating oil on an iron pan, the latter cannot be termed as seasoning for two reasons. First, seasoning is a reaction between the oil and the steel surface. With all Lotus Rock pans, cooking oil is never in contact with the heavy gauge steel substrate; instead the added cooking oil rests within the silicon-oxide crystal coating and on top of the thick ceramic coating. The second reason is that for a carbon steel pan to be properly seasoned the oil needs to react with the steel surface and be polymerized. For seasoning to be successful the oil needs to surpass its smoke point, and then the chemical composition of the oil will alter to form a solid, hard film over the steel. For a Lotus Rock pan to have an effective and potent non-stick release or for that matter any other non-stick pan to be maintained well, the cooking oil should never be allowed to polymerize. If done so, it will form a barrier between the food and silicon-oxide crystal coating, which will impair the non-stick quality of the pan. Although a seasoned steel pan undoubtedly has many benefits, to continually re-season a pan can be for some quite a hassle. Moreover, a seasoned pan does have some limitations when it comes to cooking. 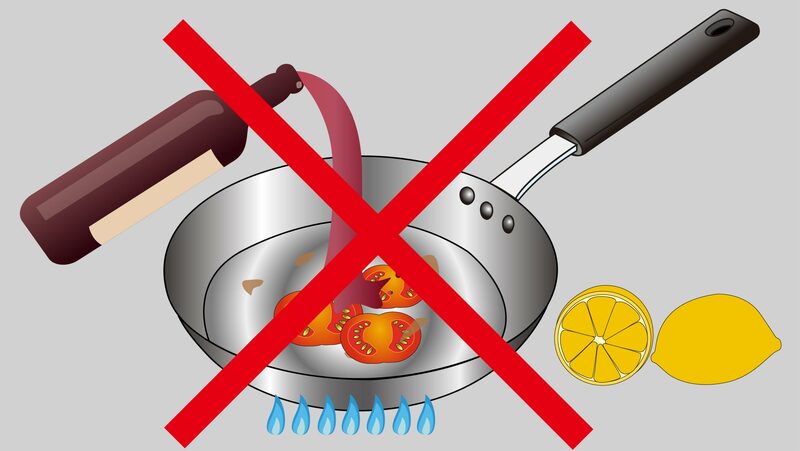 For example, ingredients which have are highly acidic cannot be used, such as lemon juice or tomatoes, because they will remove the non-stick patina which with continued use of fat for cooking occurs naturally on the pan. Another difficulty with a seasoned pan is that it is not suitable for de-glazing. Once the fond has built up on the pan after searing meat, generally an acidic liquid such as wine or broth is added to create a sauce. However, as has already been explained, the acidic nature of these sauces will react with the steel surface and impair the non-stick quality of the pan. The silicon-oxide crystal coating of a Lotus Rock pan on the other hand is much less troublesome for cooking with. All kinds of acidic ingredients can be used with a Lotus Rock pan. So, for instance, a spaghetti Bolognese can be cooked on a Lotus Rock pan without any detriment to the quality of the non-stick release. In addition, a sauce such as gravy can be prepared from the fond after some chicken breasts have been seared on the stove top. 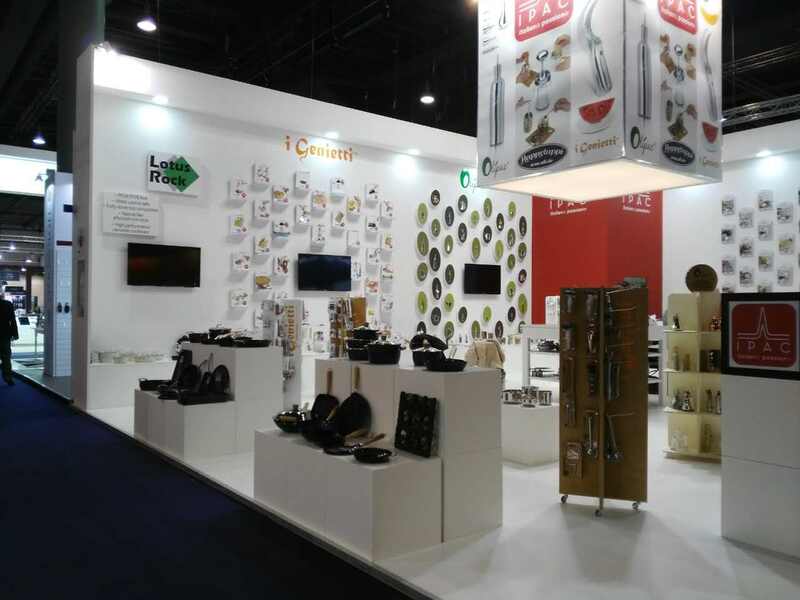 Generally, in the market place today carbon steel cookware, such as with famous brands including DeBuyer or Rosle, is sold uncoated. In order to protect these pans from rust, and to give them a non-stick release, the consumer is advised to season them before use. Seasoning involves heating oil to a high temperature on a steel pan, passed its smoke point. During this process the pores of the steel open and while this is happening the polymerized fat creates a hard, glassy film between and over the steel surface. With this treatment the steel pan is now not only protected from rust, but also conditioned with a non-stick effect. Although Lotus Rock does use carbon steel, it does not need to be seasoned because on both the interior and exterior of the pan is a thick ceramic coating protecting it from oxidation. This coating, just like the polymerized fat of a seasoned pan, provides effective corrosion resistance. However, unlike an uncoated steel pan, a Lotus Rock pan doesn’t give the consumer the hassle of re-seasoning the pan after each use. The thick ceramic coating on Lotus Rock is metal utensil safe and is highly durable for long lasting protection from rust. In addition, a Lotus Rock pan also doesn’t need to be seasoned to create a non-stick release because on top of the thick ceramic interior is a silicon-oxide coating. When oil is added to a Lotus Rock pan it permeates the lipophilic surface of the silicon-oxide coating to create a natural, non-stick effect. A significant advantage of the silicon-oxide crystal coating over the non-stick patina of a seasoned pan is that it is safe to use with acidic ingredients or sauces, so the consumer can use the pan for a greater variety of cooking methods. As was explained in the blog post “High heat develops flavor” browning, the Maillard reaction is the source of deep flavors in meat. However, what is not commonly known is that after the meat has been sautéed or pan-seared, the caramelized browned bits that remain on the bottom of the pan, known in French as the ‘fond’, can be used to create a delicious sauce. This process, known among professional chefs as Deglazing, is actually relatively simple. First, the meat and any excess fat must be removed from the pan. 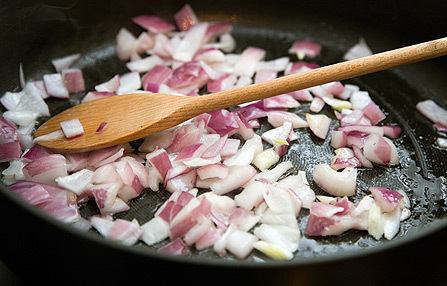 Then an aromatic (a shallot, garlic or onion) is sautéed, after which a liquid (broth, wine, cider or beer) is added. Many professional chefs consider wine the best liquid for deglazing because its acidity detaches the fond from the pan and immerses it within the sauce more quickly. In order to help the process along a spatula is often used to scrape the bottom of the pan to loosen these brown bits further. The fond will then dissolve into the sauce, adding complexity and depth. Later the liquid is reduced to concentrate the flavours of the sauce, and a little butter is whisked into the reduced sauce to give it some body. The finished sauce is then poured over the already well-browned meat to add extra flavor to an already crispy, succulent crust. What is the best pan for Deglazing? Deglazing doesn’t work well on non-stick cookware, because the non-stick coating prevents food sticking to the pan and creating a fond. Stainless steel, on the other hand, is good because seared meat, such as steaks, chicken or pork chops, will stick to the pan and produce the fond needed to create a sauce. However, as was explained here, stainless steel does not conduct heat quickly to the surface of the pan, so it does not reach the necessary temperature quickly enough to produce large amounts of caramelized browned bits on the bottom of the pan. 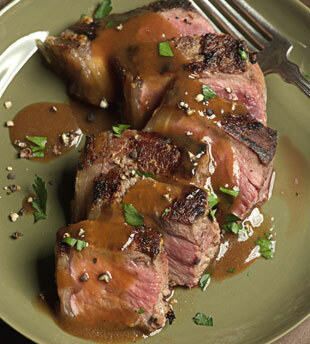 The resulting fond is therefore not as dense and flavourful as it would be if the meat had been browned more intensely. Cast iron has an excellent heating effect for browning, but is not suitable for deglazing if the pan is uncoated, because any acidic liquids such as wine used to create the sauce will react with the iron to remove the natural non-stick patina which is formed on the pan’s surface. Enameled cast iron pans can be used instead, but are extremely heavy and awkward to use. A Lotus Rock pan is perfect for both searing meat to produce a crispy, well-browned crust, and for deglazing afterwards to create a delicious sauce. The heavy-gauge steel construction and thick ceramic interior mean a Lotus Rock pan can sear or sauté a piece of meat quickly and evenly for excellent browning. If no cooking oil was added before cooking (Lotus Rock’s non-release works best if fat is wiped onto its lipophilic coating) an abundance of brown bits should remain on the pan. This fond can then be used with an aromatic, a liquid and a thickener, for example an onion, wine and butter, to create an intensely flavourful sauce with a lot of body.